Spring this year is very hectic time in our organisation, because we are hosting many young people. 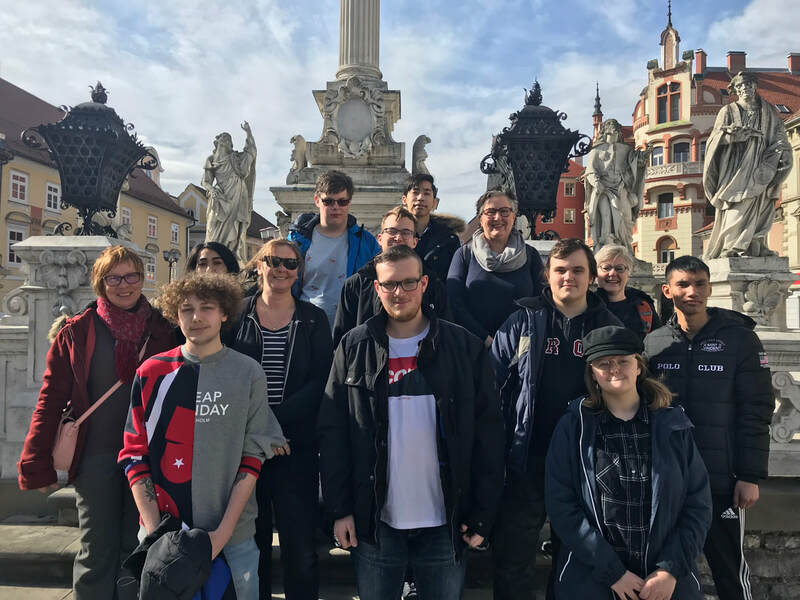 Our next group, which came to visit Maribor is from Germany, from our long-standing partner GEB. The youngsters are studying nursing and child care and they will do their internship in kindergartens in our city. 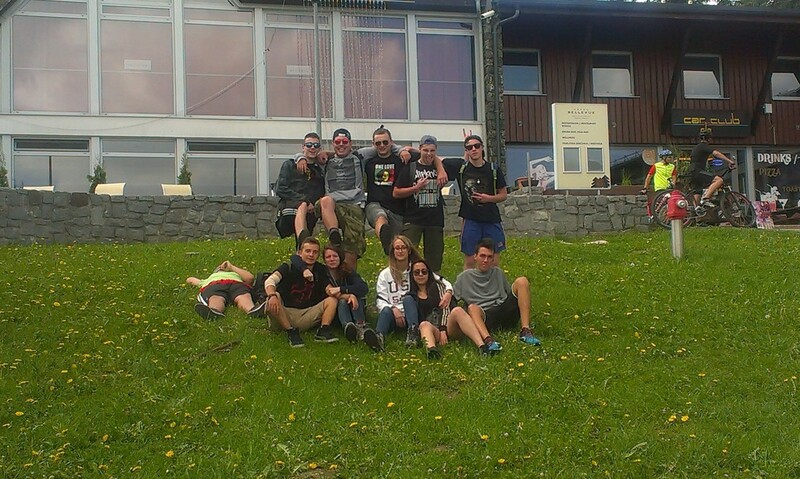 The are already after tour around Maribor and they got cultural preparation. Although they are going to stay just two weeks, we wish them very fruitful time full of professional experience. 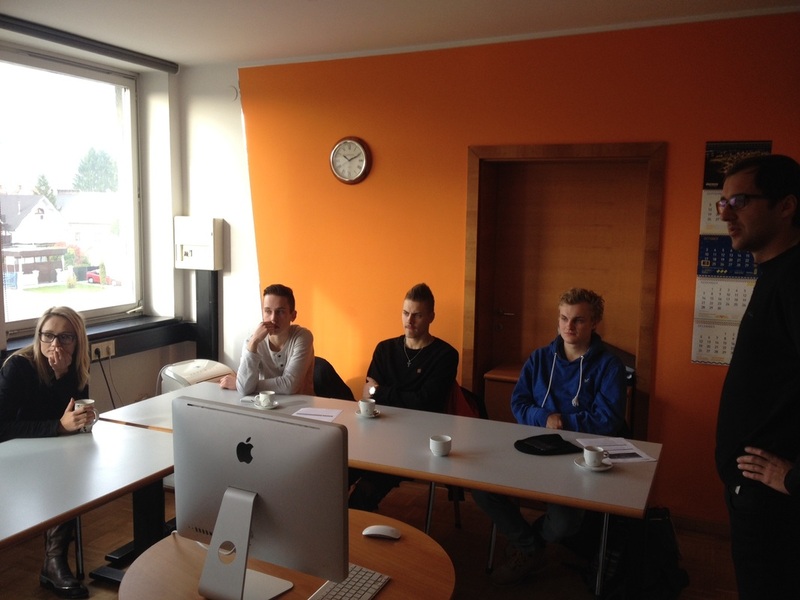 Our partners from Vestum, Sweden, came for a job shadowing in our organisation for a very first time. We were discussing possibilities of our future cooperation, they got to know our policies and values. An important topic of conversation were also the profiles of their students. 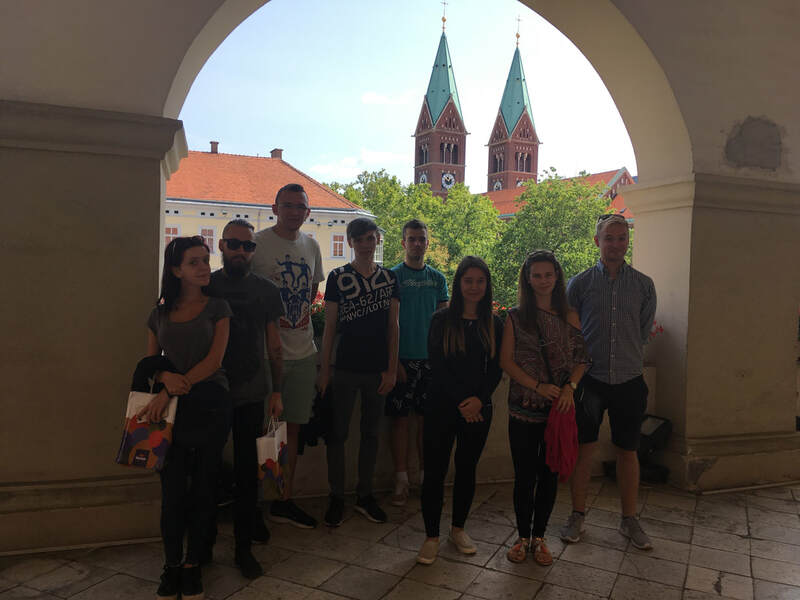 We showed them an advantages of Maribor as a place to make internship and also we were visiting local hosting companies and student dorm. Since couple days we are hosting first group in this year from our Italian partner Cooperativa Sociale Kara Bobowski. Both girls will stay wit us following three months and they will have opportunity to increase their professional skills. 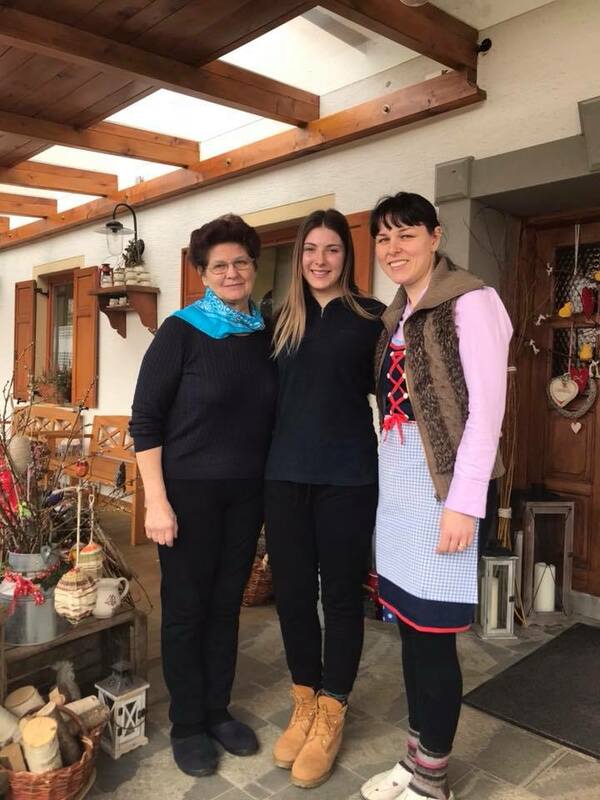 Gaia has started work in Konjeniški klub Karlo because her great passion are horses and Alessia has started internship in Dveri Pax because she is interested in wine production. 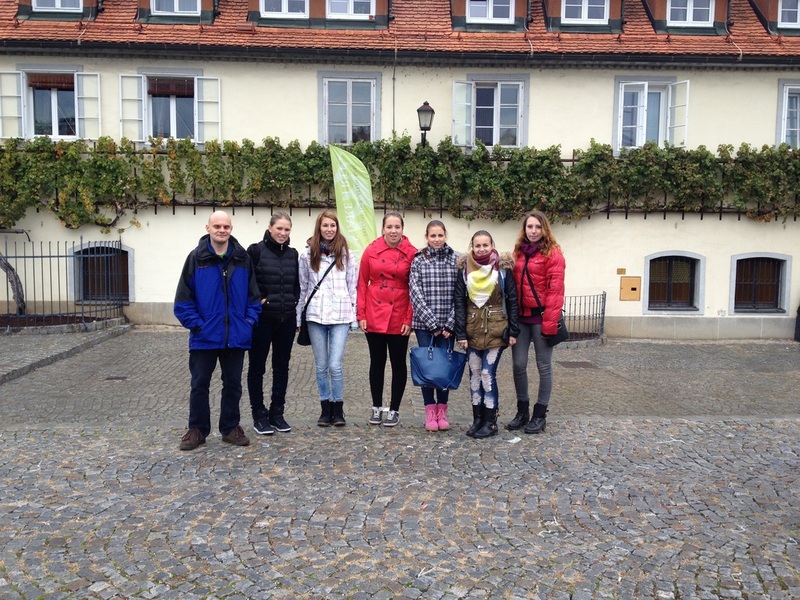 We showed them already Maribor and we hope that they would like to discover more of Slovenia just by themselves. We wish them good time and a lot of new experience in work places. Since 6th of April we are hosting first Irish group this year. 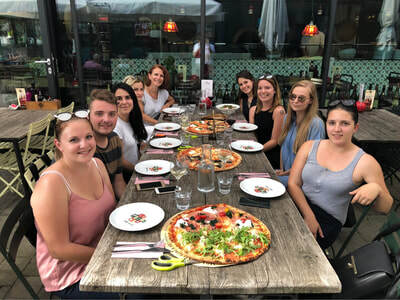 They are staying in Maribor three weeks and they will do an internship in their professional fields as: since and laboratory technique, social care and childcare programe . 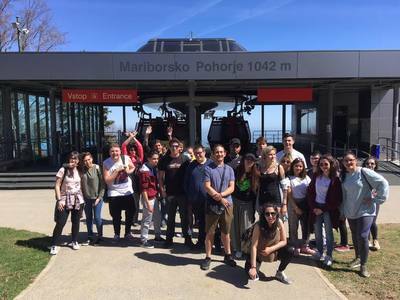 We've introduced them already our city and Pohorje, which we were visiting last weekend and now they will have opportunity to discover Slovenia more by themselves. We wish them nice and productive time here. 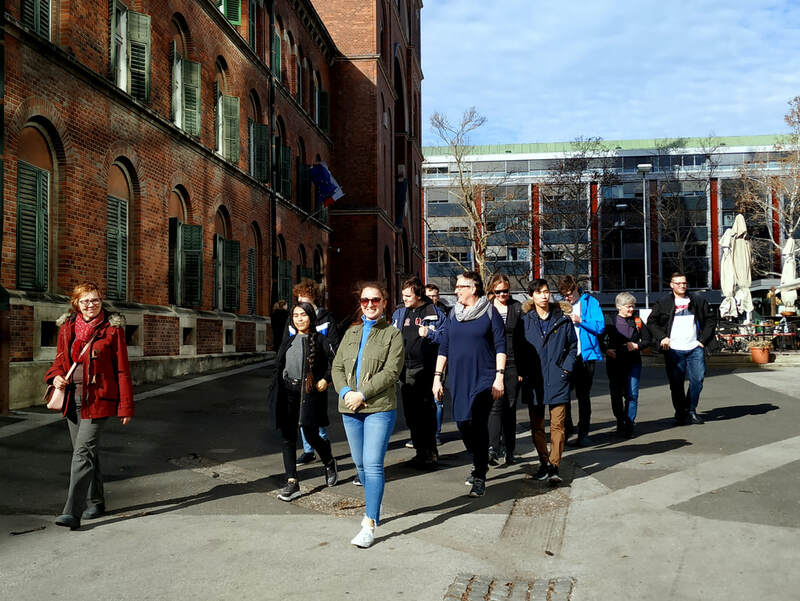 Our partners from Mallow College of Further Education, Ireland, came for a study visit. We discussed our collaboration and the profiles of their students that we will host in May. An important part of the study visit was also visiting local hosting companies and student dormitory. 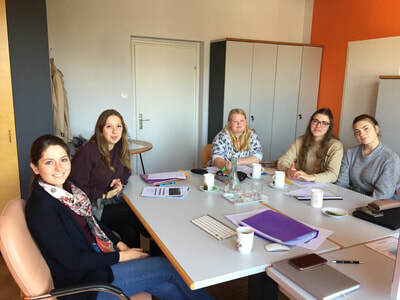 A new group from Spain, Fundacion Montemadrid started their work practice in Maribor. 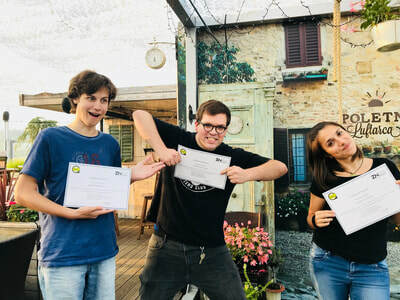 They are working in fields of cooking and gastronomy, pharmacy, microcomputer systems and network, web/graphic design and video production, commercial activities and business administration. 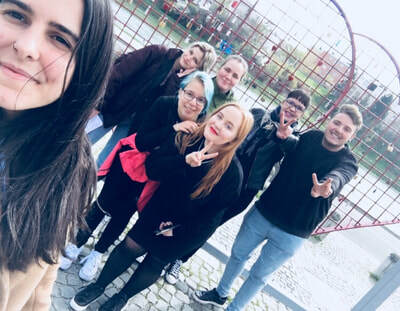 The group consists of 8 participants, 7 of them will stay here until June, and one of them is here through Erasmus+ PRO program and she will stay until August. 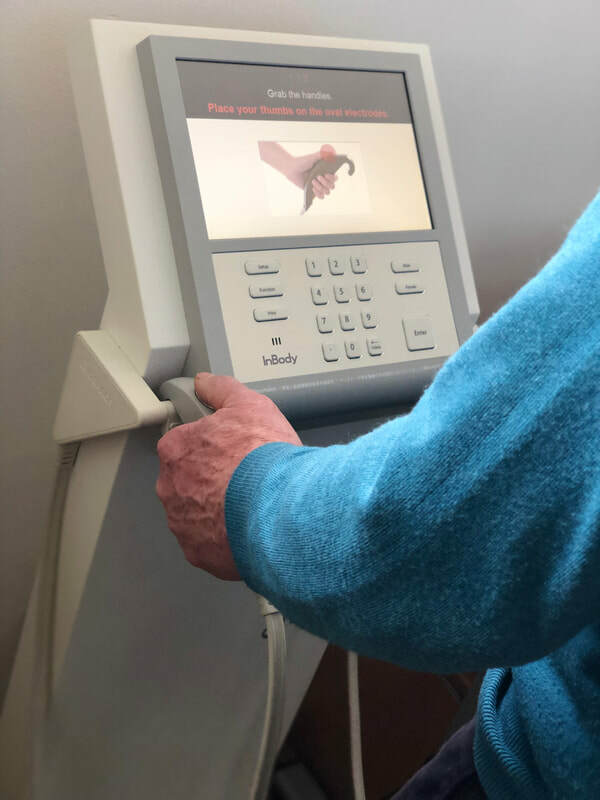 We will be here to monitor their work practice, organise some free time activities and trips and of course, offering support for anything needed. 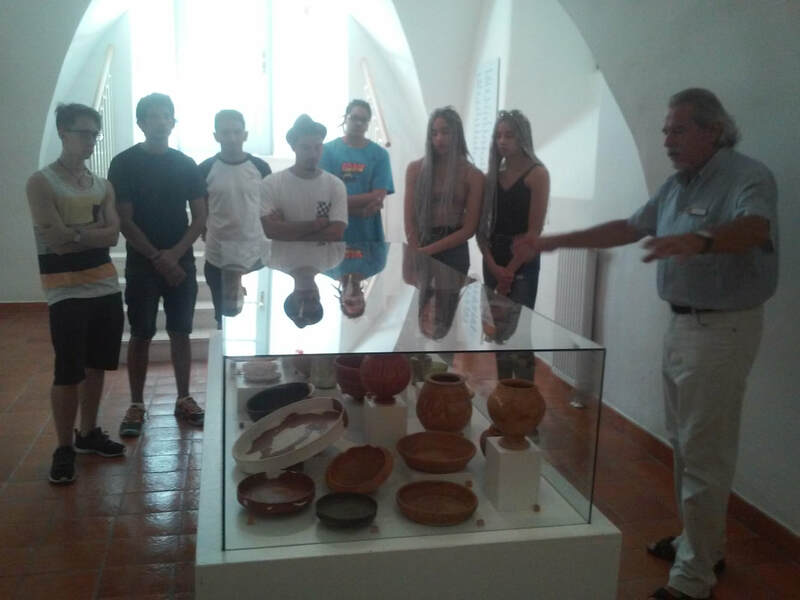 We hosted visitors through our partners Mundus, Spain. 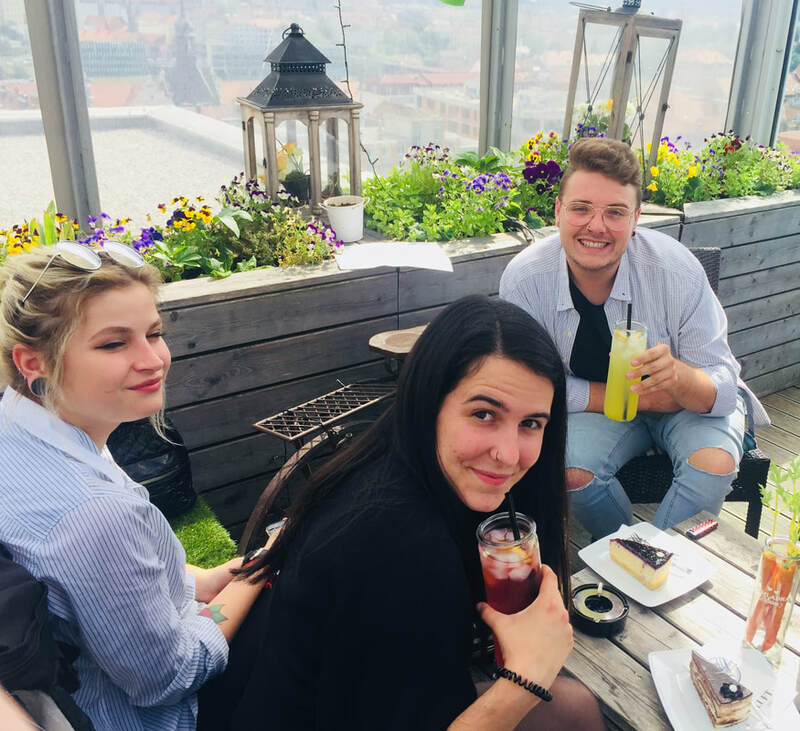 The purpose was job-shadowing so we visited local companies that proved to be a good match for work practice in fields of marketing, photography, graphic design and web development. We had a pleasant time visiting them and getting to know their work. 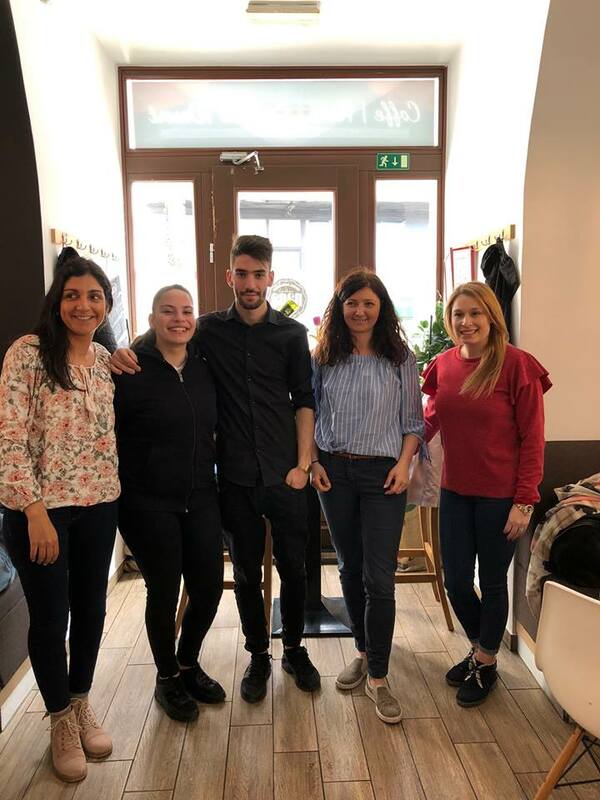 Since Friday 26th of March our team is hosting Alejandro -an intern from Spain from our partner I.E.S. Mateo Aleman. Alejadro will do his work practice at Avto Jarc, an authorised dealer and repairer of Audi, VW and Seat vehicles. His work practice will last till the end of May. We hope that this time will bring him a lot of professional experience, but also it will be amazing adventure. We wish him fruitful and pleasant internship and great journey in Slovenia. Since Friday 22nd of March we are hosting a next group of interns. 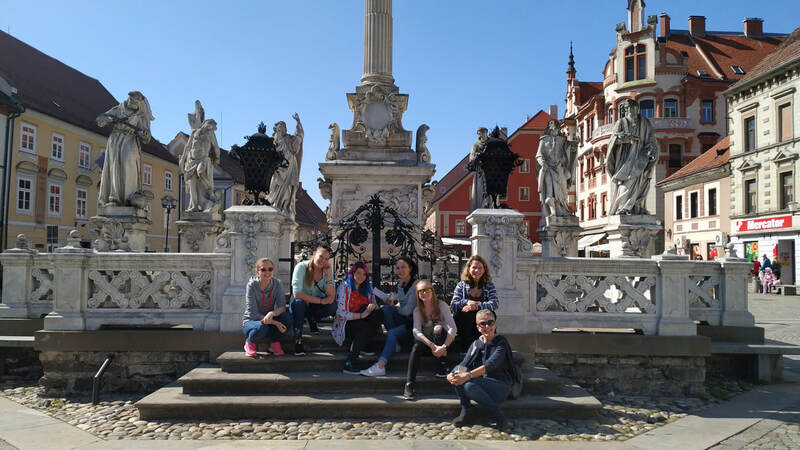 They are group of six girls with tutor and they came from Czech Republic. They will stay in Slovenia about two weeks to gain new professional experience here. They will work with horses in different clubs because for all of them taking care about these animals is not just field of their education, but great hobby. We hope that they will have good time here and rest of their will enjoy it as much as they enjoy the weather during their city tour in Maribor. 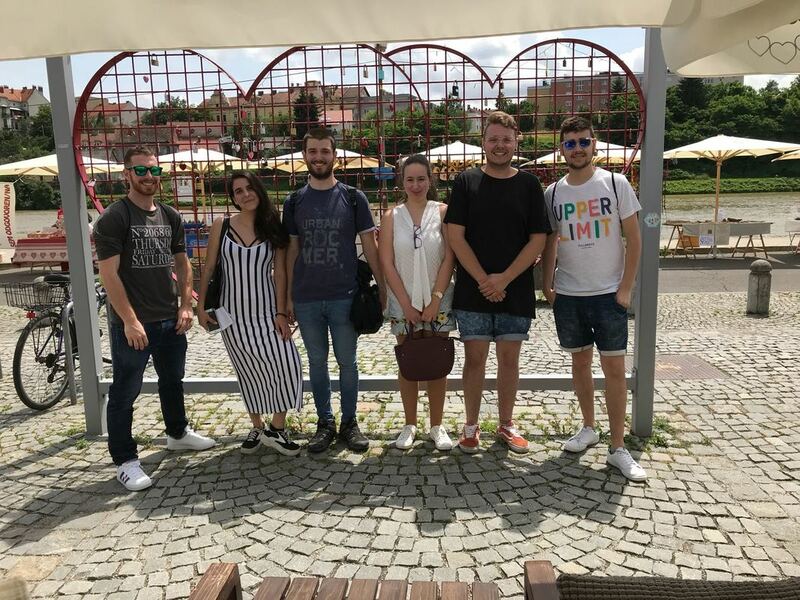 We have great pleasure to host our spanish group of two guys from our partner Mundus and second group of six people from our Italian partner Eurocentro , participants came to Slovenia, Maribor for the project Recircle Plus. Eight interns are going to stay with us exactly one month. They are pupils from different schools, so we prepare for them suitable work places. They will be working for Zavod MARS Maribor, Center eksperimentov, GEOMASS, OPTIKA PRIMA (Outlet optika) and Smartronik​ . 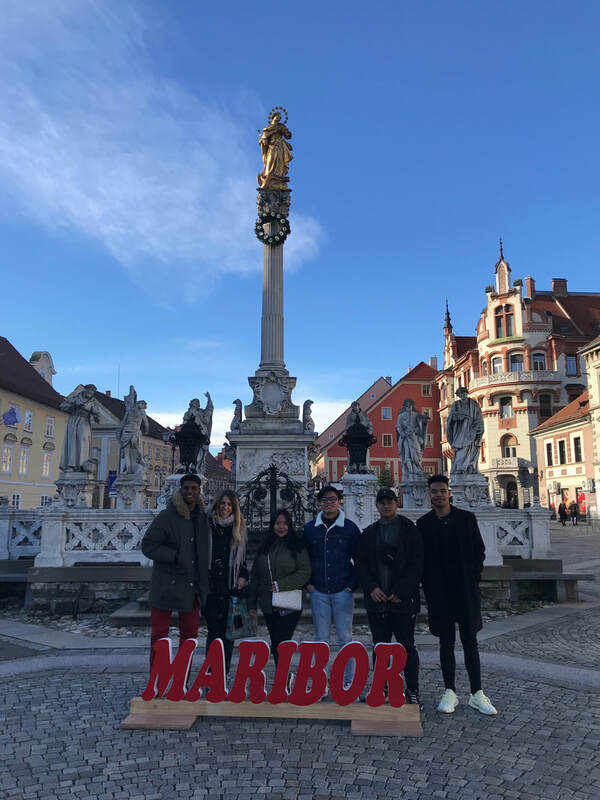 We wish them a happy stay in Maribor and we hope that they can enjoy to the fullest all this city can offer them. 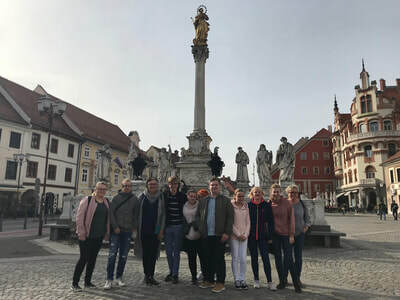 First Polish group from our partner Semper Avanti came to Maribor. 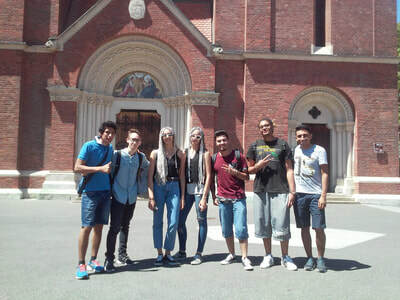 They will stay in our city next 4 weeks and they will have possibilities to gain new skills in the professional life. All of them are from one class and in their homeland they learn how to be electrician. 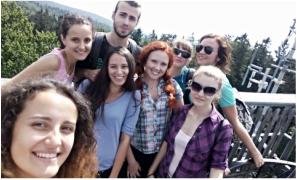 We wish them pleasant internship in Slovenia and many chance to explore new country. Here is our new ZNI intern Daniel. He is from Spain and he will stay in our office for 3 following moths. 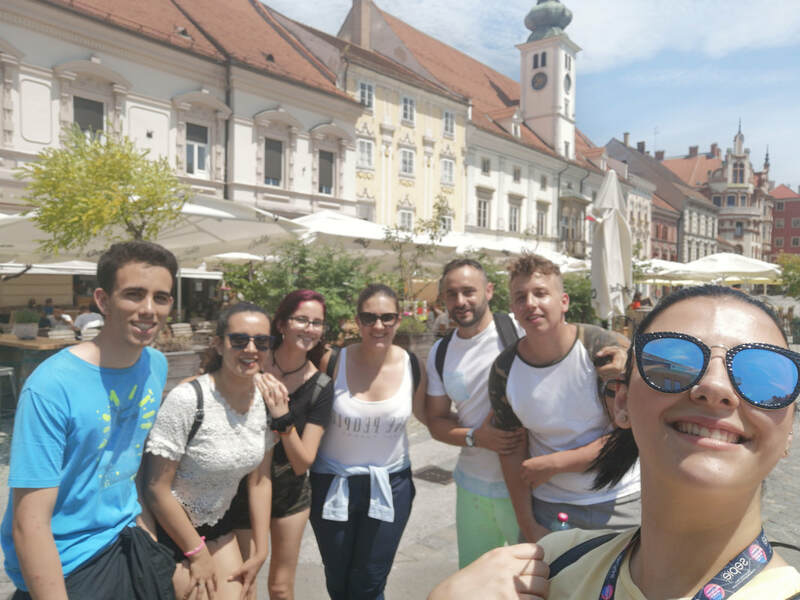 He came Maribor from ERASMUS+ project. 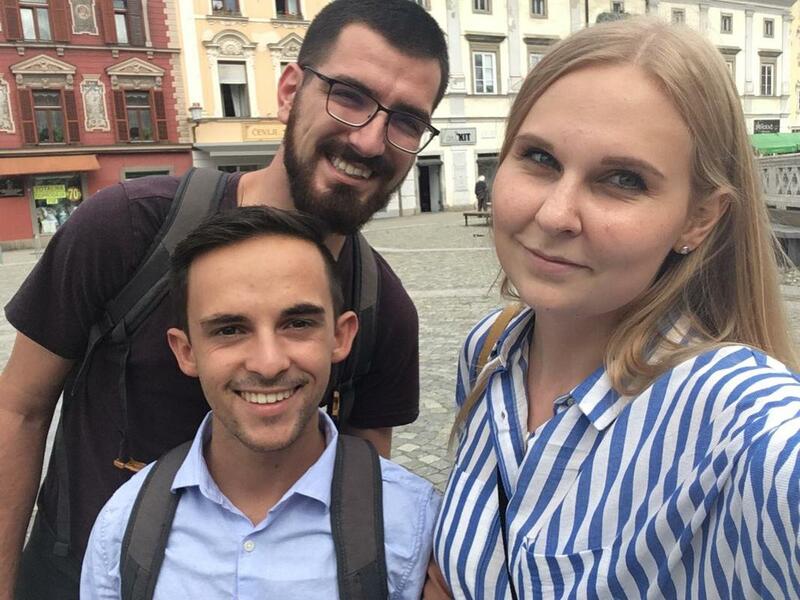 He will help us hosting other interns, preparing content for social media, inplementing cultural program for other participants and also with some documents. He believes that with his mobility he can be very useful and helpful for our institute, he wants to improve his English level and learn how is it living far away from home. We wish him pleasant and productive in Slovenia! Time is flying. 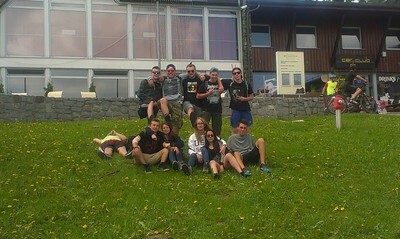 We've just said goodbye to one of Italian groups and at almost the same time we were welcoming new group from Sweden. Nine students with their three tutors will stay in Maribor following four weeks. 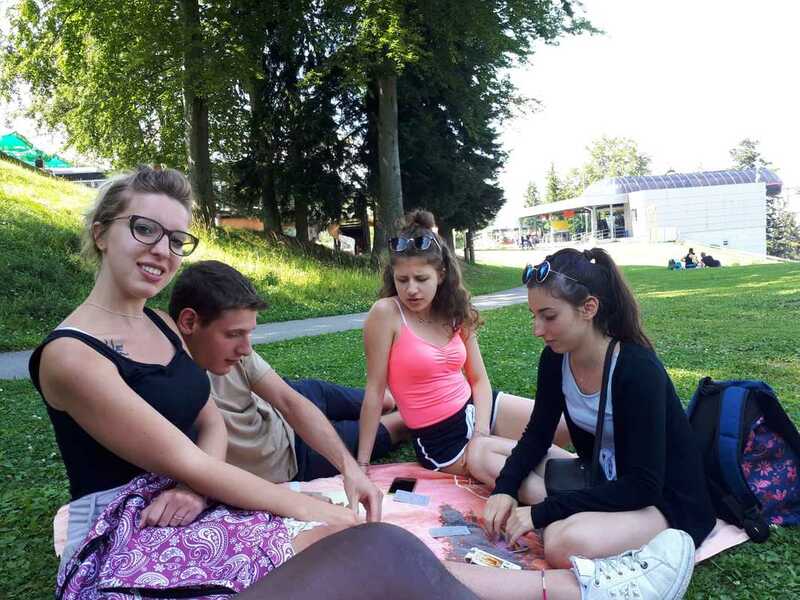 They will have opportunity to develop their professional skills and discover how surprising can be Slovenia. 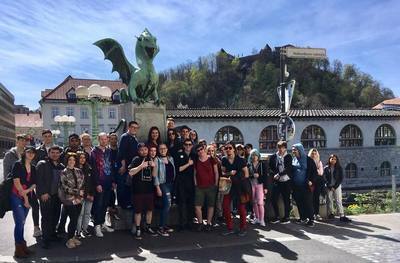 Yesterday we showed them our beautiful city and the most important places. We wish them the best time here and just positive experience. 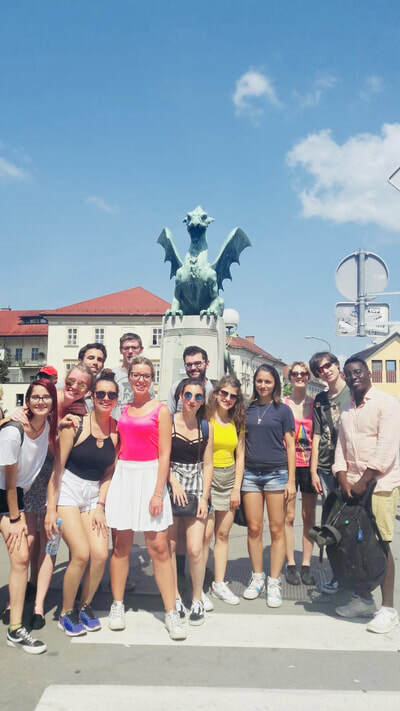 Next group of interns is already in Maribor. We are hosting three French men, who came 10th of February and will stay till beginning of April. They are part of project called Audace+2. 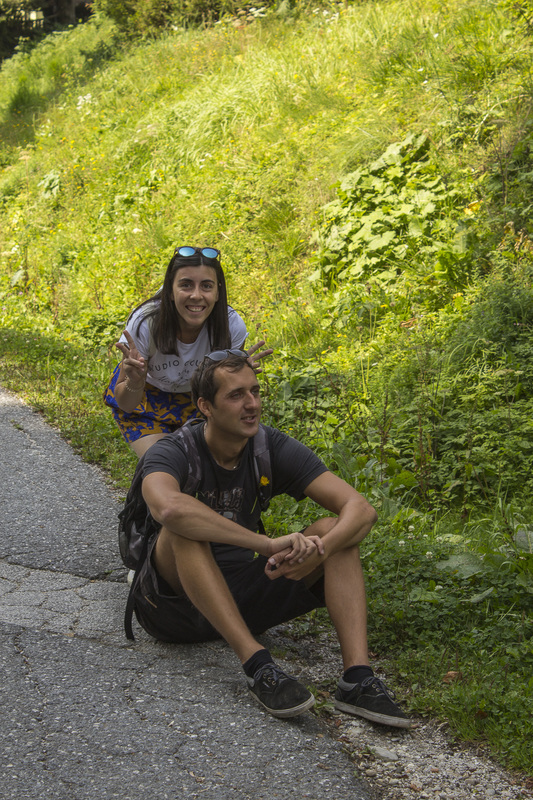 They will gain new experience in their professional fields and discover a bit of Slovenia. We hope that they will have marvelous time here! 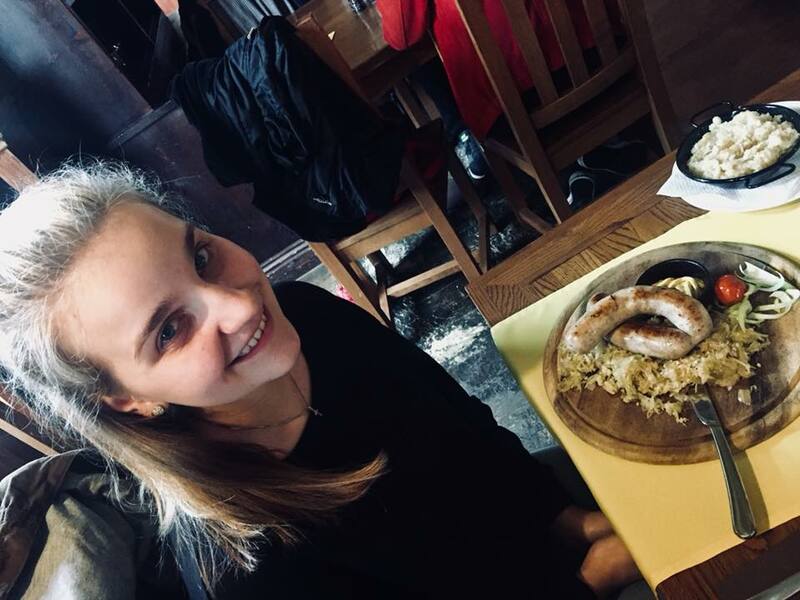 Here is our new ZNI intern Ewelina. She is from Poland and she will stay in our office for 7 following months. 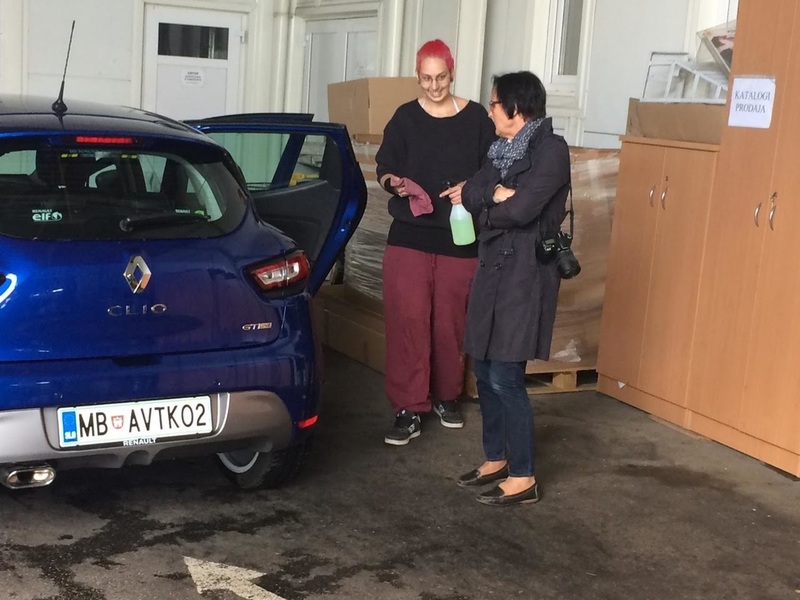 She came to Maribor from ProMove project, which promote long term mobility. She will help us with hosting other intern, preparing content for social media, implementing cultural program for participants and also with some ot the documents. 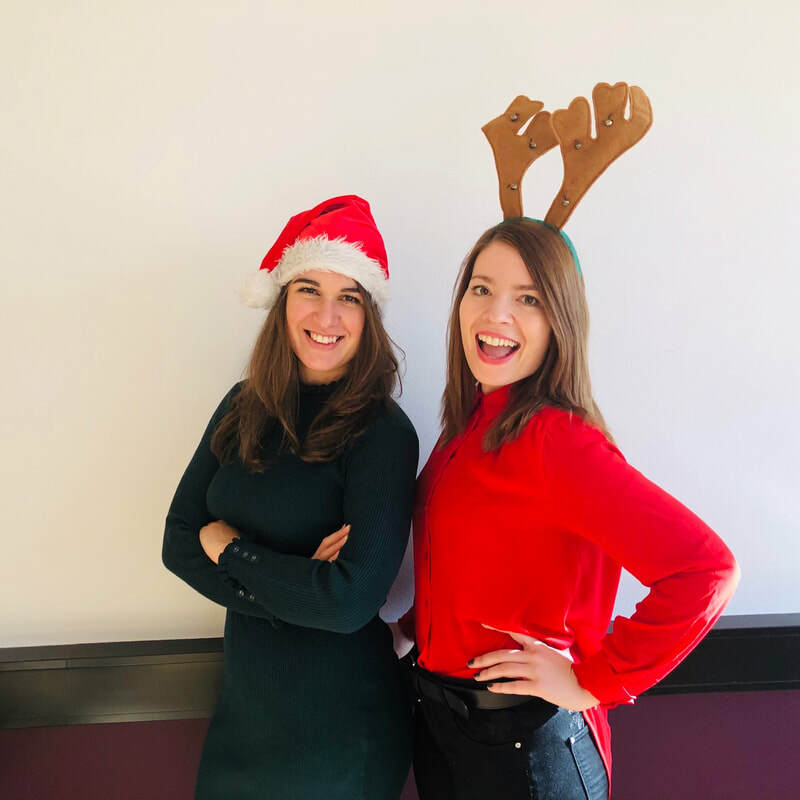 She highly believe that experience which she can gain during the project will be very useful and helpful in her professional life. We wish her pleasant and productive time in Slovenia! Here's our new ZNI intern Riccardo. He's from Italy and he will have a work experience here in the ZNI. 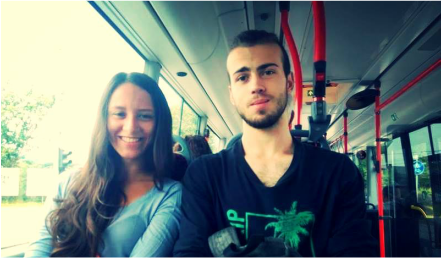 He came in Maribor with the others italian student of the Erasmus+ project and he will stay here for 31 days. 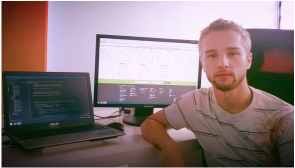 Riccardo asked to deal with something interactive so he will update our Web Site and post on Social Medias, but he will help with some documents as well. He's very motivated and ready to get the best from the internship. With the best wishes we hope he will enjoy the stay! The second group we are hosting is from Italy as well and they will be there for three weeks. 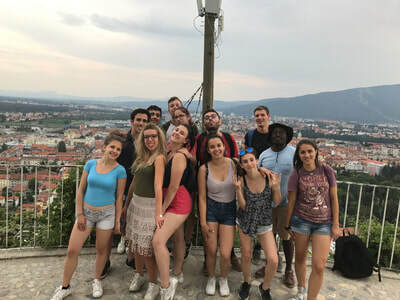 During the stay the student will have an internship experience here in Maribor. They attend different schools so they will have their work practice in the fields they are studying for. With the best wishes we hope they will enjoy the experience. 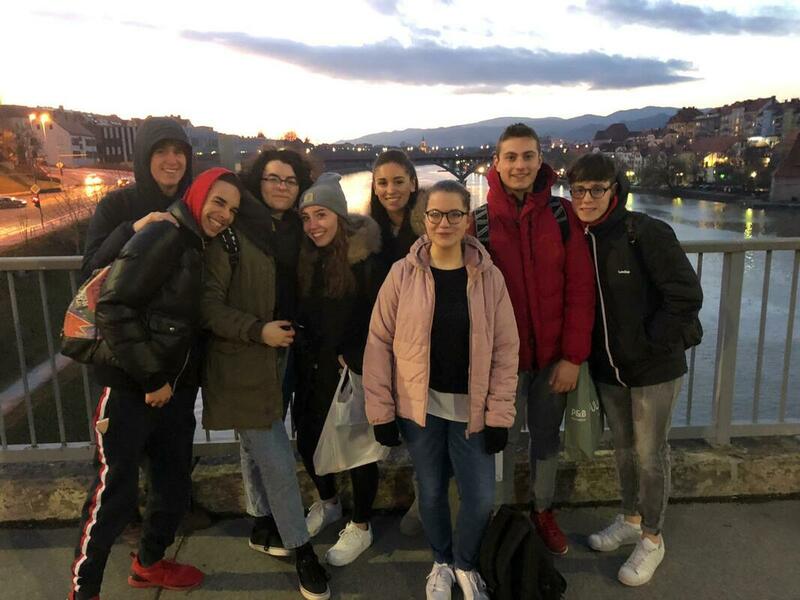 Our first group arrived from Italy on February the 2nd and they will be stay in Maribor for 31 days. They are here for a project called Goals which provides them an abroad internship. The Student are from different school and they will work on the main field their school are focused on. They look very motivated and ready to gain the best from this experience. We hope they'll enjoy the stay! First visit in 2019. 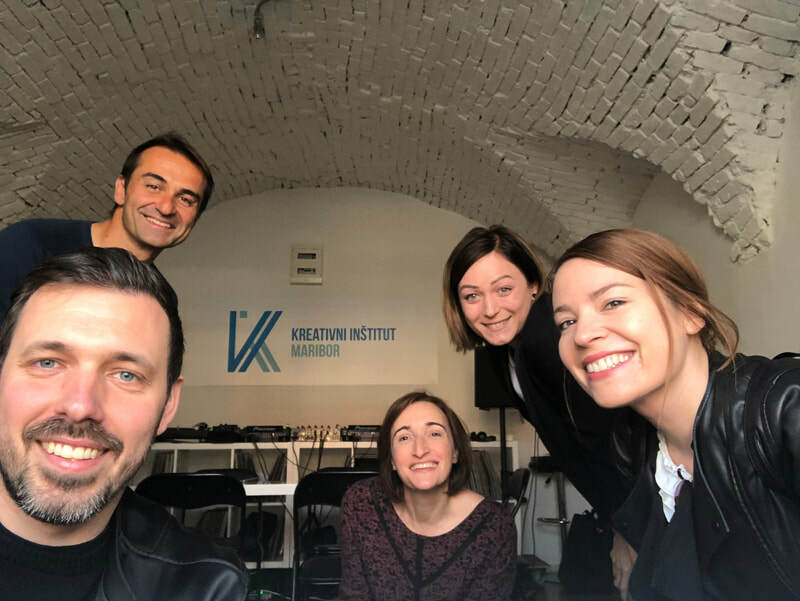 Our first hosting in 2019 came from Italy and it was a study visit from Cooperativa Sociale Kara Bobowski. 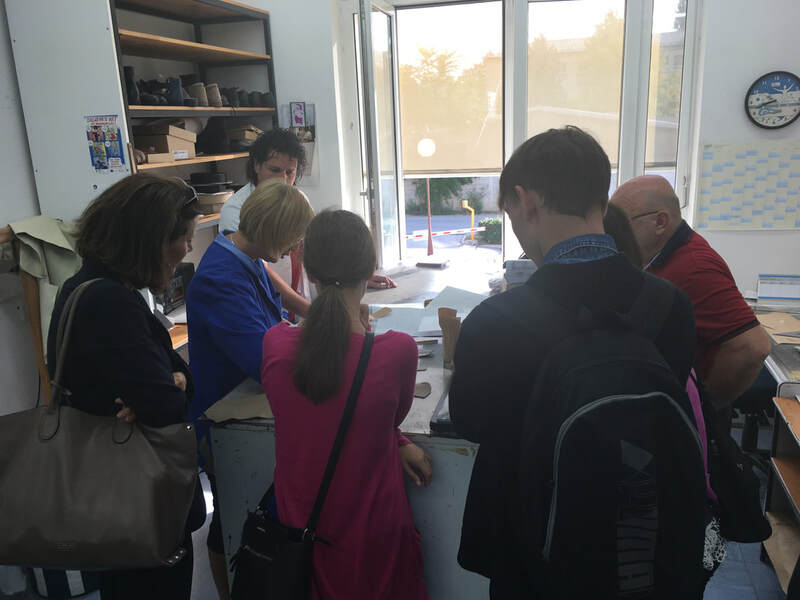 The purpose of study visit was not just to exchange of experience and examples of good practise between the countries but also promote our countries and our organizations. 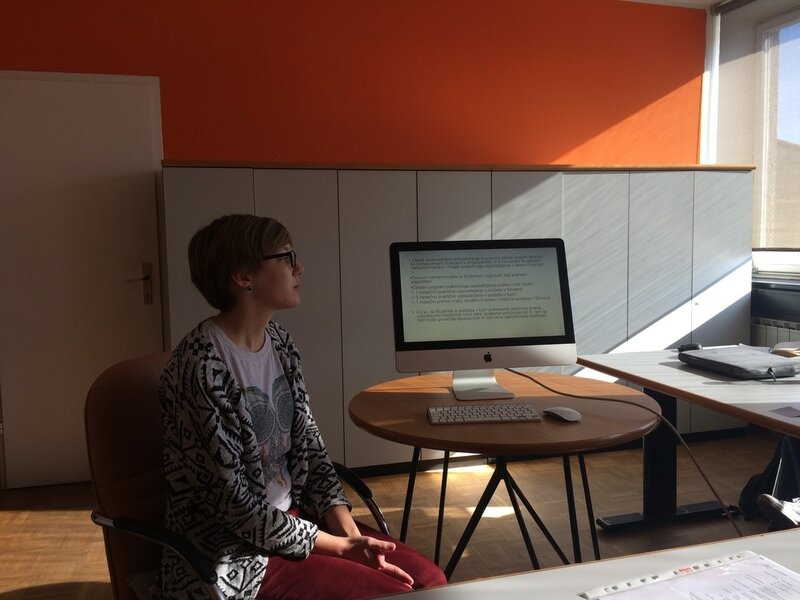 We started in our office where our visit Elena presented her organisation, future projects and her country. 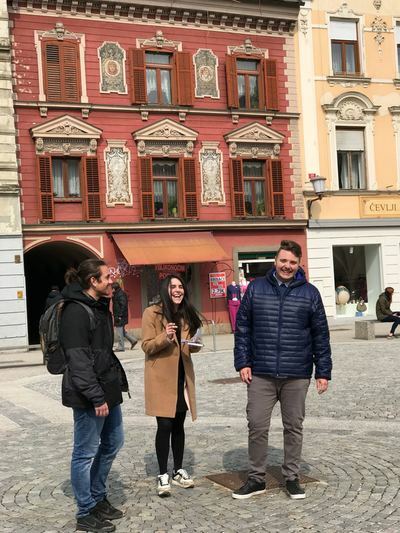 Later we presented our organisation, our projects and our country with the city tour around Maribor with our ZNI's intern. We believe Elene liked her stay in Maribor. 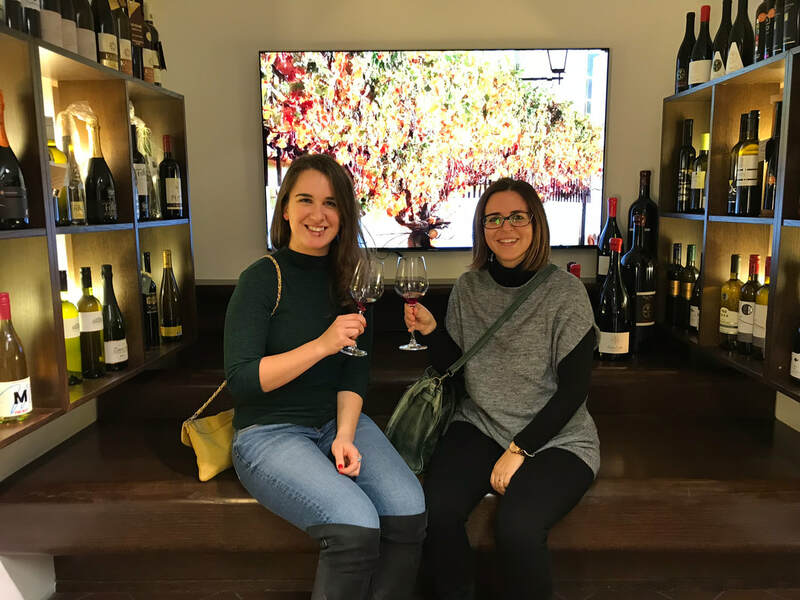 At the beginning of the week we had an honour to welcome our partner from Spain, Marta. She came on behalf of FUNDACION MONTEMADRID​. 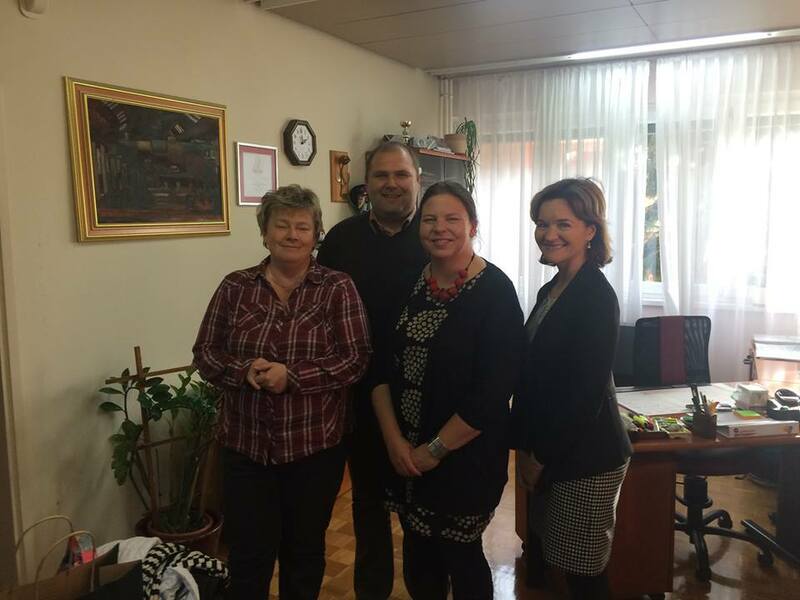 She came to visit potentional hosting companies and accommodations in Maribor. We had lovely meeting in our office where she presented her organisation, future projects her country. 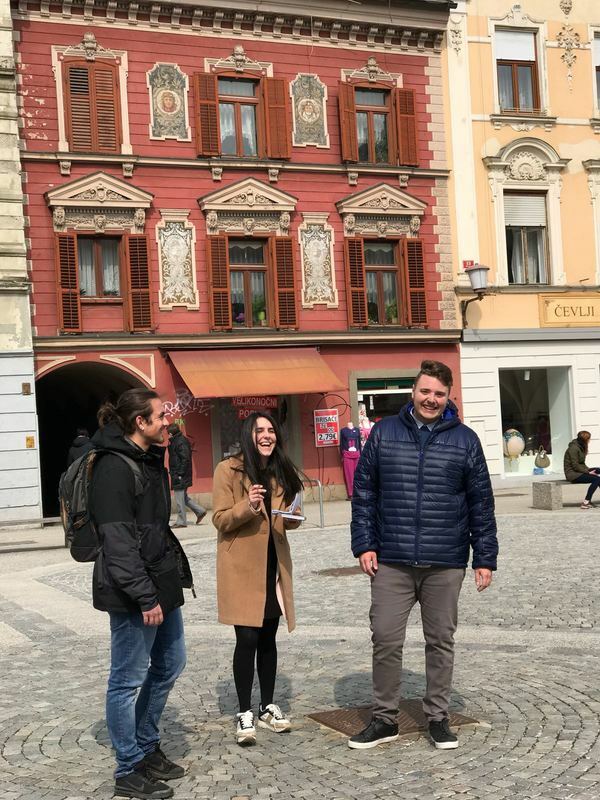 And we presenter our organisation and our projects and also her our country with the city tour around Maribor with our ZNI's intern. 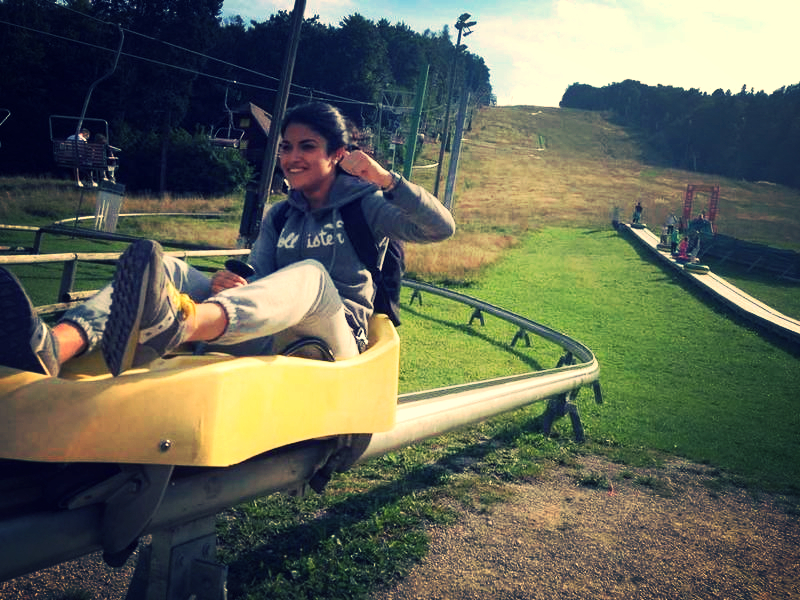 We hope Marta is enjoying her stay in Slovenia! At this moment we are hosting 5 students from Italy. 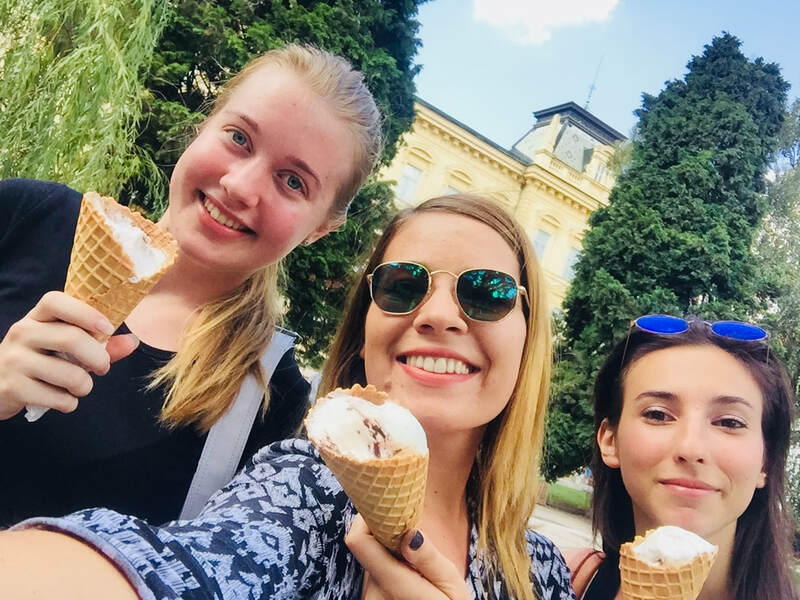 After acclimatisation and introduction of the city and Slovenia by our intern, students form Milano will start their internships in the field of gastronomy. Participants are involved in all aspects of day-to-day work duties of full-time employees. They are improving many interpersonal and communicative skills besides their professional abilities. Students are spending 2 months of mobility with great benefits for their future career. We wish them good luck! 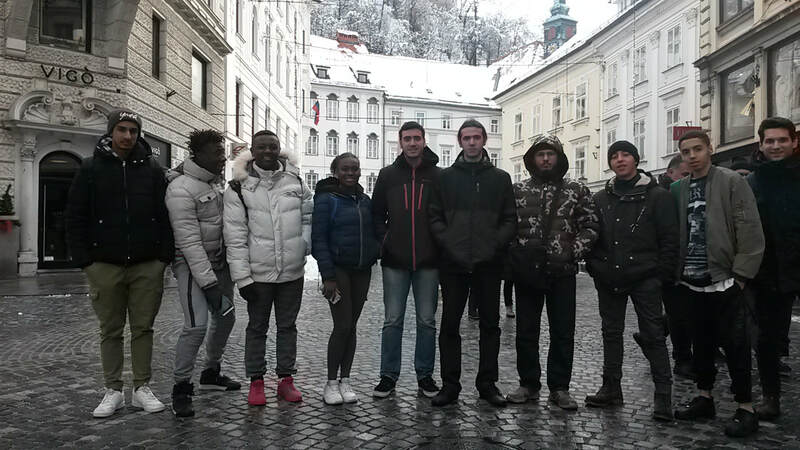 ​At the end of last week we welcomed a new group from Czech Republic for the project EDUMOB - Educational Mobility. The participants are at the last year of their high school. All of them study on the School of Mechanical and Electrical Engineering in České Budějovice, Czech Republic. They will have their work practice in the fields of elektroengineering and mechanicalengineering. We hope that this experience will help them develop new essential skills and knowledge in their work field. We wish them a great experience and a pleasant stay! 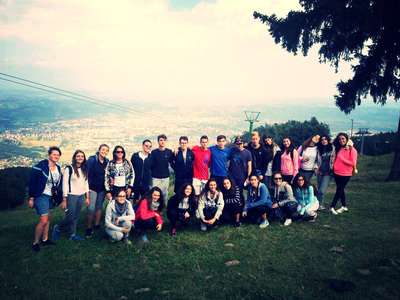 We started the official program with a new group from Italy. Participants will do their work practice in a Pharmacy, at a daily center for children and youth, in advertising agency, in digital agency, in accounting service, in European cultural and technological center Maribor, in a destination shop and in Veterinary center. 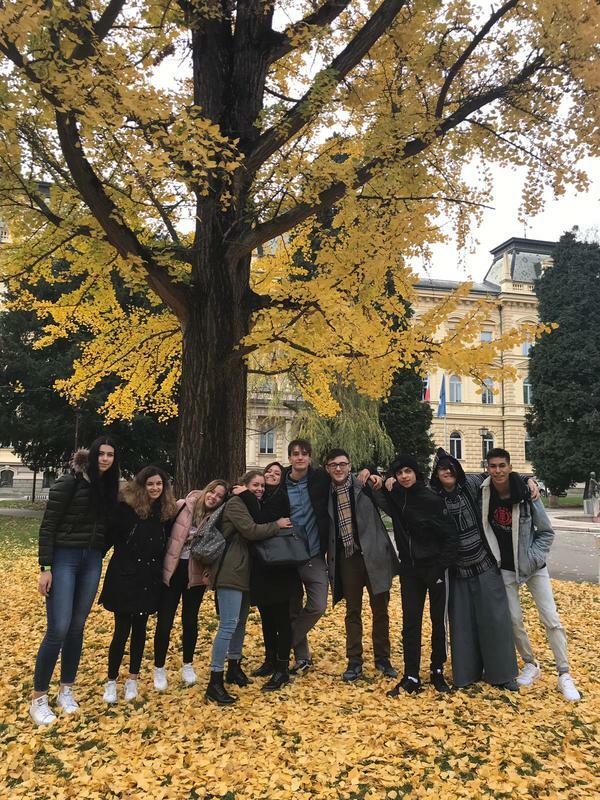 The group arrived in nice autumn days but was welcomed with the first snow just a few days later - and the tutor of the group is very excited about it! New group of the project, ACTIVA - Europe in Reach 3, came from Sweeden to Slovenia, Maribor to do their working practice. They will be working in the companies which are from the field of their studies and interests. Victor will work in Trgovina Jager, Melina and Amanda in Zavetišče za živali, Grete in Društvo Sonček, Albin and Therese in Center za socialno delo (PIKA), Molly in Niagara Cocktail Bar and Philip in KUD Coda. 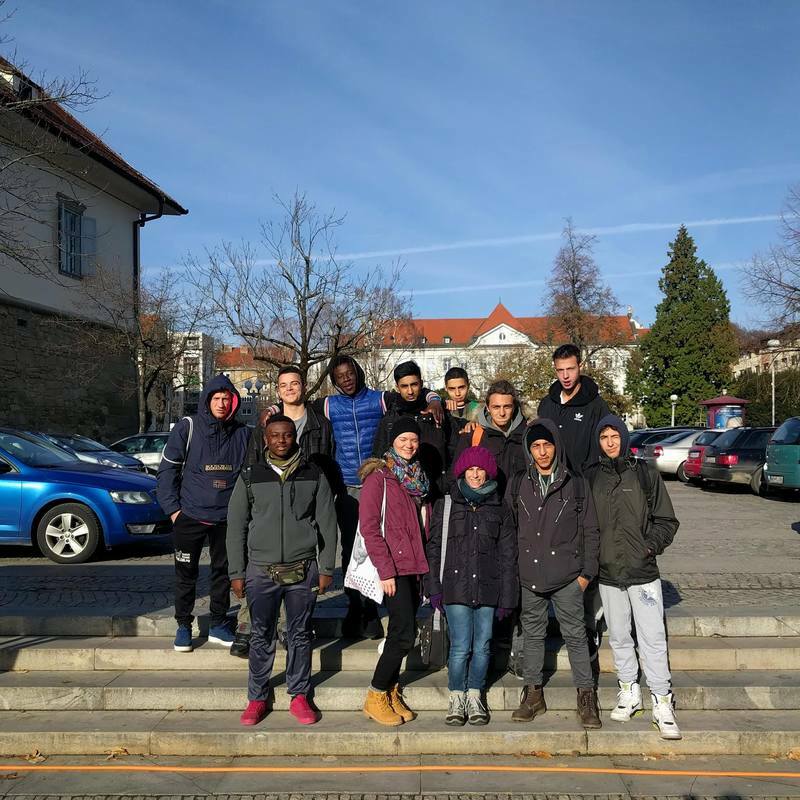 We believe this experience will help them and we wish them a great time in Slovenia. 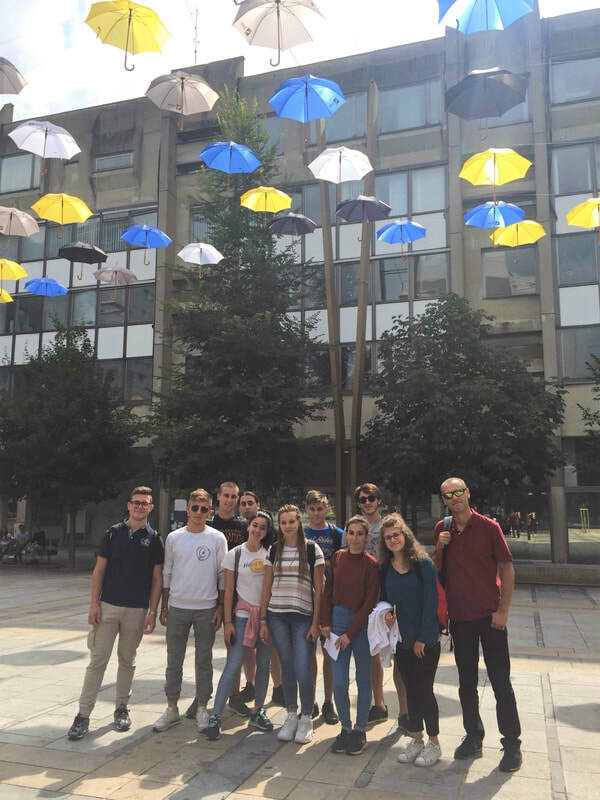 On Monday we welcomed two groups, one from Spain (INCOMA - JEAN+) and another from France (AFORMAC). 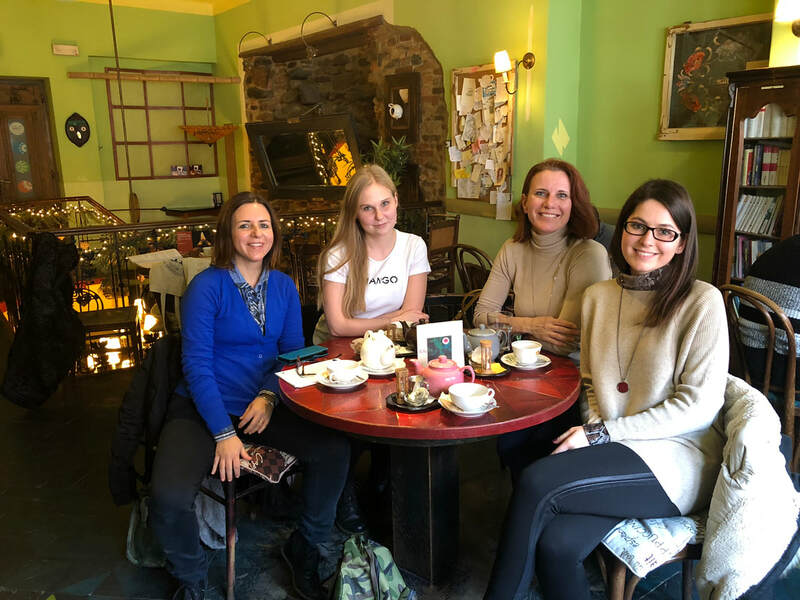 Teresa came to Slovenia, Maribor with her tutor from Spain. She will be working in Društvo Bodifit and Atletski klub Poljane - her main responsibilities will be assisting to trainers during group workouts. Lorine, Charlène and Océane are girls from France and came to Maribor to work in Dom Starejših občanov Tezno, Vrtec Borisa Pečeta and Lepotilnica. They came abroad not just to see how life looks in other country but also to improve their language skills. We wish them a great time in Slovenia and we hope this opportunity will help them in their future. 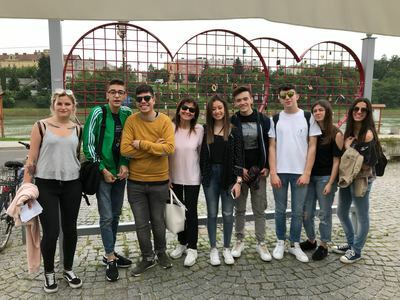 ​Last week we welcome a new group from Italy. 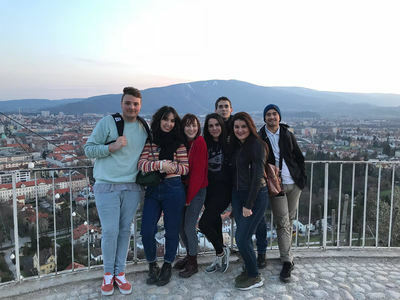 Italian students accompanied by their tutor decided to do to come to Slovenia, Maribor to do their working experience. 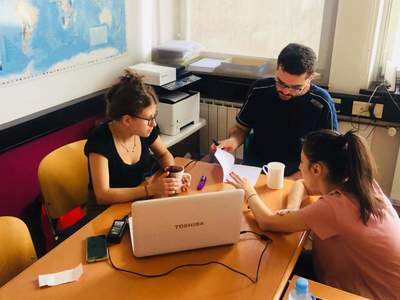 They will work in Aquasystems d.o.o., Permakulturni inštitut, Šola Prihodnosti, Zavod Mars and in Zlate Misle in order to improve their skills in field of their interest. Companies where our participants are working are from the field of their studies. We believe by this programme they will gain neccesery job experience. We wish them a great time in Slovenia. In the beginning of October we welcome a new group from Italy. 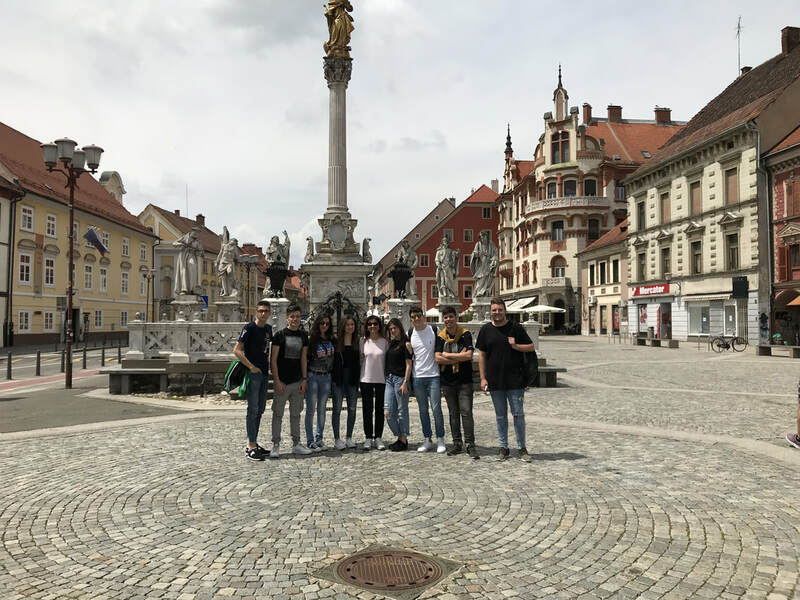 Nine Italian guys accompanied by their tutor decided to do to come to Slovenia, Maribor to do their working experience. They will work in Smartronic company, MI6 Marketing Intelligence, Fortis Maribor, Bazar Babič&Lujič, IT TIM and in MKC Maribor in order to improve their skills in field of their interest. 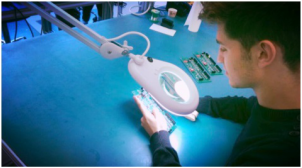 Companies where our participants are working are from the field of mechanic, electronics and IT. We believe by this programme they will gain neccesery job experience. We wish them a great time in Slovenia. 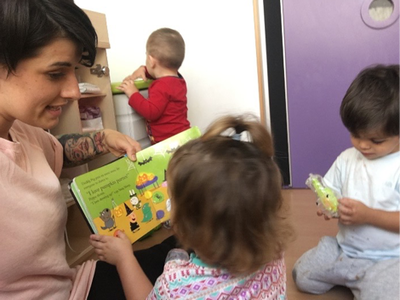 ​Project EYE - Early Years Education is focusing on the topic of Emotional learning and puppet theatre. Participants from Irealand, Germany, Portugal and from Slovenia spend two week togehter educating themself. During these two weeks they have lectures which are related to the topic. Participants also try their skills in practise, more precisly in kindergardens. 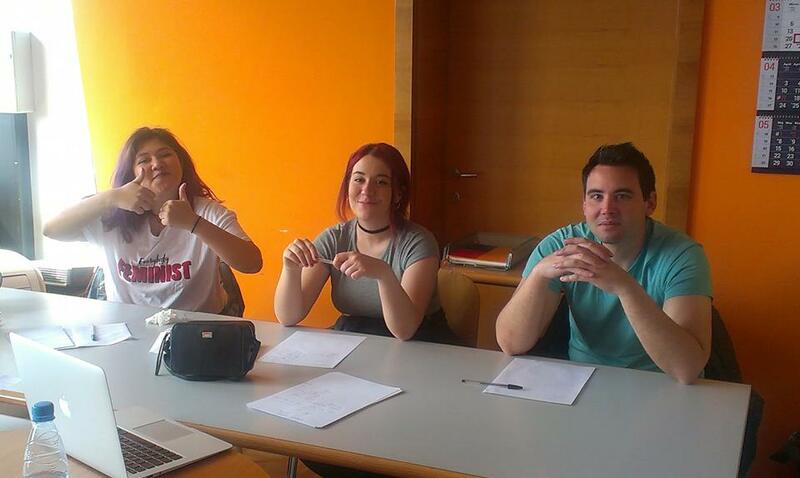 Other than that, ZNI representatives prepare activities for participant. 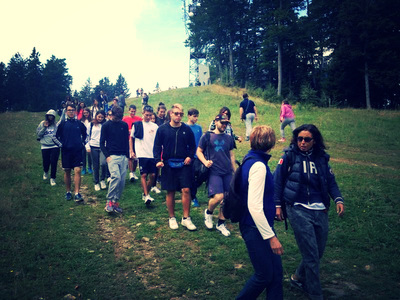 We have already had tour around Maribor, international evening and trip to Maribor's hill, Pohorje. 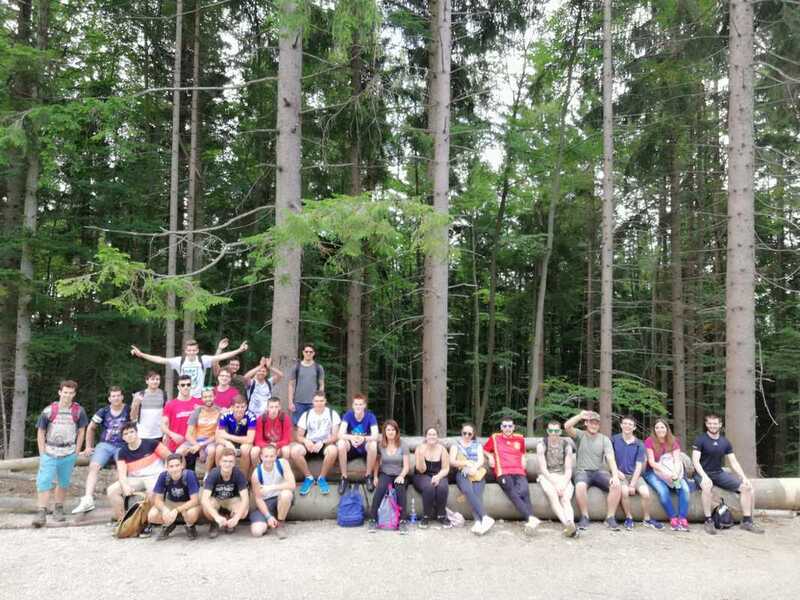 We hope participants will enjoy their staying in Slovenia and that this experiance will be valuable for them. 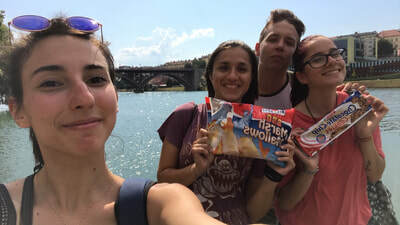 ​Johanna, Florentin, Stephanie and Emma are group from Germany and came to Slovenia, Maribor for the project Anna Warburg Schule. 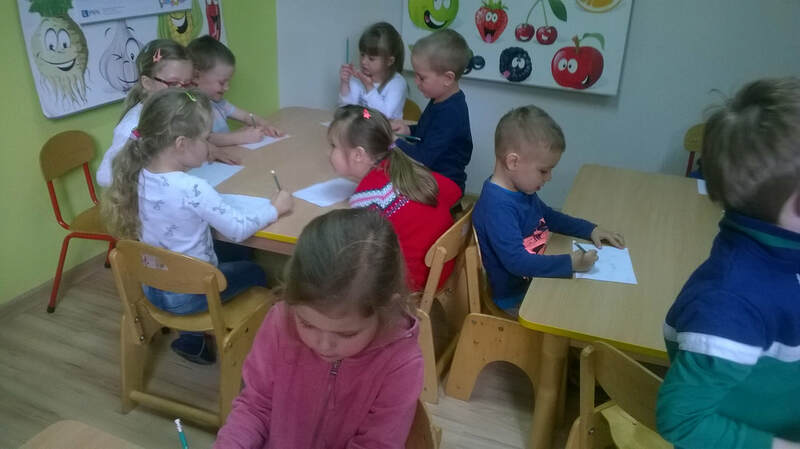 Girls will be doing their work practice in kindergartens for the whole October. They all are from the field of education and would like to work with children in the future. We believe this experience will help them and we wish them a great time in Slovenia. 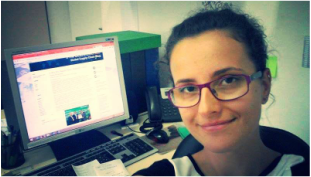 At the end of September we welcomed new participant, Lucie, who came to work to Slovenia, Maribor individually. She is from Czech Republic and will be working in Dom Danice Vogrinec in Maribor. She will be working with elderly people and one of her responbilities is to make a program for them. 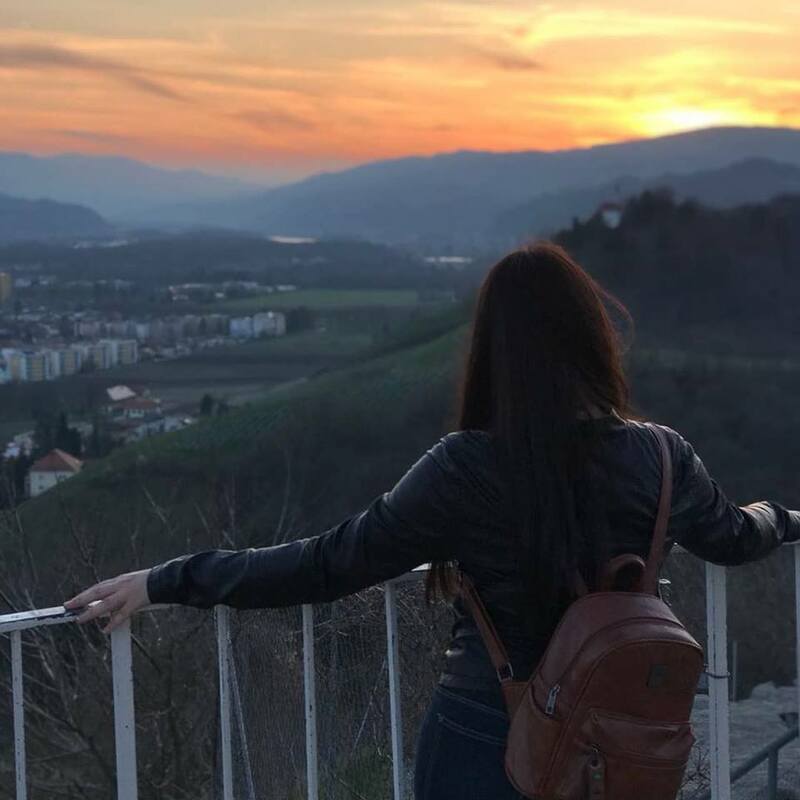 She came with the aim to improve in English and get basics in Slovene, since she will be taking classes of Slovene language. We wish her a good luck and we hope she will enjoy her stay in Slovenia. Last week we welcomed a new group from Portugal. 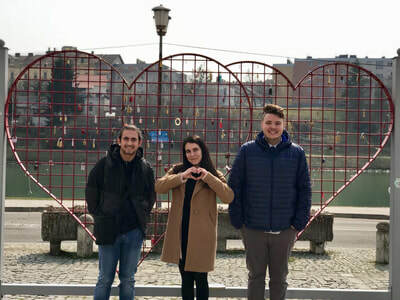 Dinis, Luis, Tania and Marta have decided to come to Slovenia, Maribor to do their working experience. 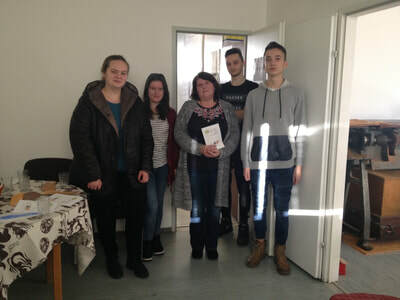 They will work in Hotel Betnava, Lancom and Vijol'čna bajta in order to improve their skills in field of their interest. 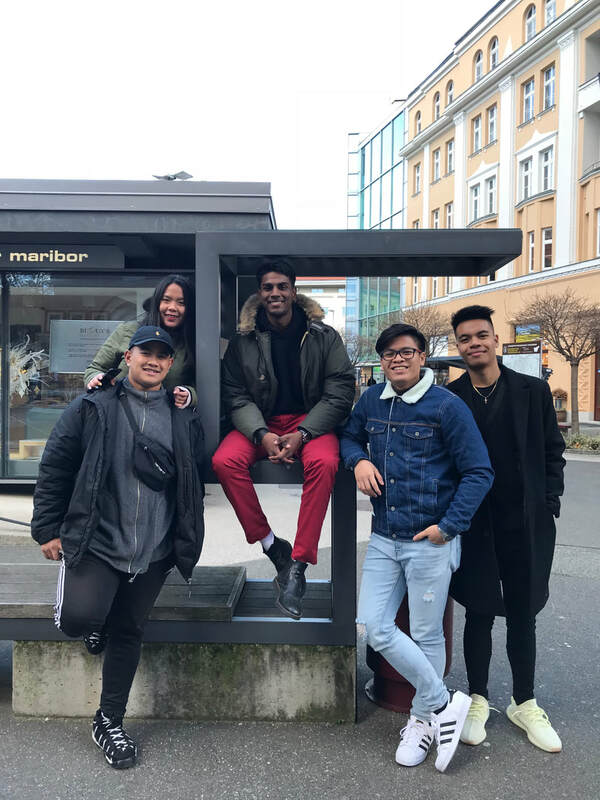 They came abroad not just to see how life looks in other country but also to improve their language skills. We wish them a great time in Slovenia and we hope this opportunity will help them in their future. 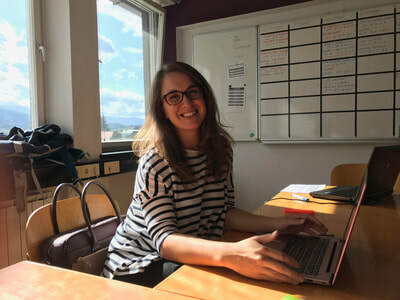 ​In the middle of September we welcomed Kristína as a new member of our ZNI team. 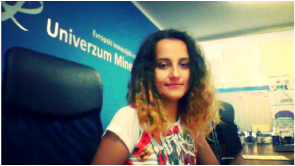 She is from Slovakia and has decided to do her postgraduate practice in Slovenia, Maribor in our office. 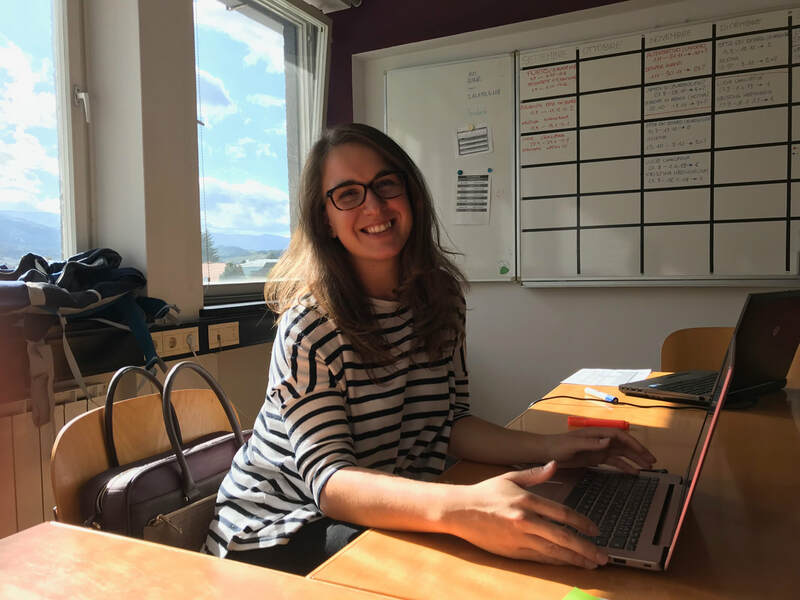 Kristína as a trainee is responsible for: familiarizing with the activities of the organisation, assisating in office administration and project administration, preparing and implementing cultural program for the participants and helping us with our projects. We believe it will be valuable experience for her and practice in our office will help her to start her future career. Welcome Kristína! We believe that a good preparation before the mobility is very important. 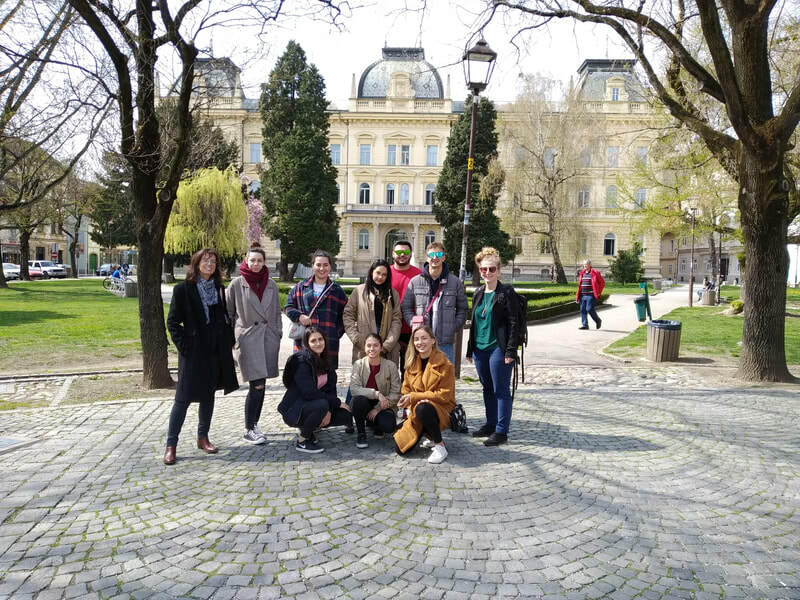 In the last two days we had preparational programme with Slovenian students who are starting their mobility at the end of the next week through VET SKE Erasmus+ program. This project provides a 3 week practical training in companies across Europe. The applicant and coordinator of the consortium is Tehniški šolski center Maribor in cooperation with Biotehniška šola Maribor, Srednja poklicna in tehniška šola Murska Sobota, Srednja gradbena šola in gimnazija Maribor, Lesarska šola Maribor, Biotehniška šola Rakičan. In the last three days we held Pro Move partnership meetings in which we discussed details about the implementation of the project with the representatives of our partners. Read more. 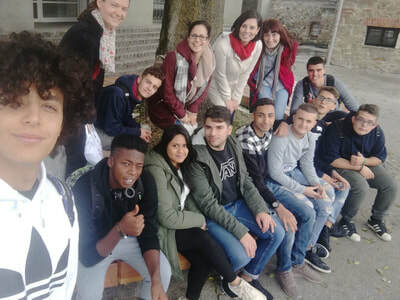 Last week we welcomed a new group from Portugal. Rúben and Miguel Ângelo will spend three months in Maribor for their working experience. 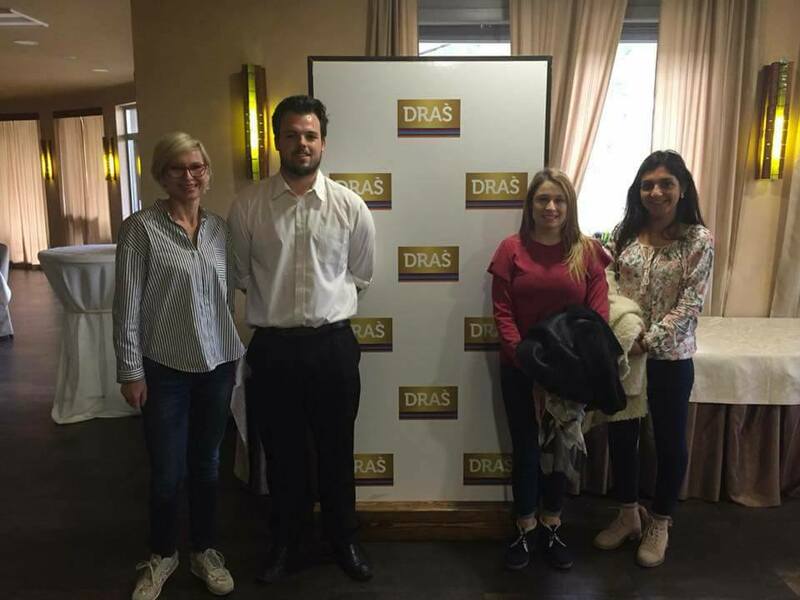 They will work at Hotel Draš and Nana in order to improve their skills in food service. We wish them a great time in Slovenia and we hope this opportunity will help them in their future. 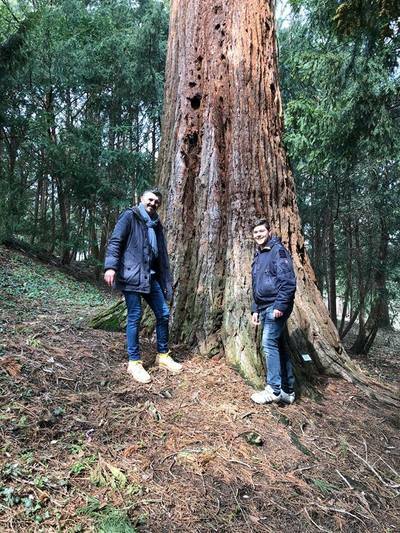 Welcome to our new group Tecnorete from Tuscany, Italy. The participants studied Chemistry, Biology, Mechanics, Mechatronics and IT, and they will be working for one month in different Slovenian businesses. We hope that this experience will help them develop new essential skills and knowledge in their work field. 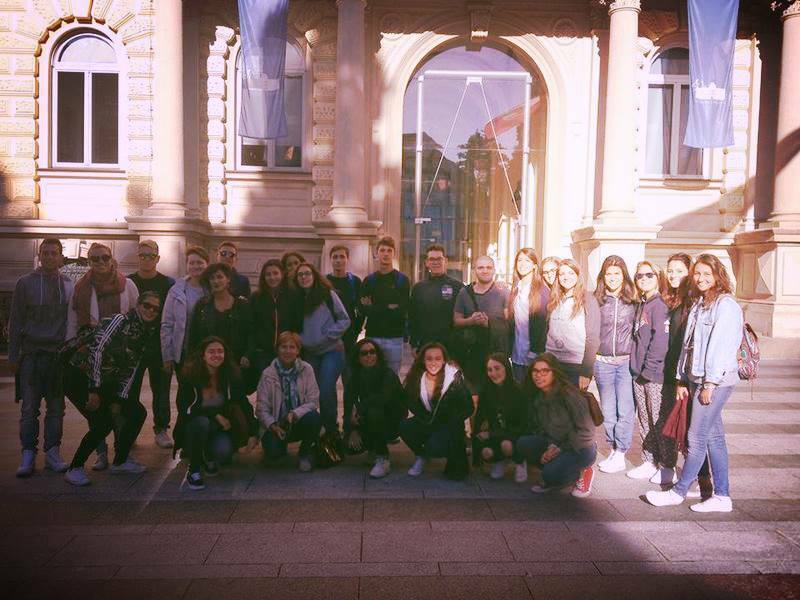 Yesterday we welcomed a new group from Italy for the project Fortes Euroexp. 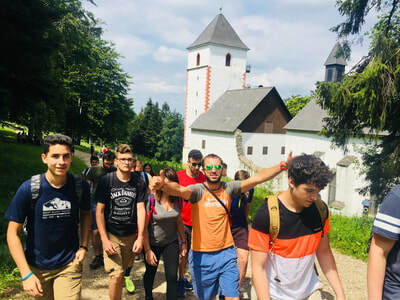 They will have their work practice in Ptujska Klet and Botanični vrt where they will have the opportunity to widen their cultural baggage on forests and viticulture and expand their knowledge in agriculture and enology, which they studied back in Italy. We wish them a great experience and a pleasant stay! 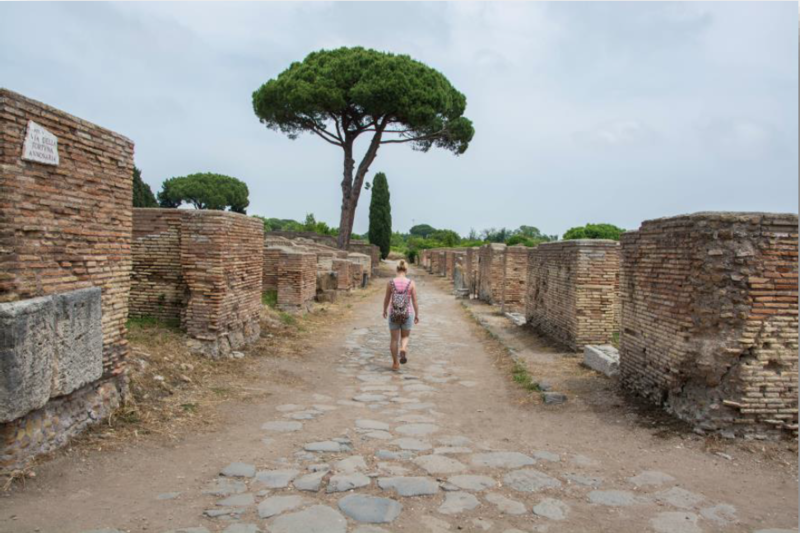 APPLY FOR A WORK PRACTICE ABROAD! 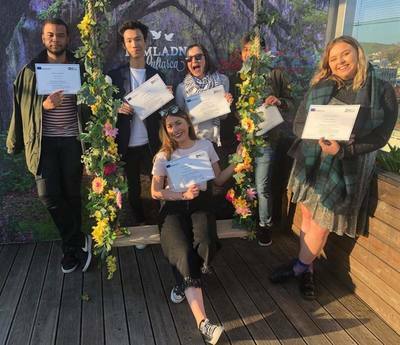 With the „Pro Move“ project we offer the opportunity for apprentices who just finished VET school to apply for a work practice abroad for a longer period of time. Read more. 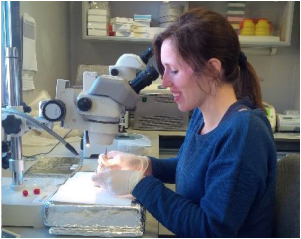 This week we welcomed a new participant, Susanna from Finland, for the project Hyria. After her preparation days in Maribor, she will live in Ljubljana, where she will also do her work practice as a security officer. Good luck for your mobility program! 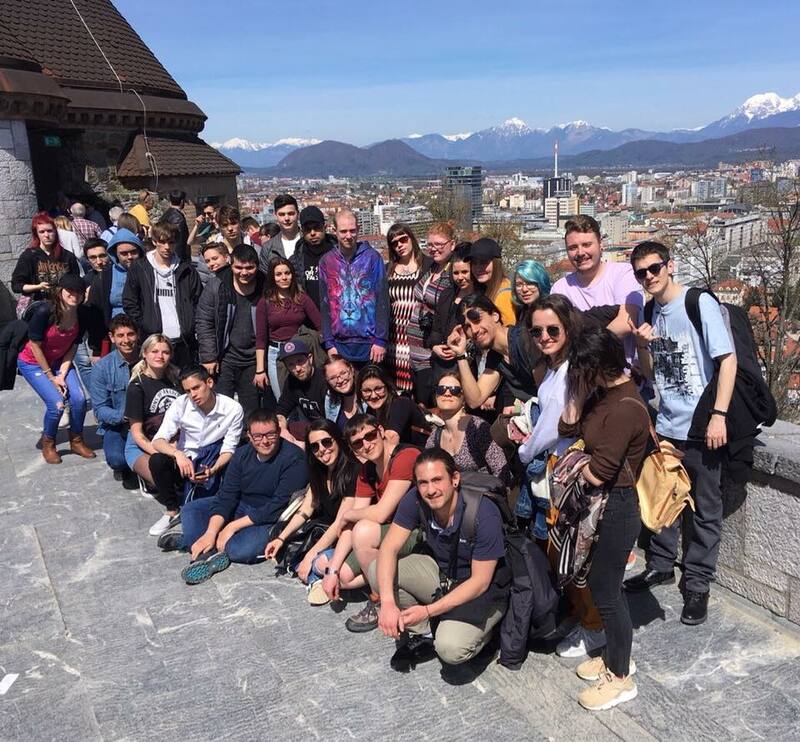 On Saturday we took a trip to the capital of Slovenia, Ljubljana, with our Spanish and Italian groups. 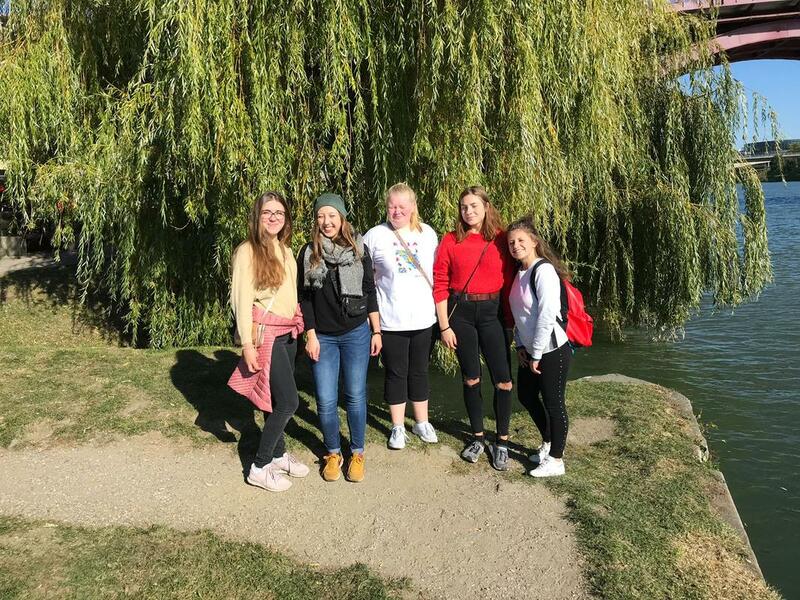 After a little city tour, discovering facts and Slovenian traditions, the groups had free time which they spent eating typical food and walking around the city and the Tivoli park. 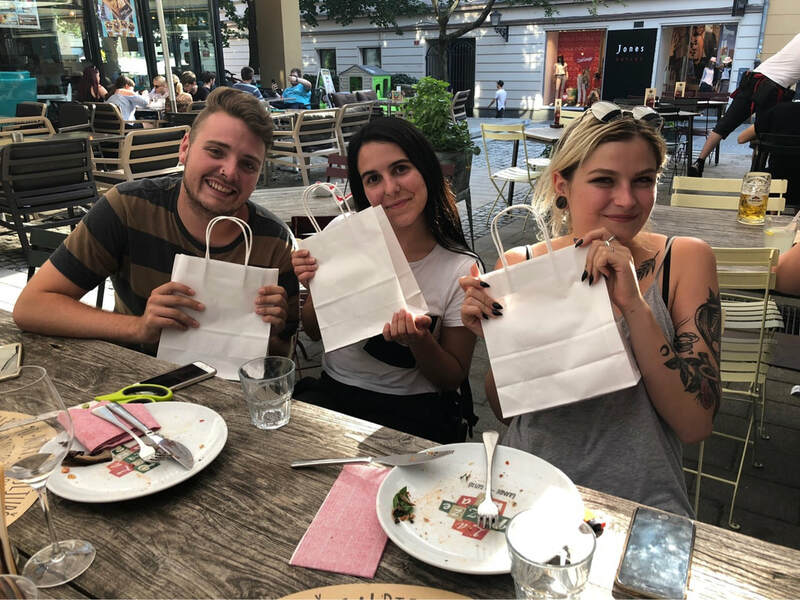 As a part of their work practice at ZNI, Bianca, Andrea and Aurora have organized an activity for all the groups we are currently hosting. 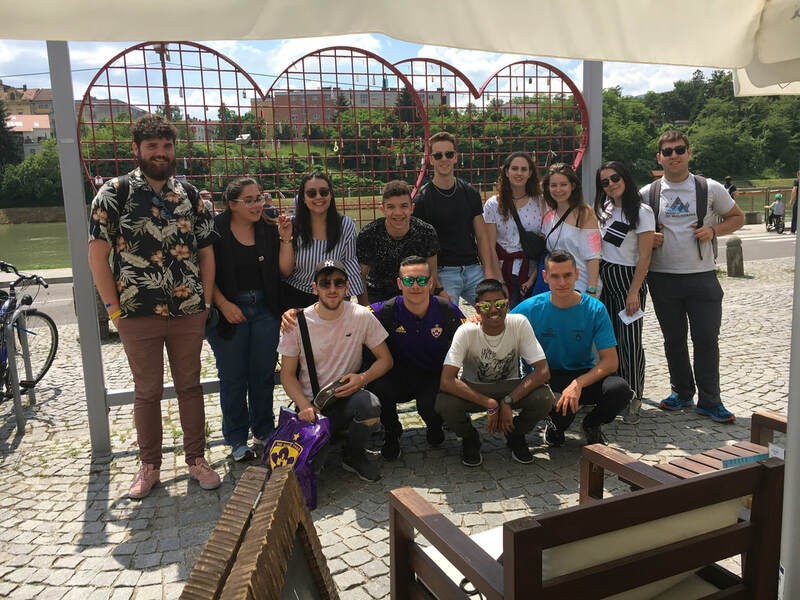 The event was a treasure hunt which took place in the city centre and involved many games and quizzes about food, music and typical cultural aspects of the native countries of our participants. At the end, the groups had a small picnic in Mestni Park and then they took a little trip on the top of Piramida. ZNI WORK PRACTICE - "TALENTI NEODIPLOMATI"
Bianca, Andrea and Aurora, our new interns from the project "Talenti Neodiplomati", are doing their work practice in our office. They are involved in all aspects of our activities: helping us in administration by collecting and editing the data, preparing and archiving the documents, preparing, receiving and registering the post, as well as organising events and activities for the participants we are currently hosting. Welcome to the team, "Talenti"! 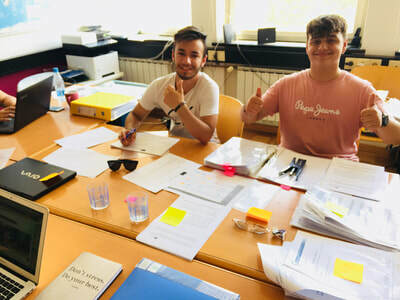 ​The three participants from the second group of "Garanzia Giovani" work in the administration and logistics field for companies specialized in international trade. We went to Pohorje with other Spanish and Italian groups and then spent the afternoon getting to know each other and playing! 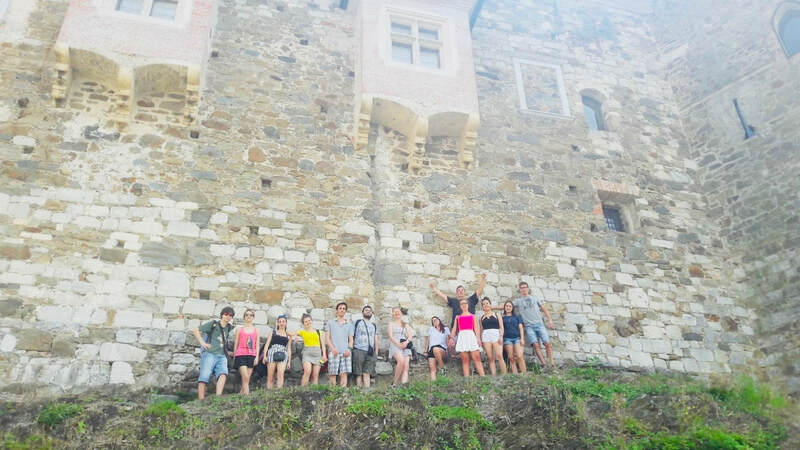 This month we welcomed a new group from the exchange project "Garanzia Giovani". 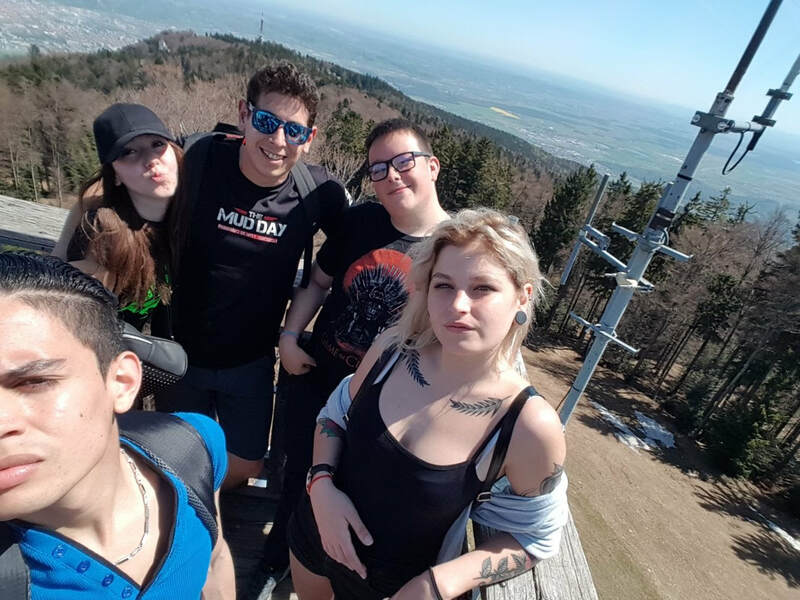 The three participants work in web design and telecommunications companies and together with other groups from Italy and Spain we took a trip to Pohorje, which is a good way to stay in the nature and enjoy a sunny day with other people. Fundación Montemadrid is a foundation which favors young employment. 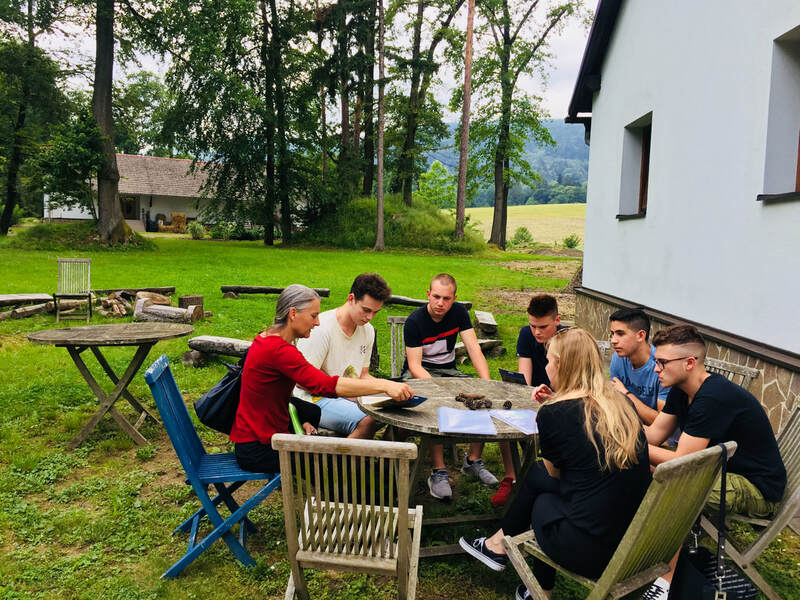 With its cooperation with ZNI, five participants from 17 to 20 years old will have the opportunity to work in Slovenia. Two of them will work in beauty centers specialized in hair styling and personal care, other two of them will work in the Catering field at Nana and in a hotel situated in Draš Center. The last but not least participant will do administrative works at Zavod MARS Maribor. We wish them a pleasant working experience and a lot of fun! ZNI HOSTING - UNISER "VET MOVING"
We had a pleasant time hosting eleven new participants from Italy, for the project Vet Moving. Six of them were Mechanics and helped car mechanics doing tests on cars and using machine tools; two of them did market research, questionnaires, storage maintenance and customer service. Other two participants worked in our office helping with administration and getting an insight on how our organization operates. We are glad that thanks to their mobility program they gained more independence and self-confidence on their skills and abilities. ZNI WORK PRACTICE - UNISER "VET MOVING"
Salvatore and Thomas from our hosting group VET MOVING started with their work practice in our office. Our team is always happy to have new coworkers who can learn a lot from us and we are eager to learn a lot from them, too. It is a pleasure having young future professionals among us! Participants of this project come from Spain, they are from 16 to 20 years old and they worked for many companies in Maribor: two boys worked in the IT department at Nova KBM; three participants worked with elderly people​ at Sončni dom, helping them with meals and social activities and a girl worked with children at Dom Danice Vogrinec. All participants successfully completed their mobility program improving their intercultural communication and easily adapting to their new workplace. We welcomed a new group from Portugal. Five of the participants will be working in the Tourism field and one in Marketing and Management. 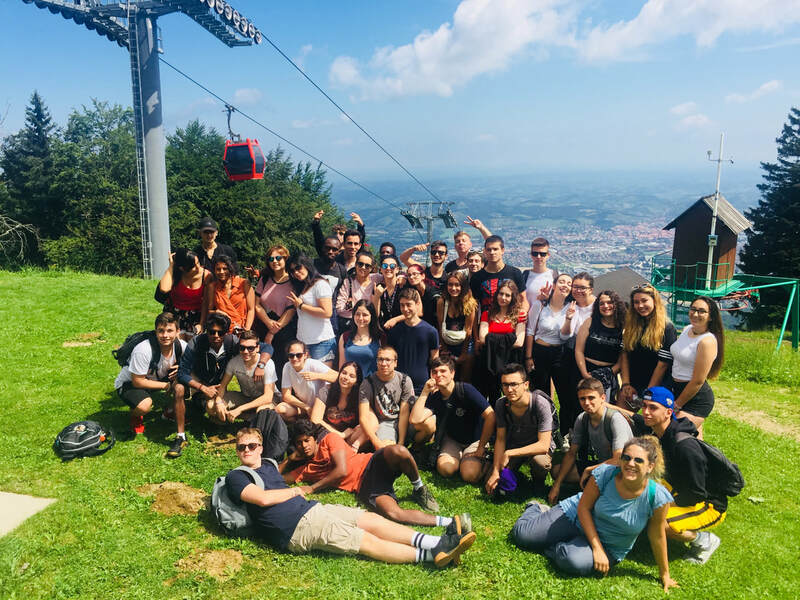 Together with other groups we took a trip to Pohorje, which helped developing friendship and getting to know people from Italy and Spain and their different habits and ideas. We wish them a pleasant stay in our city and we believe this opportunity will contribute to their personal growth! 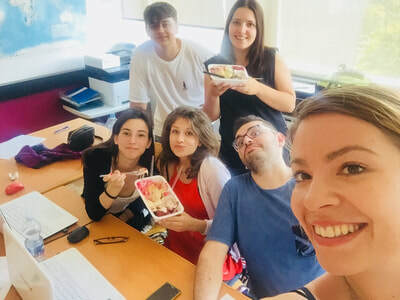 It is time to say goodbye to our interns from Spain, who were working with us in our office. The whole team of our organisation is feeling extremely proud of them, because they have grown significantly! Their English improved, they became more organised and acquired many professional skills, which will increase their future employability. They brought a lot of joy and positive energy among us, so we can say that we will miss them. 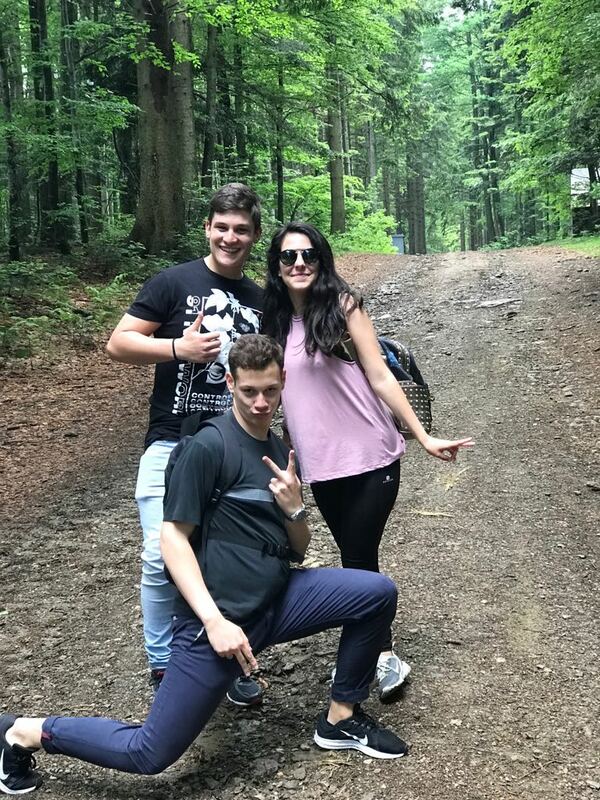 Good luck with achieving your future goals, dear Dario, Paula and Nico! Uniser is a social cooperative that offers training mobility services for students of schools and training institutions. Thanks to our collaboration with Uniser these participants will be professionally, linguistically and culturally enriched. Six of the participants of this project worked in the field of Electronics and Mechanics and the other five of them worked in the field of Chemichal production. They accomplished a lot with this experience and we wish them a bright and joyful future! We welcomed a new group from Spain. Three participants of this project are working in the field of electronic maintenance and one of them is working in administration. They adapted fast and are very motivated. 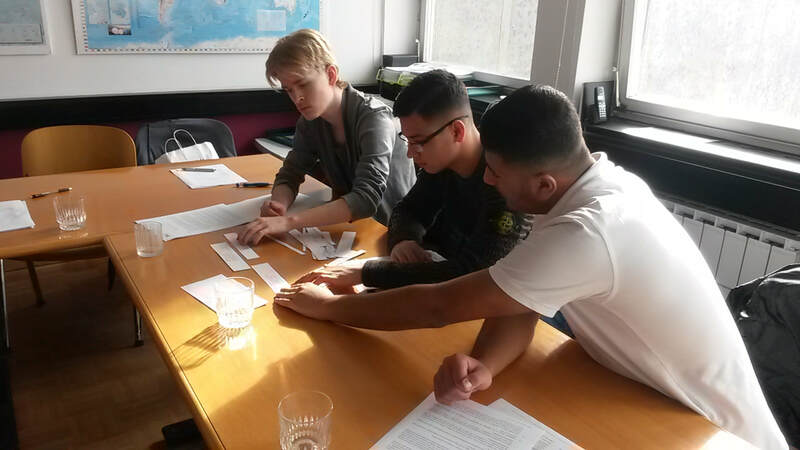 Further more, two of our participants are working on a project to improve working conditions at their work placement. We are very proud to be a part of stories like this and we believe that this experience will contribute importantly to their skills, self confidence and independence. ICARO stands for Information and Communication mobility Actions Result Oriented. The participants of this project are working in the field of IT and telecommunications. The group showed discipline and respect towards ZNI representatives, to the mentors and coworkers in the companies. Their personal skills improved and we believe this will influence their professional skills, which is important for their future employability. We are very happy to collaborate in their professional and intercultural growth. 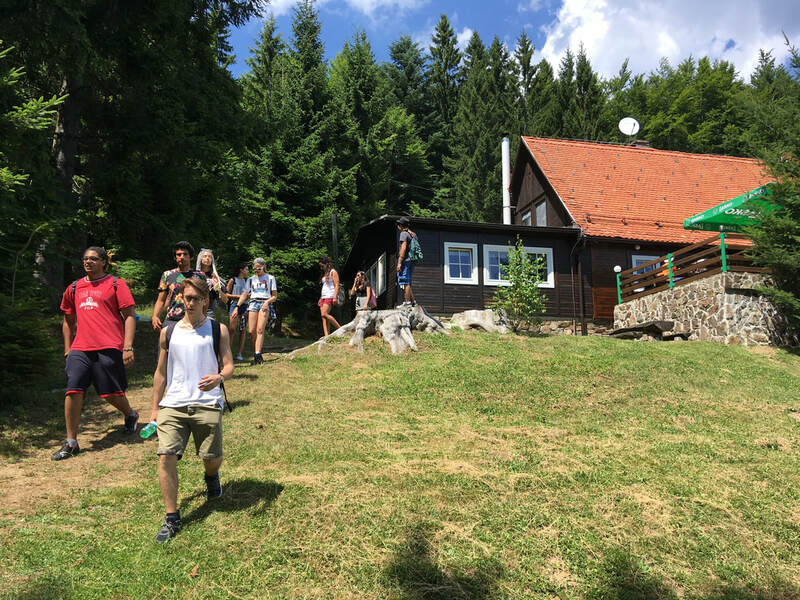 Project Forest4Life offers work practice for students of Agriculture, production and procecssing, Forestry and logging and Countryside and environment management. We welcomed 11 participants. 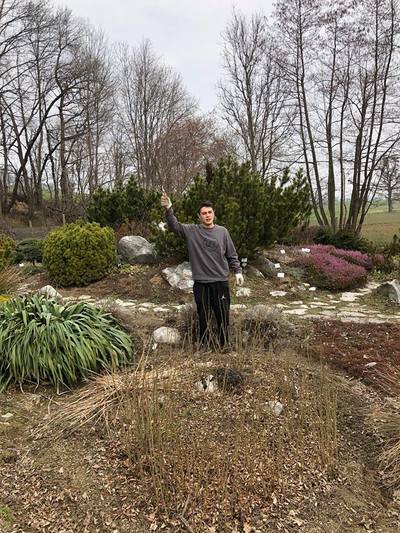 At their work placements they were involved in the project of turning woods into garden, tree planting and seeding, Botanical garden maintenance, landscaping, field work such as tree felling and logging, wood processing, arranging permaculture shafts ... 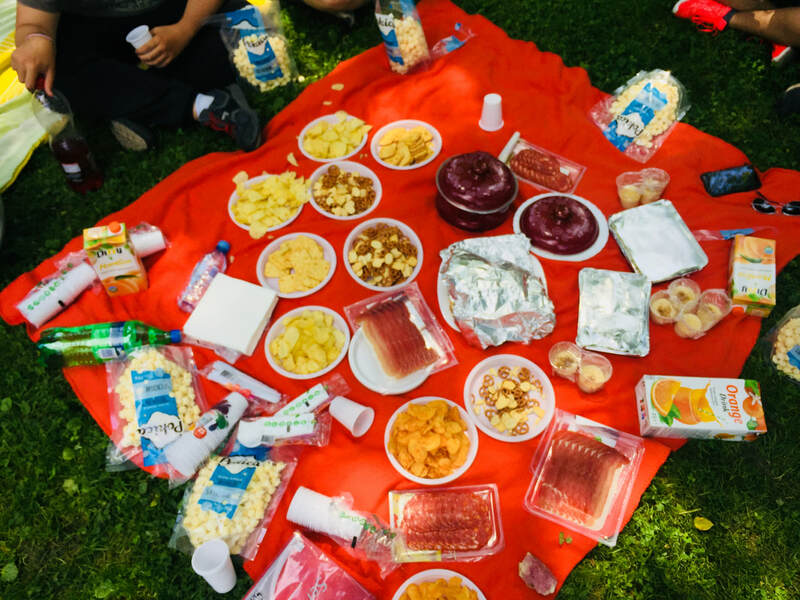 When ZNI organised an international picnic in a city park, this group contributed a lot with bringing Italian cuisine among all participants. 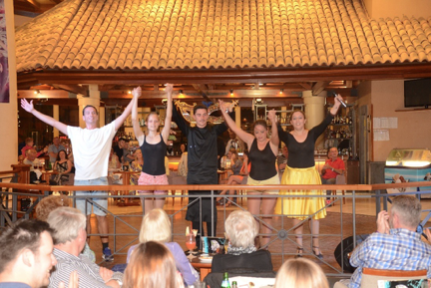 We believe that having a chance to get in real touch with different cultures and food is another plus of a mobility abroad. 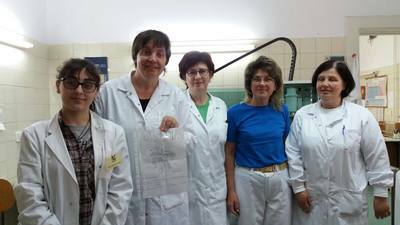 Participants of this project come from Italy and are all studying Technological chemistry, materials and sanitary biotechnology. Their work practices take place in public health center institutions; in Henkel - a production company for beauty care, Impol - a development-oriented company company engaged in reprocessing aluminium; and in a veterinarian hospital. 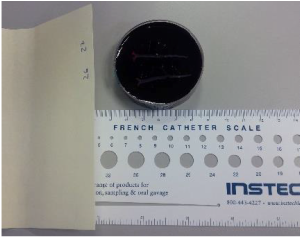 Participants are mainly helping with laboratory diagnostics, analysing the samples and are also involved in any other procedures of the company. 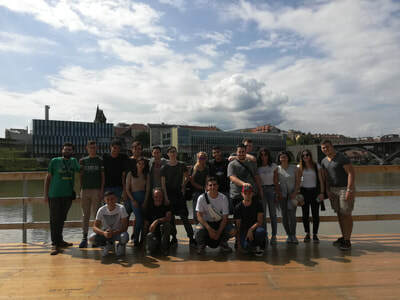 We welcomed six spanish students from the field of Electronics and mechanics who will do their work practice in Slovenia until the 18th of June and another five spanish students who will do their work practice here until 21st of July. Participants from the second group come from the following fields: Marketing & Sales, Administration & Finances and Clinical - Biomedical Laboratory. We wish them a pleasant stay and a precious work experience! 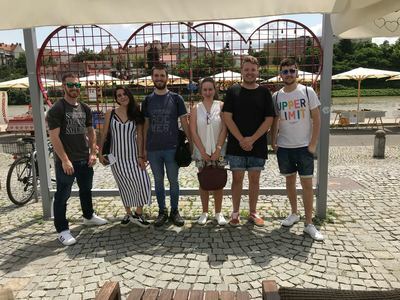 Five students of Tourism from Portugal were welcomed to Maribor in the middle of May. Our interns from Spain showed them around the city, ZNI organised a trip to Pohorje and they also visited Museum of National Liberation to get familiar with our history and culture. Their work practice takes places in Hotel Lent, Hostel Pekarna MKC, touristic agency and shop Cavallo Travel and in Youth Center MCC. Their work practice will last until the mid of July and at ZNI we believe that in that time they will develop many skills and competences which will help them grow both professionally and personally. 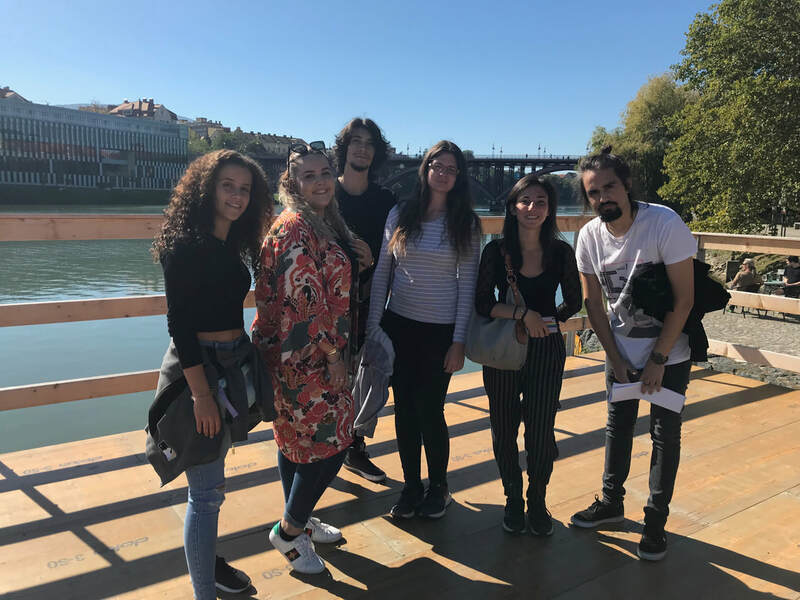 We welcomed three graphic designers, a programmer of Informatic Systems, a industrial machinery mechanic and two healthcare assistants from Portugal! At ZNI we are always excited to host different profiles. We always learn from each other and this is the most important. 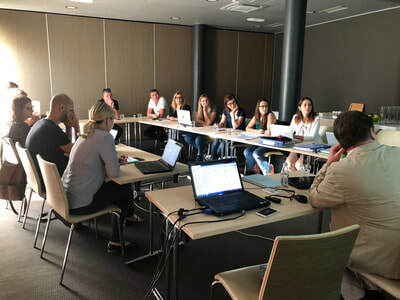 Participants of the Flow 1 will do their work practice in local advertising agency Rdeča oranža, design company Tribar and in Solviks, which is a company that provides full IT support. 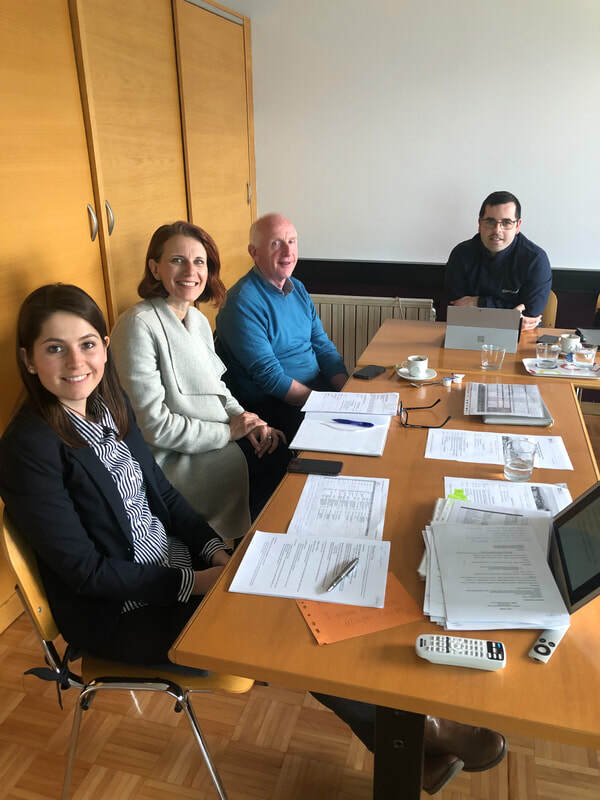 Work practice of the participants of the Flow 2 will take place in an elderly's home Dom starejših občanov Tezno and in a company Avto Koletnik, which is specialized in all mechanical services, vulcanisation and car sales. Finland is known as a country with a great sense for design, in fact some of the world's most imitated and admired designers and architects come from Finland. 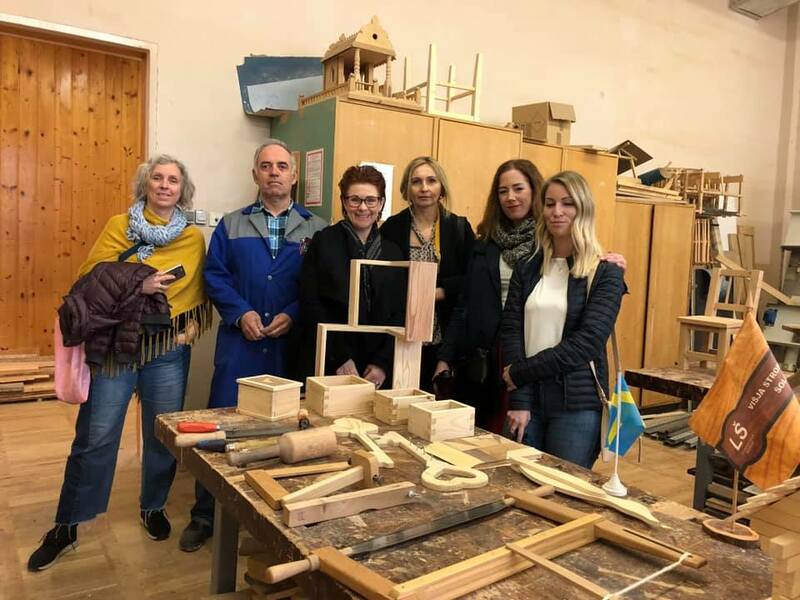 At ZNI we welcomed four participants from Finland who came to do their work practice in the field of Interiour design, painting and decorating. Two of them are creating products and painting, and two of them are working in a store with furniture. We are very happy to host them! 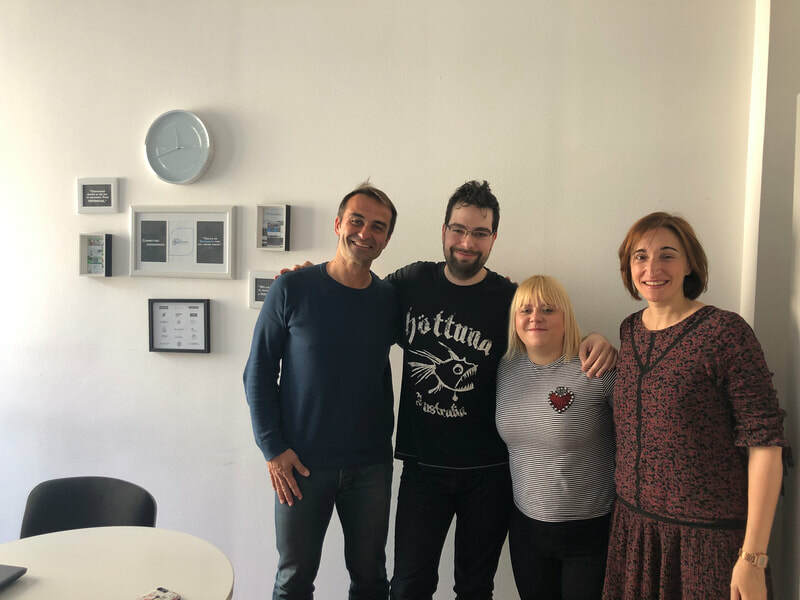 Nicoleta from our group of Estudiantes de Madrid studies Business Administration and she joined Paula and Dario from Mundus at doing the work practice in our office. 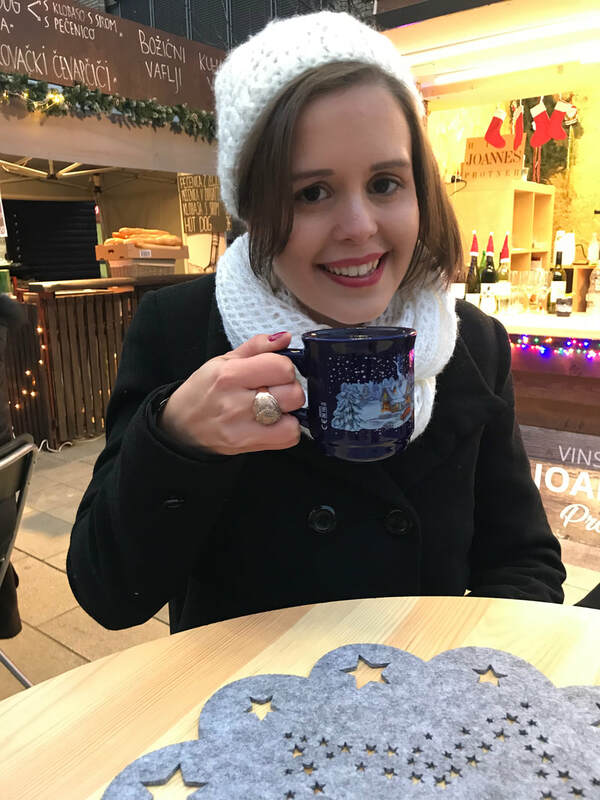 Nico's tasks mainly include taking over and preparation of mail, accounting, preparing info vouchers for our upcoming groups and data processing. We are very happy to have her among us! 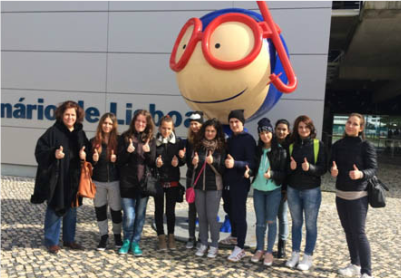 In the beginning of April we welcomed a group from our partner Comunidad de Madrid (Spain). They come from different fields of study - from Auxiliary Nursery Care and Pharmacy to Administration, Telecommunications Installations and Microcomputer Systems and Networks. The participant who studies Business Administration is doing her work practice in our office. Her tasks mainly include taking over and preparation of mail, accounting, preparing info vouchers for our upcoming groups and data processing. 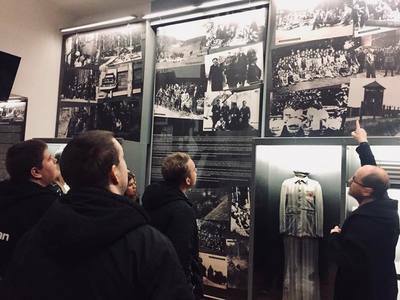 At ZNI we organized a group trip to Ljubljana and Pohorje Mountain, a visit of the Museum of National Liberation and a visit of the Maribor Regional Museum. We believe that a cultural experience is just as important as the work practice, and in this spirit we try to provide the best we can! Participants of this project come from Italy, from our partner UNISER. They are students of Mechanics and Electronics, Chemical production and Biotechnology and IT and Telecommunications. They are from 17 to 19 years old, so they came accompanied by their tutor. 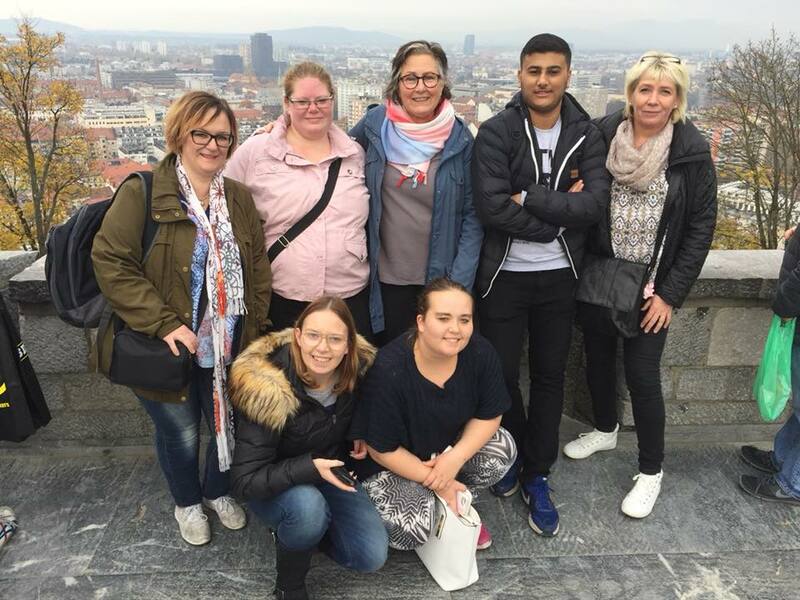 As we normally do, we arranged an accomodation, local public transfer and workplacements for them, and they did an amazing job! They proved that being very young and yet hardworking, responsible and willing to learn is not impossible. At ZNI we feel privileged to host this encouraging group! We were happy to welcome our participant of this project, who comes from France. He works in a bakery. He is very determined but also flexible. He joined a trip to Ljubljana and Pohorje with our other groups and they got to know each other. 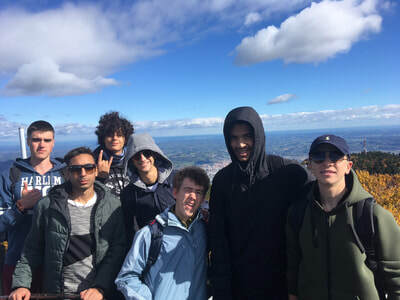 This experience is very precious for him since he is sharing his accommodation with four of our Spanish participants and has to adjust to a lot of Spanish language. At first he felt a bit out of comfort zone because of this, but this is another important experience you get during a mobility. With time they got really close and now they spend most of their free time together. 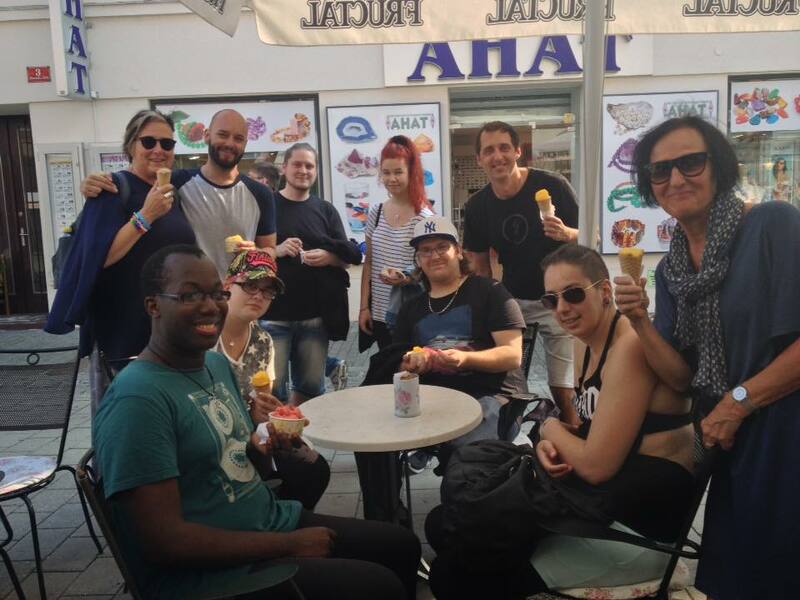 At ZNI we are very happy to provide such amazing experiences for our participants! In this project we are hosting only one participant from Spain. She is working in a hotel at the reception and helping in any other way needed. Her hosting company is very satisfied with her work. She is very confident, open, ready for any challenge, independent and happy to be here. 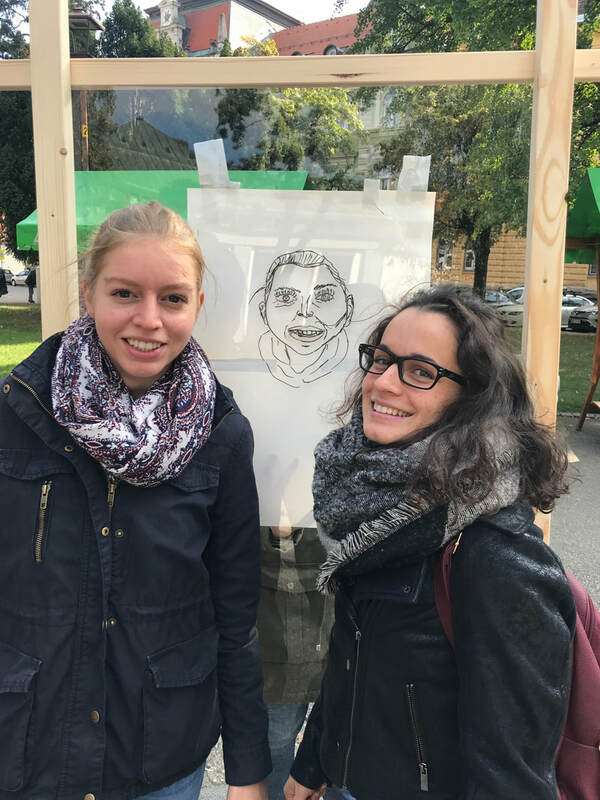 She already learned some expressions in Slovenian language since we also organised a Slovenian language course. She gets along with our other group from Spain very well and they travelled to Croatia during spring break together. 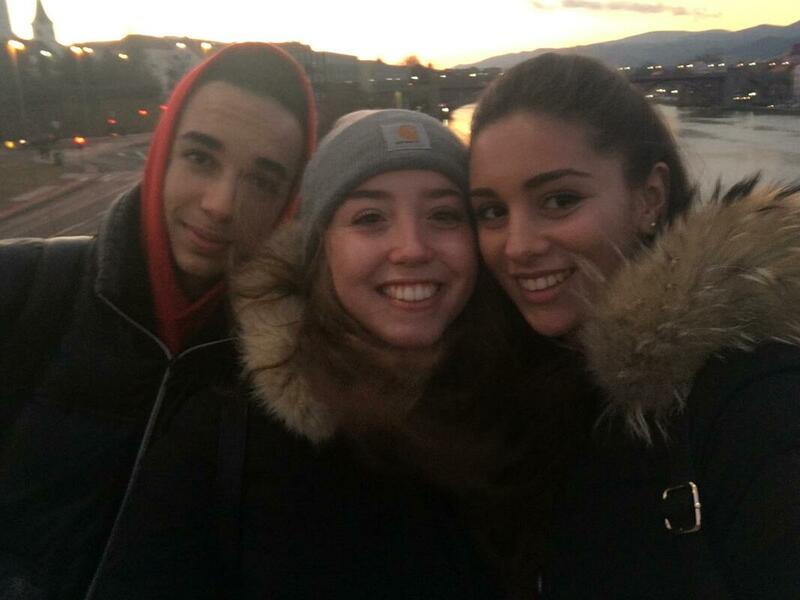 They also live together with another participant from France. 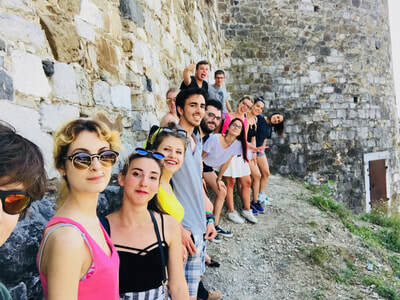 At ZNI we believe that besides the international work practice it is also a very special experience to share accommodation with the people you have just met, because it helps you grow as a person. We are hosting a swedish group of 10 participants of our partner Activa. Together we guide and support participants who have any difficulties collaborating in workforce beause of any kind of disability or illnes. Our participants are facing many challenges and we are here to support them in every way. 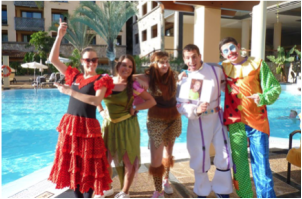 It is our pleasure to help them overcome all of their fears, insecurities and stressful situations. They are doing very good and more importantly, they are getting stronger and more independent day by day. 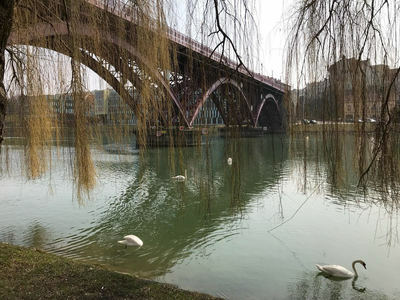 They like Maribor and it's natural surroundings very much. 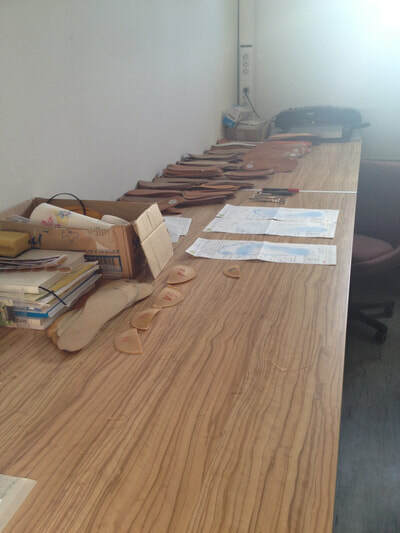 Projects like this have an added value for our ZNI team, because they enrich our unique methodologies of human resource development. We welcomed a group from Ireland. 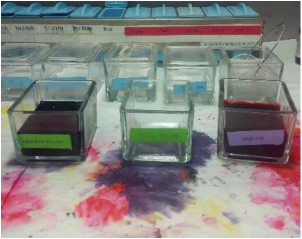 All of the participants worked in the National Laboratory of Health, Environment and Food in the department of Medical Microbiology and in the department of Chemical analysis of food, water and other samples. They were very interested in acquiring new knowledge, new culture and people. We organized a trip to Ljubljana and to Pohorje Mountain for them and they were very enthusiastic about it. The outcome of this project was very positive both in educational and cultural aspect, and at ZNI we are really happy to be a part of it. 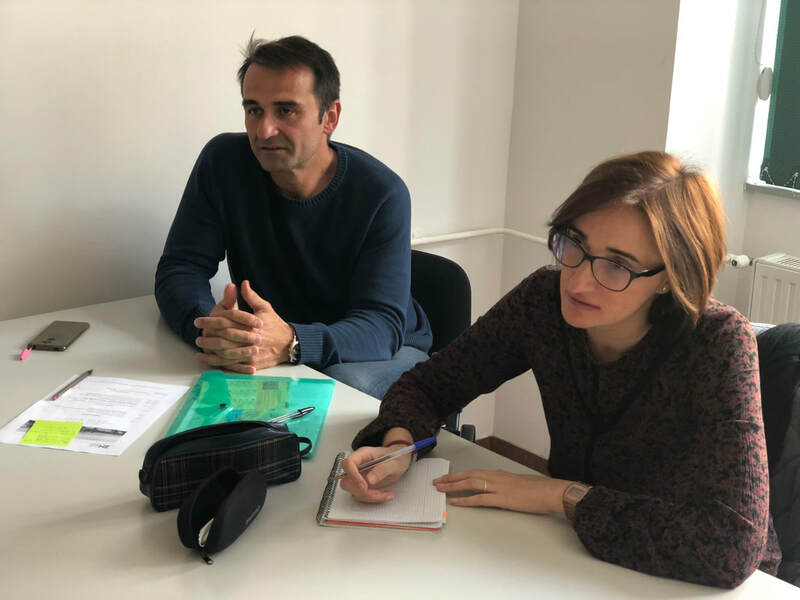 Paula and Dario from our Mundus group study Administration and they are doing their work practice in our office. This is a precious experience also for us, because we get to be both the coordinator and the hosting company. 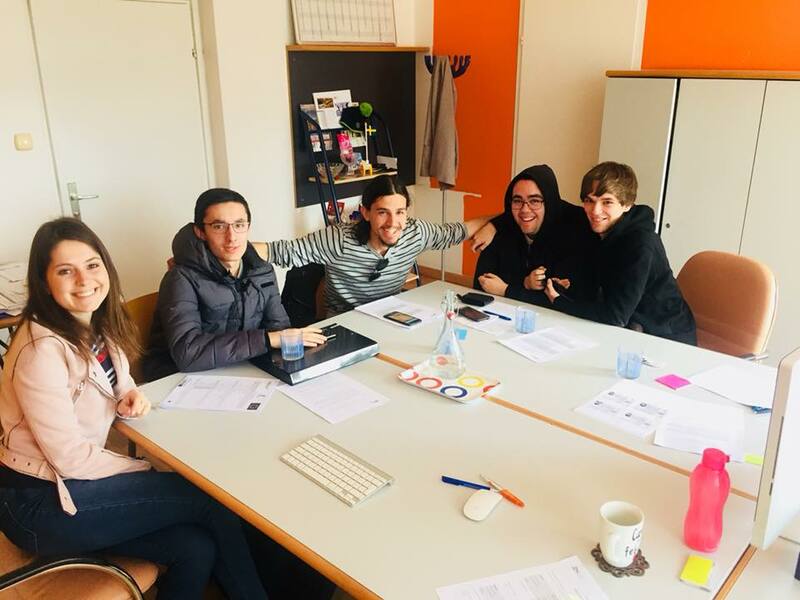 They are helping us preparing the documents for our groups, searching and archiving data and organizing international events for all of our groups that are currently here. 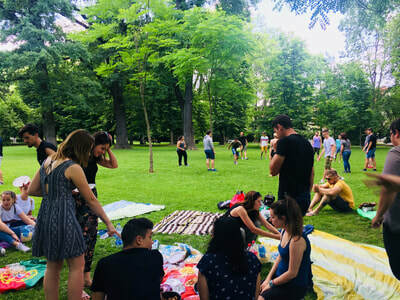 Recently they organized an event in the city park - Zumba class and international picnic. Very well done! Some of the participants of this project are Medical Laboratory Technicians, some are Administrators and another one comes from the field of IT. For all of them this mobility is an important experience - besides the personal growth they are improving their English distinctively. 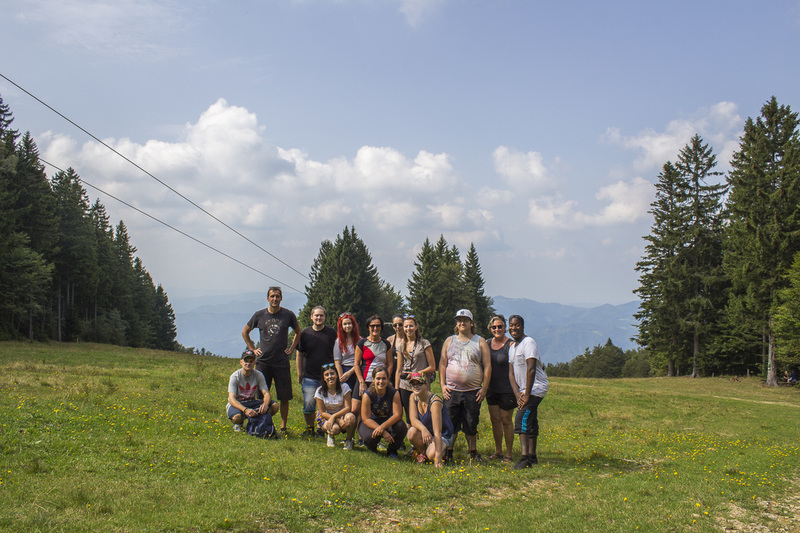 The majority of the group went for a trip to Kranjska Gora together and they loved it. 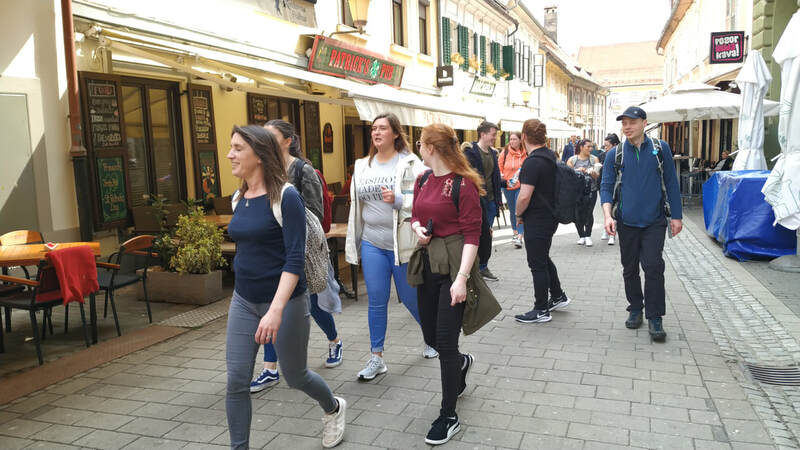 During the spring break they travelled to Croatia and had a great time exploring new places, which is another good side of any mobility. We welcomed a Portuguese group of students. They were working in restaurants and bars in Maribor. They were very successful because they overcame the language barriers with a smile and humour. They learned some basic Slovenian words needed for the customer service. They found our language difficult and at times funny, because it is very different from other languages that they are familiar with. We organised a trip to Ljubljana together with our groups from Sweden and Italy. Unfortunately we got caught by rain, but our Portuguese group agrees that a rainy day in Slovenia is nothing in comparisson to a rainy day in Portugal - because the rain is accompanied with a lot of wind there. 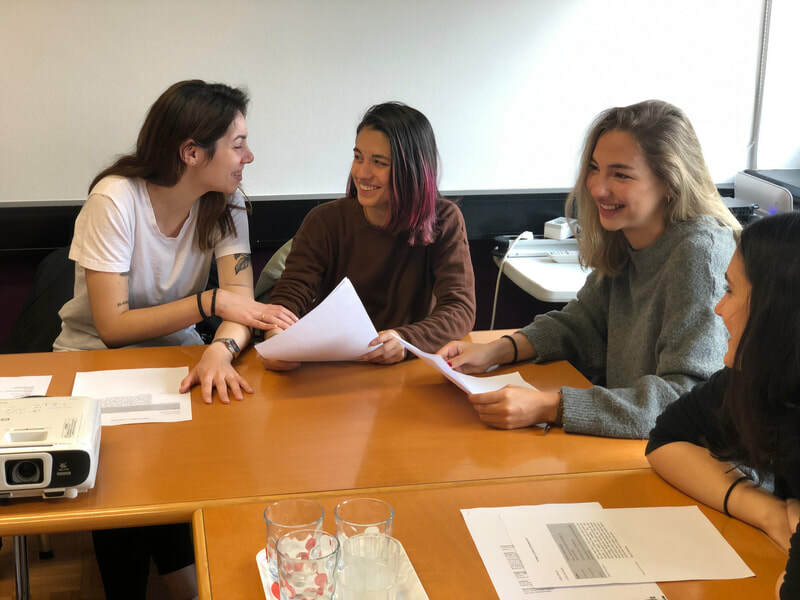 The participants of this project had a lot of fun at their work practice, because they are very positive and make everyone laugh. We are very happy with the outcome of this project. 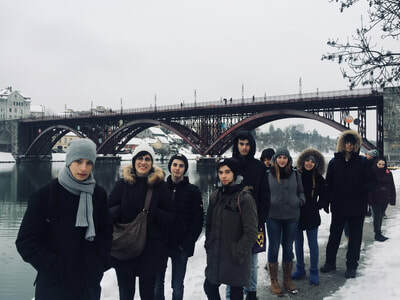 Participants from the project YOU are Italian students of agriculture. 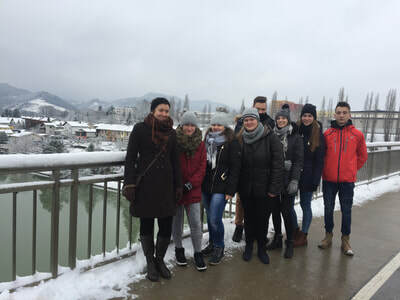 At the beginning we thought we will have difficulties with workplacements because we still had winter in Maribor, but everything turned out well eventually. Our participants worked in different farms, gardenings, botanic gardens and in permaculture institute. It was not always easy, but they were successful and we are very proud of them. Their employers in the workplacements were also satisfied with them and it was a good experience for all parties. We are happy to be a part of this project. At the beginning of March we had an honour to welcome another participant from Finland - Saara. 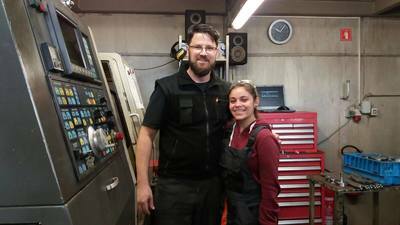 She studies security and her work practice takes place in Ljubljana, in a Slovenian company Varnost Arh. She is very independent, willing to learn a lot and wants to improve her international communication skills. Her arrival was on the same time as of our group YOU from Italy, so we started the official programme together. 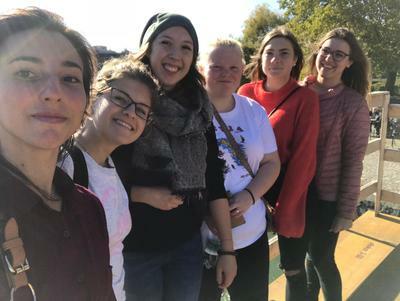 We had a city tour and visited the Musem of National Liberation together and this was a very positive experience for Saara because of the intercultural differences. 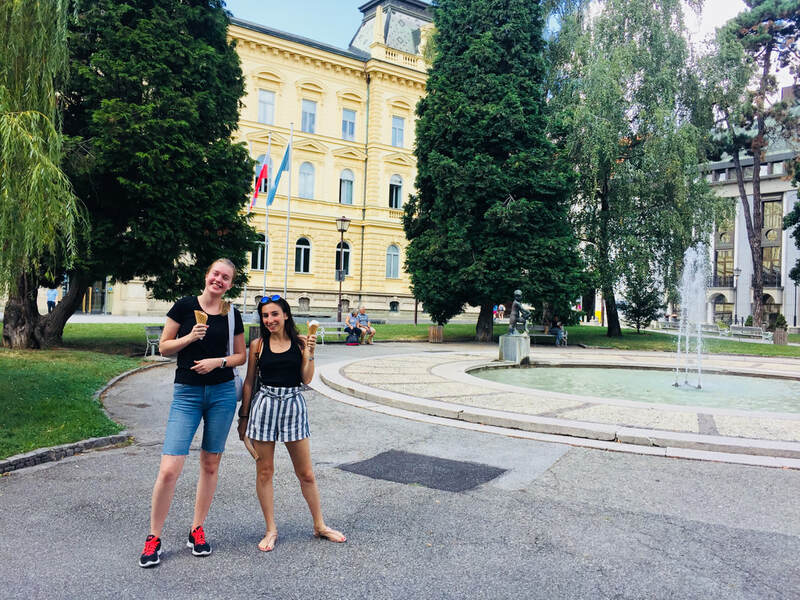 Besides the meetings, which are a part of the programme, we are very happy to meet Saara to spend some spare time together in Ljubljana when we come there for a trip with our new groups. Our team is sure that the outcome of Saara's mobility will be very positive because of her attitude to work, willingness to learn and curiosity for new cultures. Europe in Reach is a project of our partner Activa from Sweden. Together we guide and support men and women who have any difficulties with accessing the labour market, due to their illness or disability. 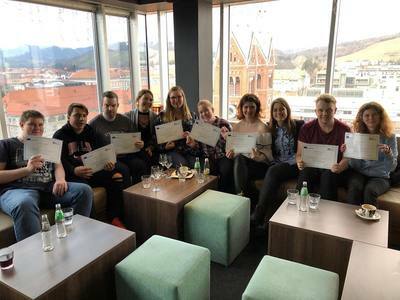 Participants of this project worked in Dijaški dom Maribor - Youth Hostel Maribor, Dom Danice Vogrinec - Nursing Home Danica Vogrinec, Euroteks.si - Secondhand Shop Euroteks, Pekarna Europa - Bakery Europa, Jager center - Commerce Center Jager and NANA Cafe & Lounge bar. We also visited Pohorje Mountain, our capital city Ljubljana and Museum of National Liberty to help them understand our history and culture even more. 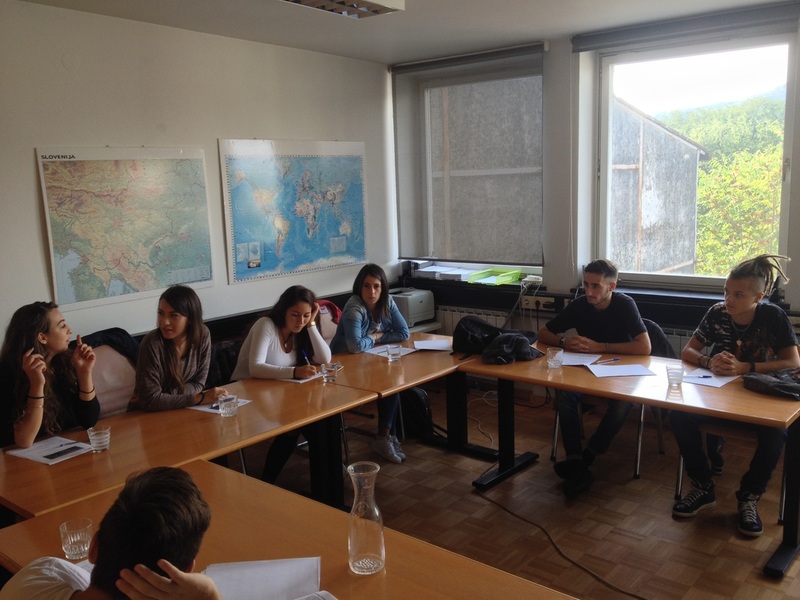 All participants were also doing Slovene - English language course. 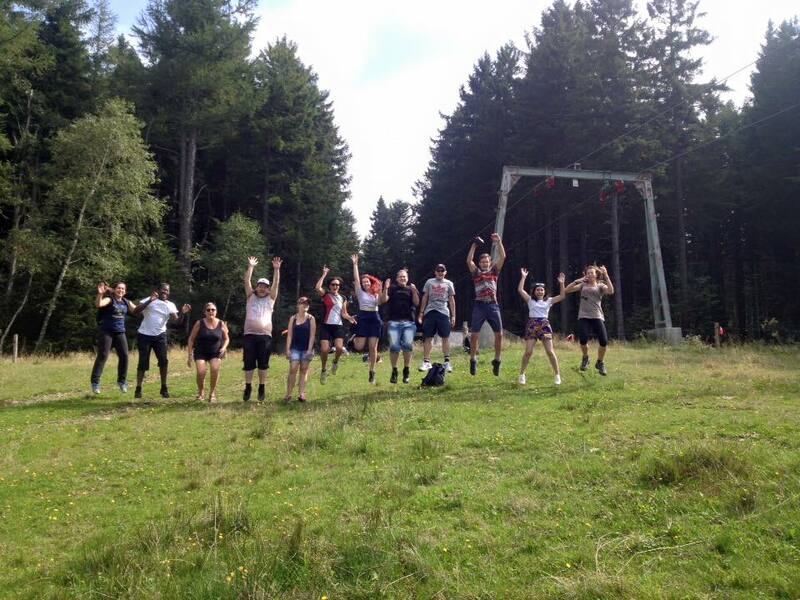 At ZNI we are very proud on all of the participants, because they faced many challenges with courage and optimism. We believe that their mobility is a very important experience for the future. 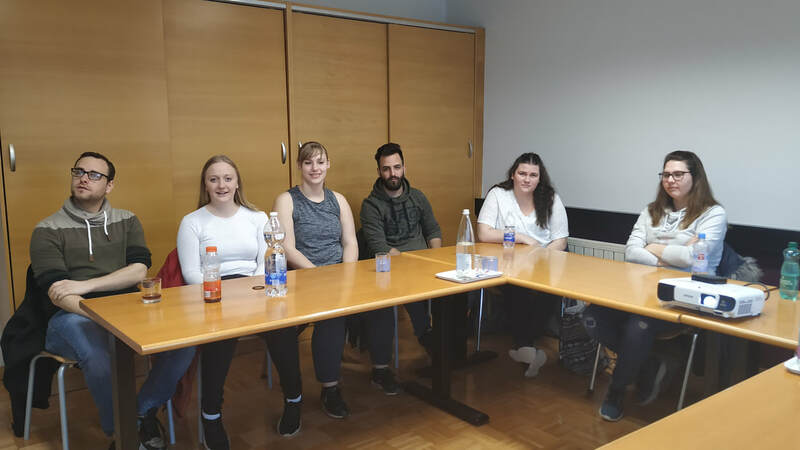 In the first days of February we welcomed 2 participants from Finland, who will do their work practice at a Slovenian security company Varnost Arh. 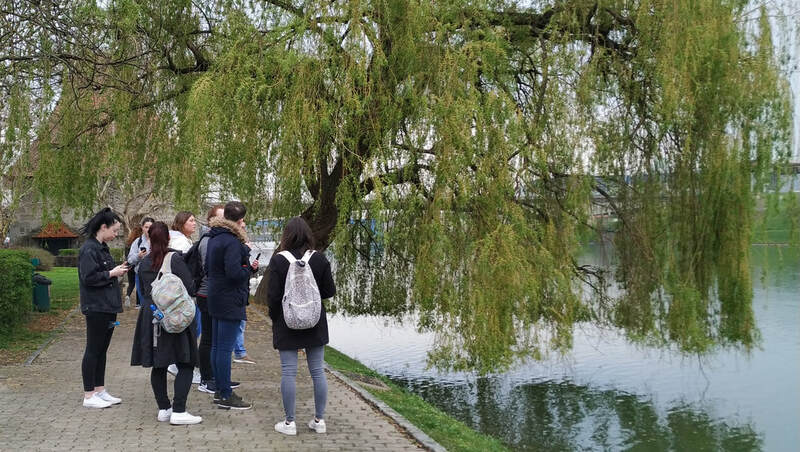 The programme started with a guided city tour: language activites around the city. 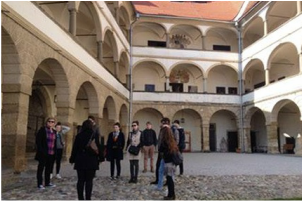 We also visited the Regional museum and Maribor Castle. Now they are staying and working in our capital, Ljubljana. They became very independent and have left their fear of the unknown behind. 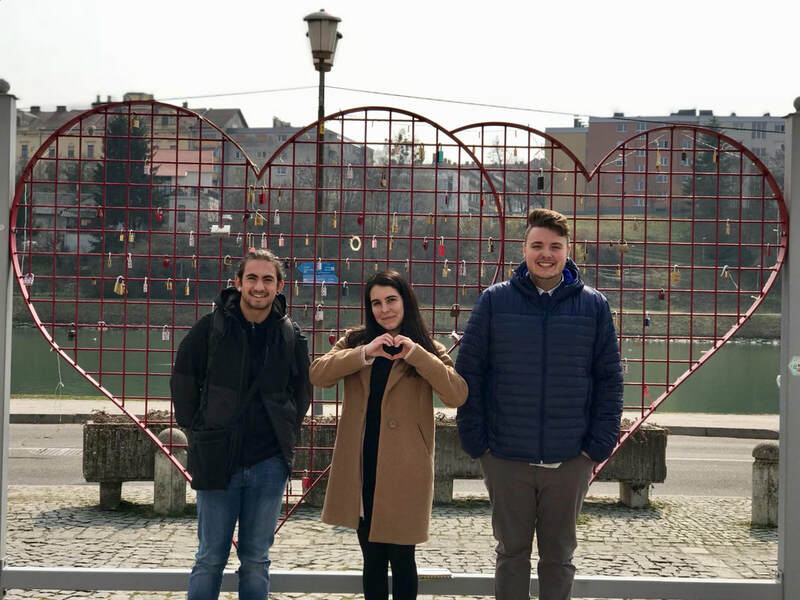 During their work practice they became friends with one of their Slovenian coworkers, who showed them the most hidden but precious places in the city. At ZNI we believe that getting to know local people and experiencing their lifestyle is an added value to every mobility. We hosted a group of 10 participants from Italy, Latina. The concept of this project is galleries, museum and art. Their work practice took place in Društvo za razvoj filmske kulture - Organization for Development of Film Culture, Mladinski kulturni center Maribor - Youth Cultural Centre Maribor, Kulturno izobraževalno društvo KIBLA - Association for Culture and Education KIBLA, Muzej narodne osvoboditve Maribor - National Liberation Museum, Pokrajinski muzej Maribor - Regional Museum Maribor and Zavod MARS - Organization MARS. Together with the group Powervet we visited Ptuj carnival - Kurentovanje. Kurentovanje features a number of folk and carnival parades, presentations of traditional costumes, concerts, masquerade balls, exhibitions and a lot more. This was definitely a very special experience for our participants of this project and we are very happy to be a part of it. We were happy to welcome our first group and start with mobilities for the upcoming year. 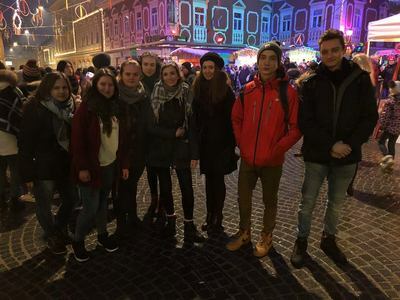 We are currently hosting a group of 7 participants and their tutor from Poland, who arrived in the middle of January. 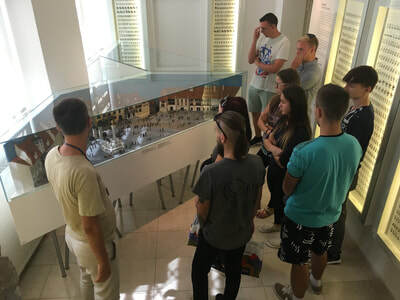 They already had the city tour and preparation week, safety at work course and have visited the Regional Museum and National Liberation Museum. 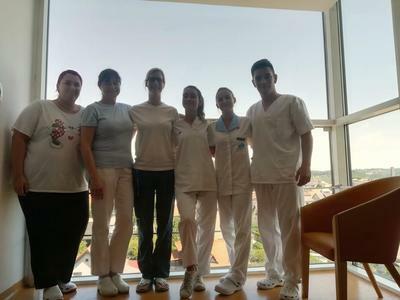 The work practices have started and all of them are working in Celje, in the orthopedic sector. Everybody is happy wih their work placement and the feedback from the companies is positive as well. 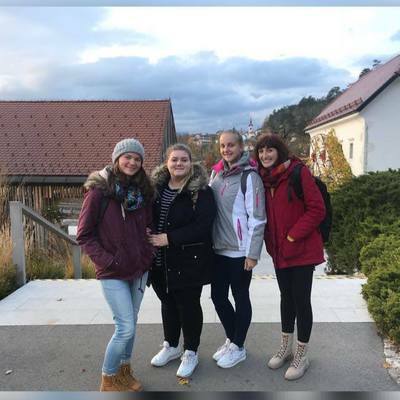 The group is very excited about what Slovenia has to offer and they have so far visited Ljubljana and Postojna cave. 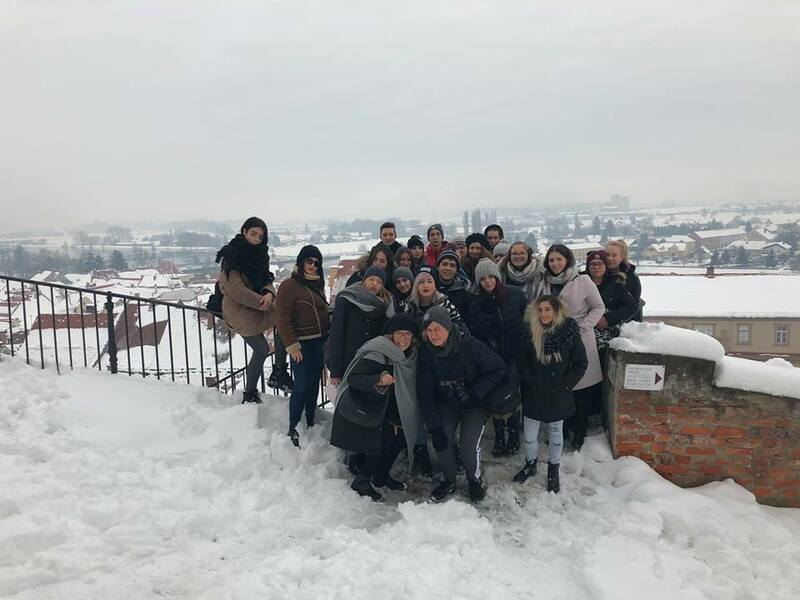 This weekend they will visit Ptuj and experience the beginning of the Carnival. ZNI wishes them a pleasant stay in Maribor, hopes that they will make lots of new memories and have a successful mobility. At the beginning of December, a group of 10 participants from Italy arrived, to complete their work practice in companies in Maribor. 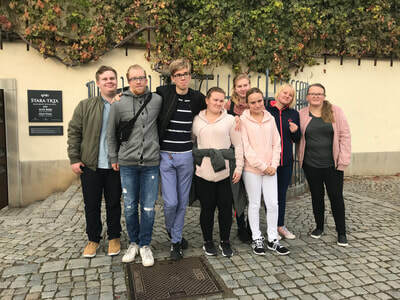 They will be staying here for three weeks and in their first week, they completed their preparation week, safety at work course, workshops, visited museums etc. They also went to Ljubljana to see the Christmas lights, where our volunteer Dimitar gave them a tour. Their work practices already started and they will return home before the holidays. 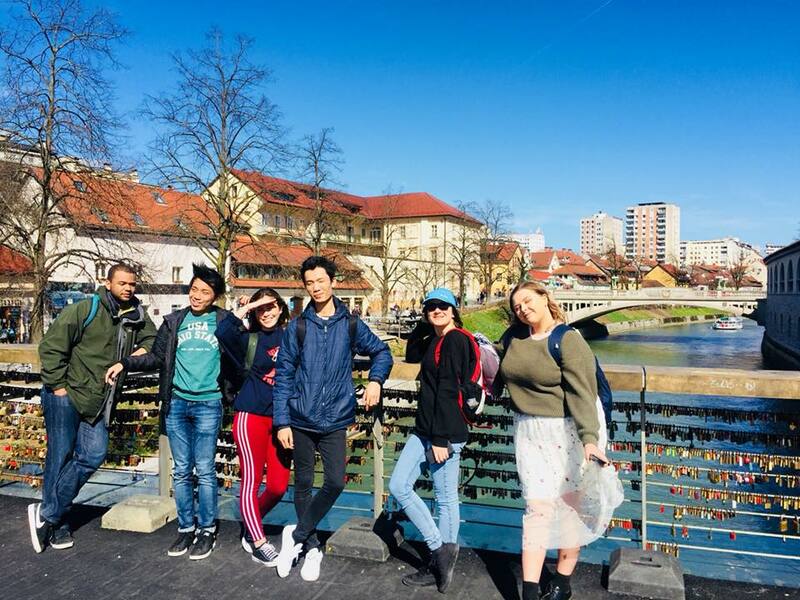 We wish them all to have a successful experience and a pleasant stay in Maribor. Aktivnosti v projektu Staff Mobility: Learning to Play so v polnem teku. V projekt je vključenih osem vzgojiteljic iz vrtca Borisa Pečeta Maribor, Ivana Glinška, Jadvige Golež in vrtca Studenci Maribor. 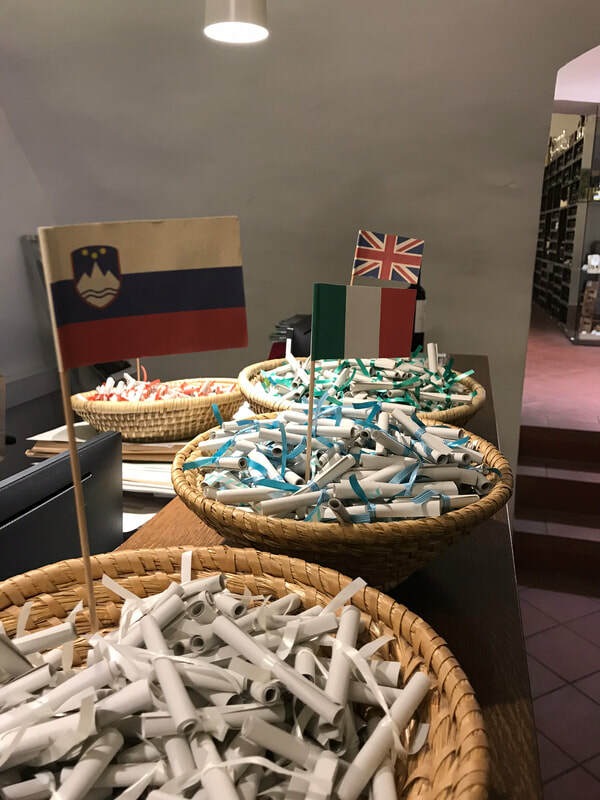 Nekatere so svojo mobilnost že zaključile, dve pa sta trenutno v Italiji in Španiji, kjer pridobivata nove izkušnje. Z vami delimo njihove utrinke, o katerih si lahko več preberete tukaj. We have welcomed two groups at the end of October and in the beginning of November. 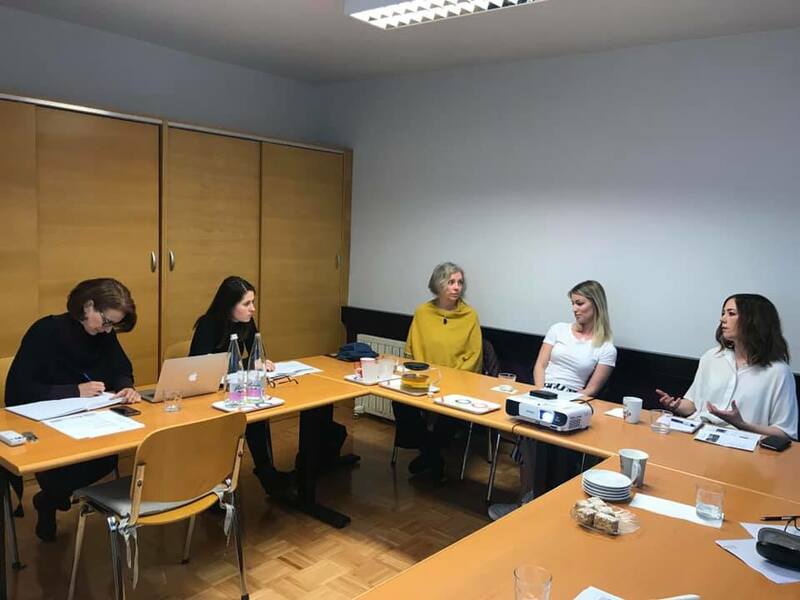 Seven participants from the Swedish group Activa will stay here until the end of November and they have already started their work practices in companies partnering with ZNI. They are working in a kindergarten, a second hand shop, the dormitory kitchen and Snaga. Then, at the beginning of November, four more students from the italian group TECOD arrived and are having their preparation week at the moment. 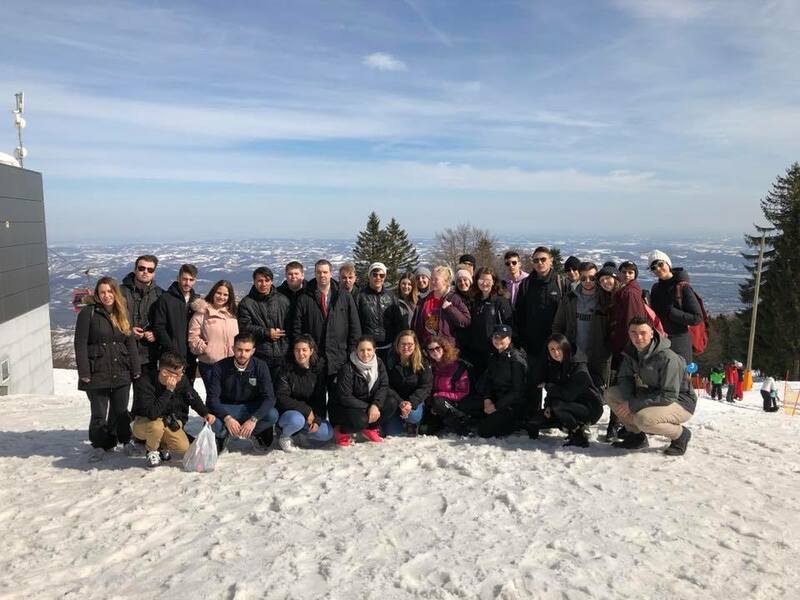 They will begin their work practices next week and prior to that they will go together with the Activa group to Pohorje. 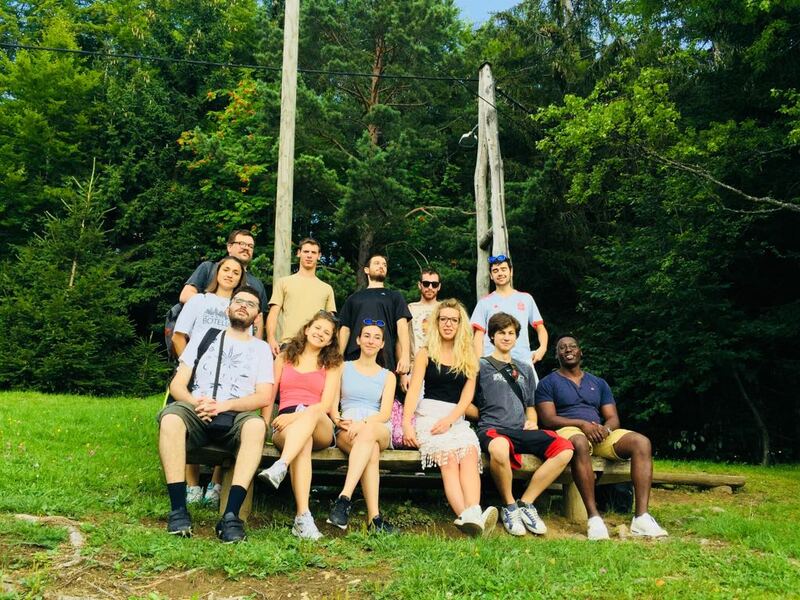 ZNI team wishes them unique experiences and an enjoyable stay in Maribor. Nov razpis za mobilnost študentov - projekt 2016 - NEKAJ MEST ŠE VEDNO NA VOLJO! Odprt je nov razpis z namenom praktičnega usposabljanja v državah Evropske unije v okviru programa Erasmus + in projekta Mobility for Enhancement of students Employability III. Razpis bo odprt do porabe sredstev, mobilnost se mora zaključiti do 31.05.2018! 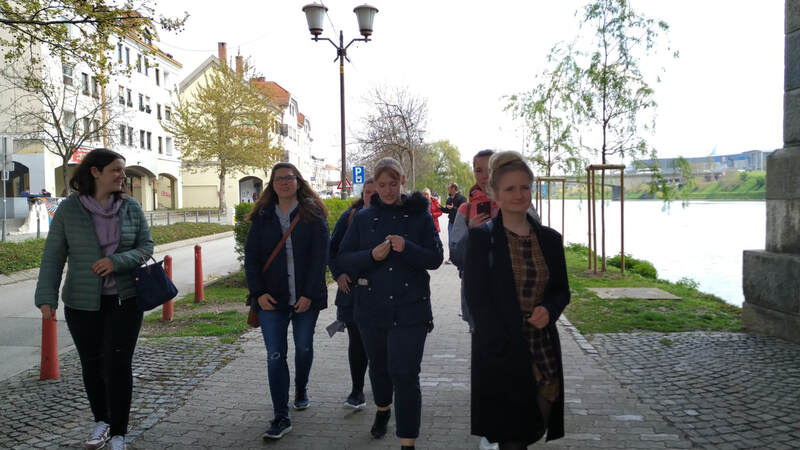 Two participants from Anna Warburg Schule in Germany came to Maribor to complete their one month long mobility in two kindergartens - Vrtec Borisa Pečeta and Vrtec Studenci Maribor. They are working with children from 1 to 6 years old and are getting along very well with both the children and the teachers. The kindergartens are very happy for their help and have only positive things to say about them. The girls have so far explored Ljubljana, Pohorje and different museums with ZNI and they also visited Postojna cave in their free time. 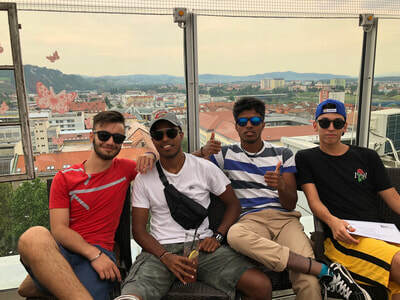 They are enjoying their stay in Maribor and we wish them enjoyable final days before they leave for Germany. 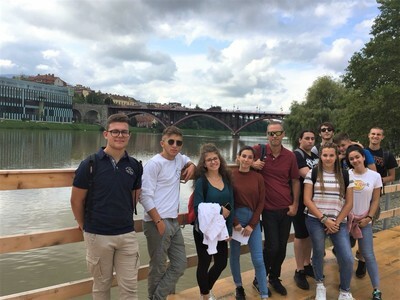 In October a group of 10 participants from different technical schools in Italy arrived to Maribor. They spent their one month long work practices in different companies in Maribor and Ptuj. Most of them were working in mechanical workshops and in IT companies, while one girl was working in a tourist agency. 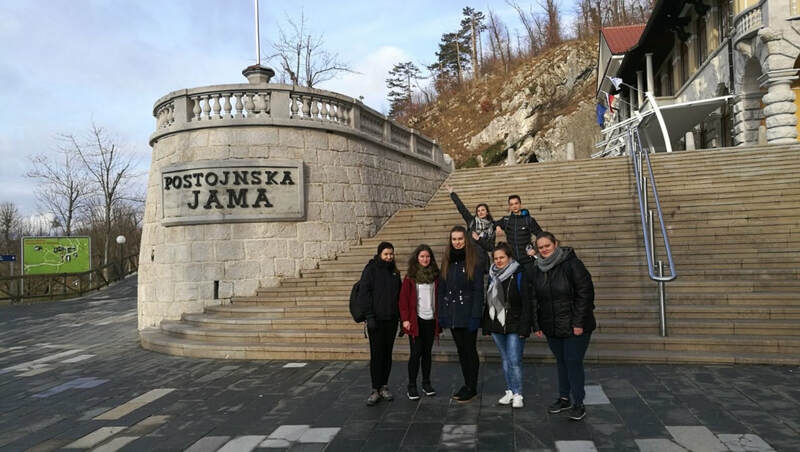 They had their personal and cultural training with ZNI, which involved trips to Pohorje and Ljubljana, visit to the museums, interview preparations, safety at work workshops etc. 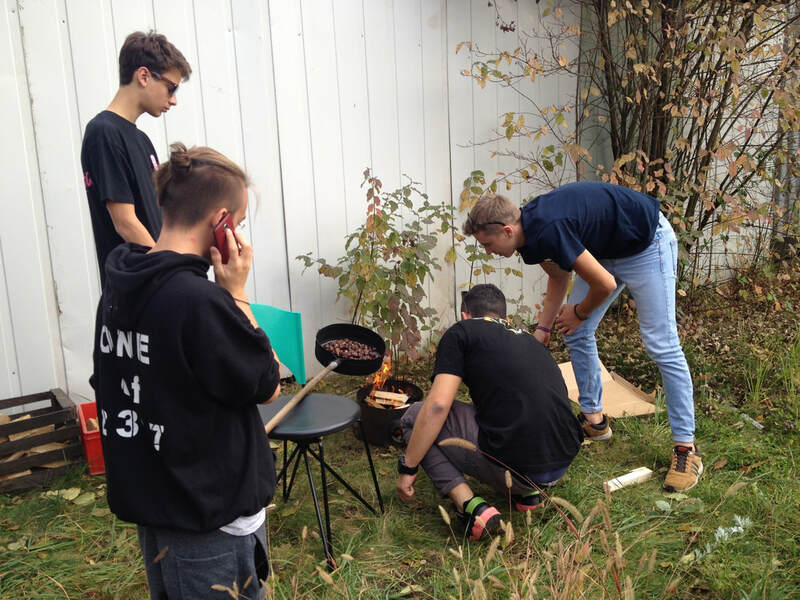 We organised a chestnut picnic for them and you can see them roasting the chestnuts on the picture. 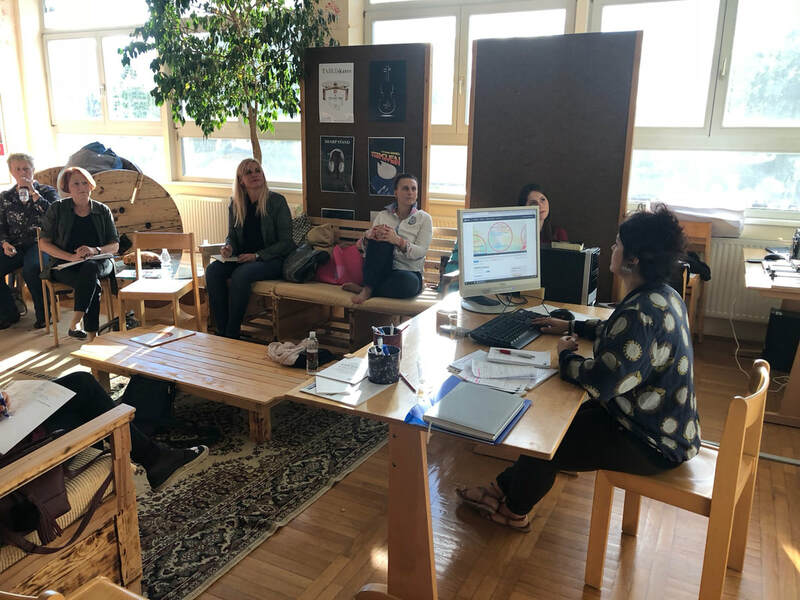 The feedback from both the participants and the companies was very positive and we are sure that everybody gained a lot from this experience for their future. 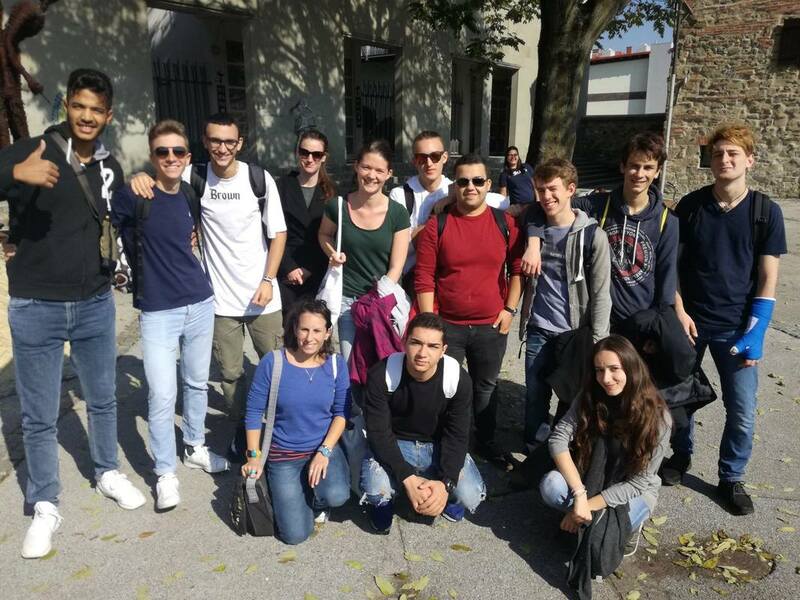 At the end of September we welcomed another Uniser group of 10 participants from Italy. 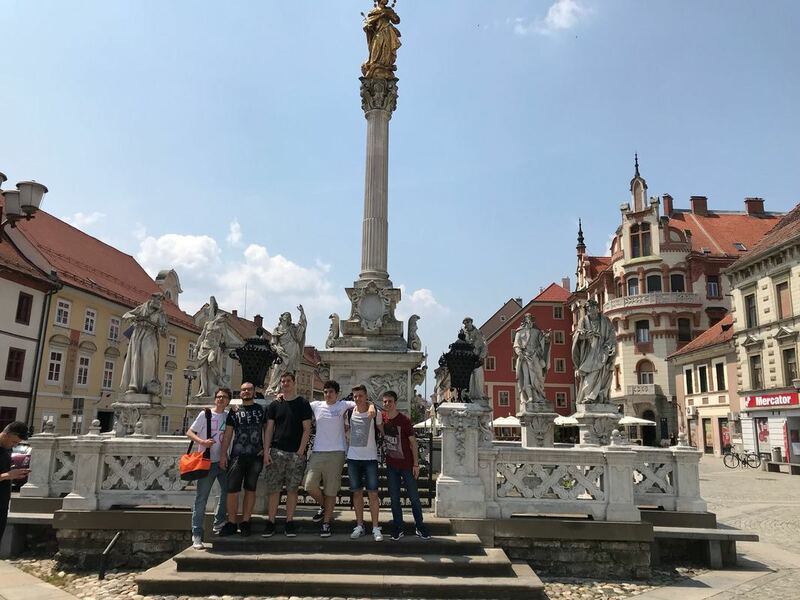 They spent their days exploring the city, attended the preparation week, went on trips to Pohorje and Ljubljana and did their working practice in different companies in the fields of marketing, tourism, IT, mechanical workshops etc. They integrated very well in the Erasmus community in Maribor and even joined the International Dinner at Štuk, which was organised by ESN Maribor. 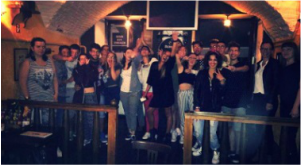 They presented Italian food and met Erasmus students from other countries. 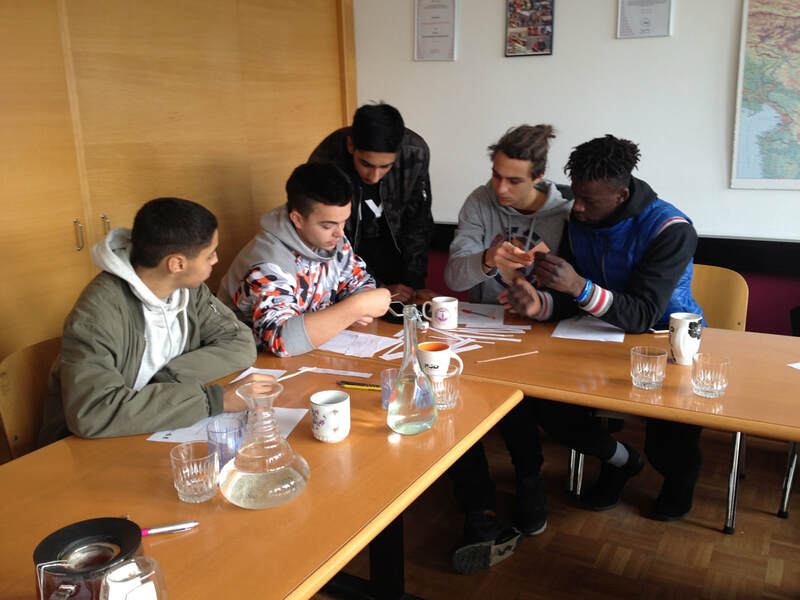 The participants socialised very well with ZNI's other groups and were motivated and enthusiastic. Their mobility was very successful, the participants learned a lot from this experience and we were happy to host them. Group of 7 mobility participants from Medical school in Prudnik, the orthopedic tehnicans, arrived to Maribor this weekend. They have spent first day outside exploring the city. 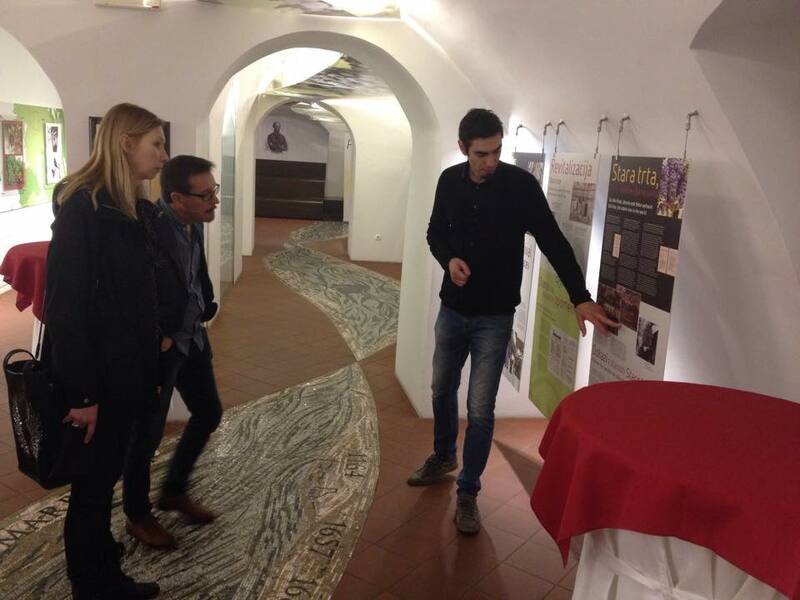 They visited Regional Musem in the city Castle and we presented them the must see places in Slovenia. They also had a work course at Institute for safety at work and we prepared them for the first interview at work placement. Yesterday it was already their first working day in different Slovenian companies in the field of Orthopedics. We are happy to host them and we wish them lots of pleasure in the following weeks! 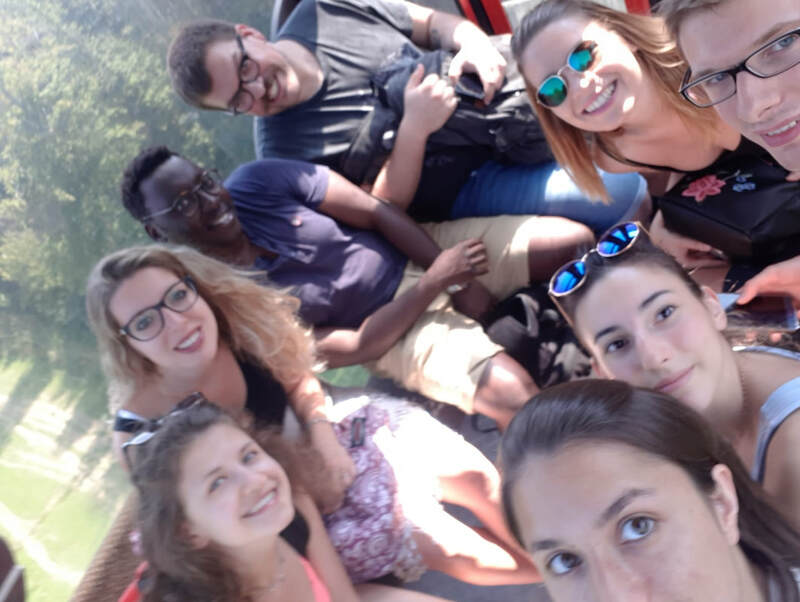 In July we welcomed two groups from Italy: TECOD and Talenti Neodiplomati. 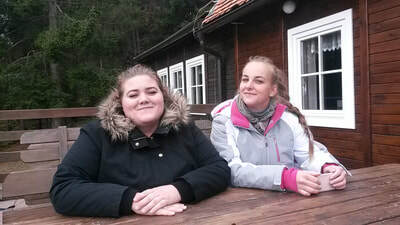 Two girls will stay in Maribor for 6 weeks and others will be involved in 12 week long program. Preparations took place during the first week of mobility, when participants were involved in personal and cultural training. The second phase of the programme began when participants started their internship and were placed in local companies partnering with ZNI. 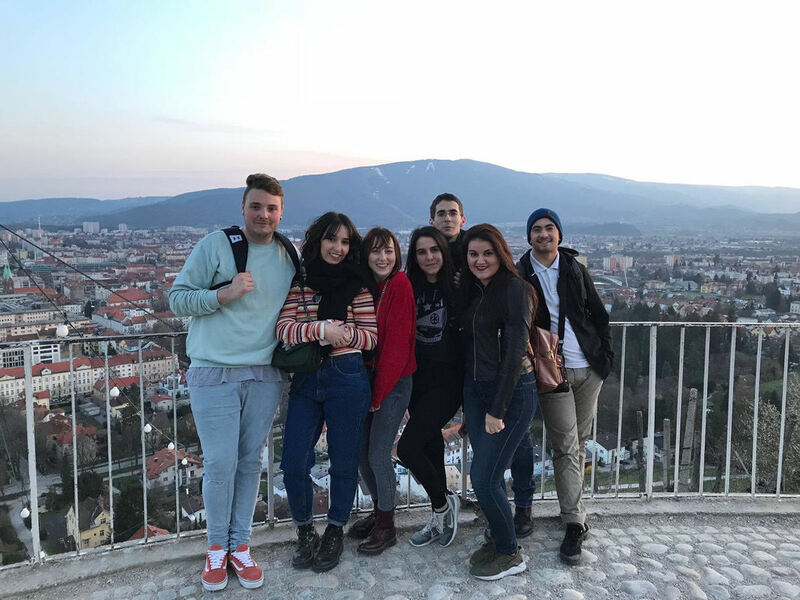 Participant from two different groups quickly became friends with each other and now Maribor already feels like their second home to them. 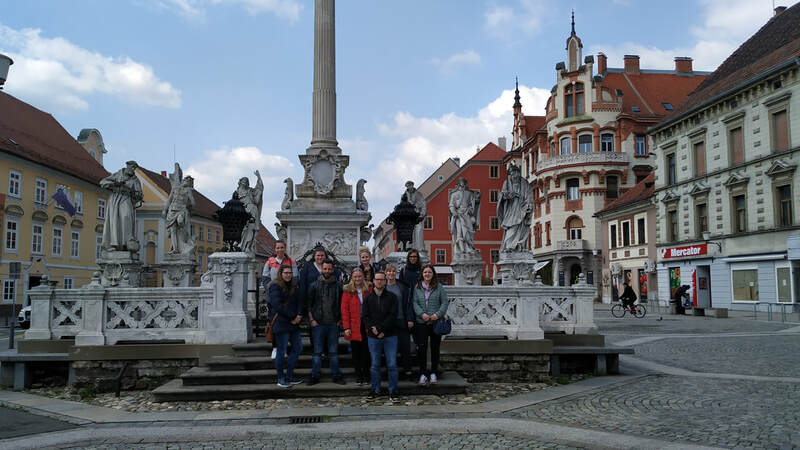 At the end of May, another Italian group arrived to Maribor with their mobility participants. 10 students of Forestry will spend one month of working practice in different Slovenian companies and institutes in the fields of Forestry and Agriculture. Those internships were provided by our institute ZNI and the mobility group Fortes from Italy. We hope for more cooperation with this group in the future! Iz Poljske se nam takole oglaša vzgojiteljica Tatjana, ki se trenutno mudi v mestu Vroclav, kjer v enem od vrtcev opravlja prakso, katero smo ji uredili na Zavodu ZNI. Gre za vrtec, kjer se otroci že od prvega dne dalje učijo angleški jezik ter tudi z vzgojiteljicami in med seboj komunicirajo večinoma po angleško. Vsak teden je na vrsti tudi predstavitev ene od držav in takole je Tatjana pred dnevi malčkom in sodelavcem z veseljem predstavila Slovenijo. V eno uro dolgi predstavitvi je zbranim prikazala promocijski video, predstavila nekaj otroških pesmi in pravljico o Muci Copatarici, med katero so otroci sodelovali z risanjem in izrezovanjem figuric ter bili po njenih besedah nad predstavitvijo povsem očarani. Vmes si je Tatjana med prazničnimi dnevi ogledala še mestne znamenitosti, denimo sto let staro dvorano, namenjeno športnim prireditvam, mestno Fontano ter živalski in botanični vrt. 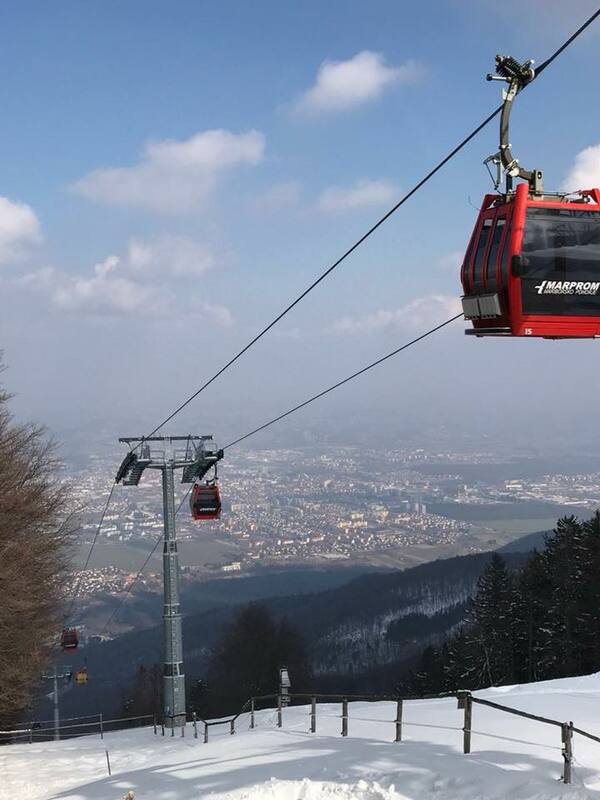 Spring is in its full swing and it seems for some new participants that they will celebrate the Easter Holidays in Slovenia. Nine interns from the Swedish group Activa have already started working in Maribor. 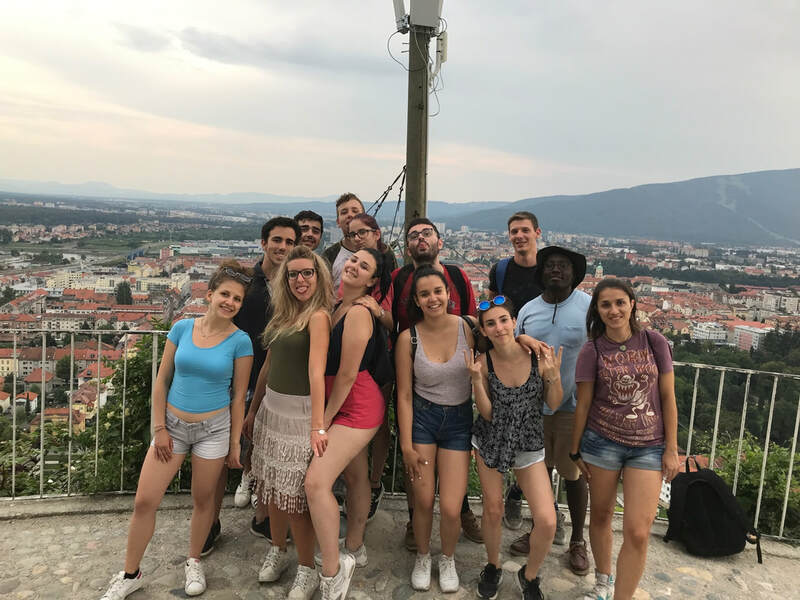 But the number of participants doesn’t stop here, ten more students from the Italian group Umbrianet just arrived and will have their work practices in Maribor and close regions. 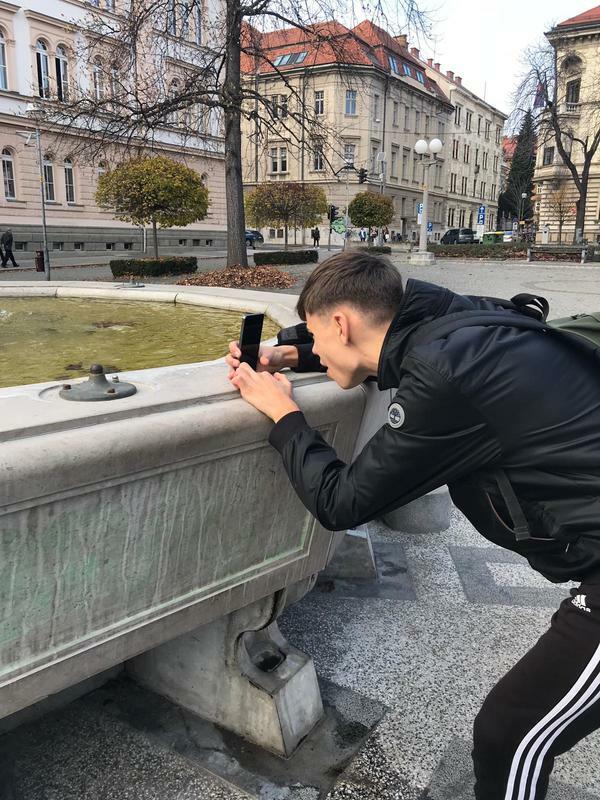 ZNI wishes them unique experiences and a memorable stay in Slovenia. The green Slovenia welcomed six new participants at the beginning of spring. Ines, Joselyn and Pablo from the Spanish group Imot will spend the whole spring in Koper, working in the fields of video production in Youth Center Koper. 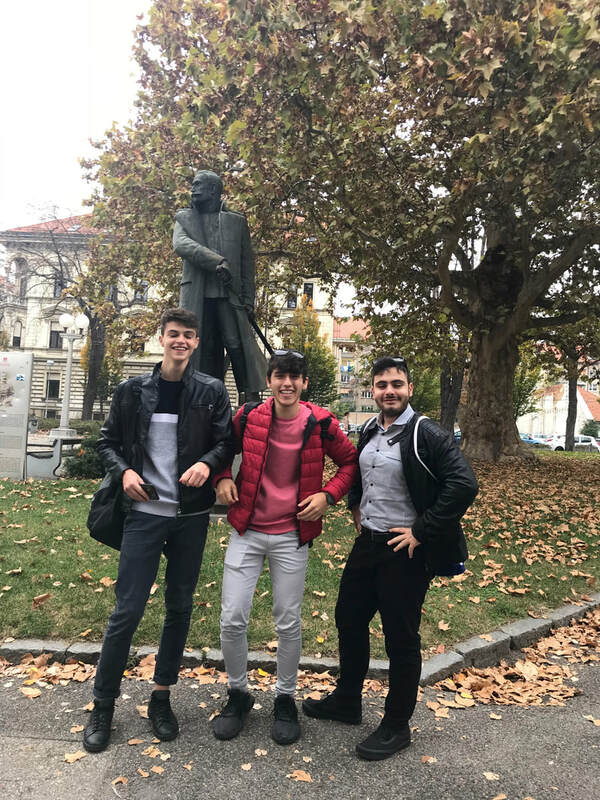 Also, three Portuguese guys, Joao, Filipe and Tomas from the group Etic are employed at the same department in Maribor in different companies. 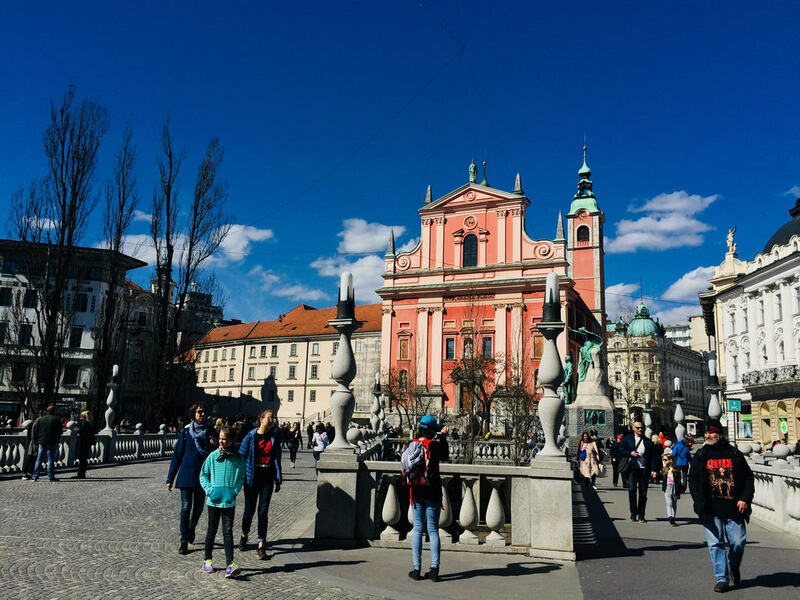 Visiting and discovering the beauty of the city, ZNI wishes them unforgettable moments during their stay in Slovenia. V projekt so se že vključili novi študentje, za katere smo dne 23.2.2017 na Zavodu za Novodobno Izobraževanje organizirali program priprave - natančno smo pregledali vsebino projekta, njegov namen in operativni potek. 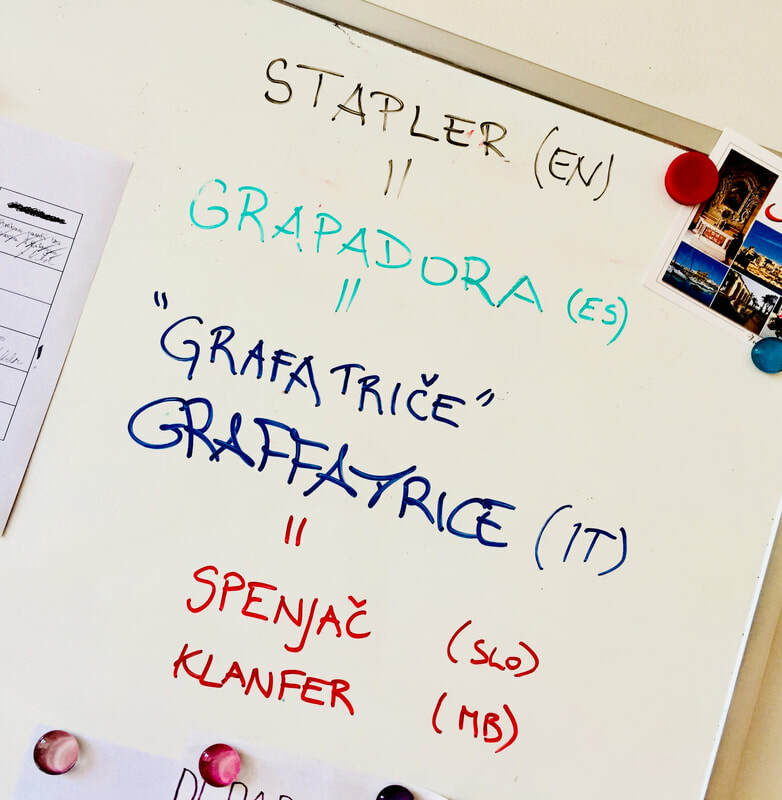 Veliko časa smo namenili tudi predstavitvam študentov namenjenim potencialnim gostujočim podjetjem za prakse tako v Sloveniji kot tudi v tujini ter predstavitvenem materialu; vse našteto je ključno za uspešen dogovor študentov s podjetij v samem projektu kot tudi kasneje pri iskanju zaposlitve. Gaja Jenko je kot absolventka na Fakulteti za matematiko, naravoslovje in informacijske tehnologije Univerze na Primorskem izkoristila možnost za prijavo na študijsko prakso v okviru projekta Mobility for Enhancement of students Employability II. Več o njenih izkušnjah iz tega projekta si lahko preberete na tej povezavi. 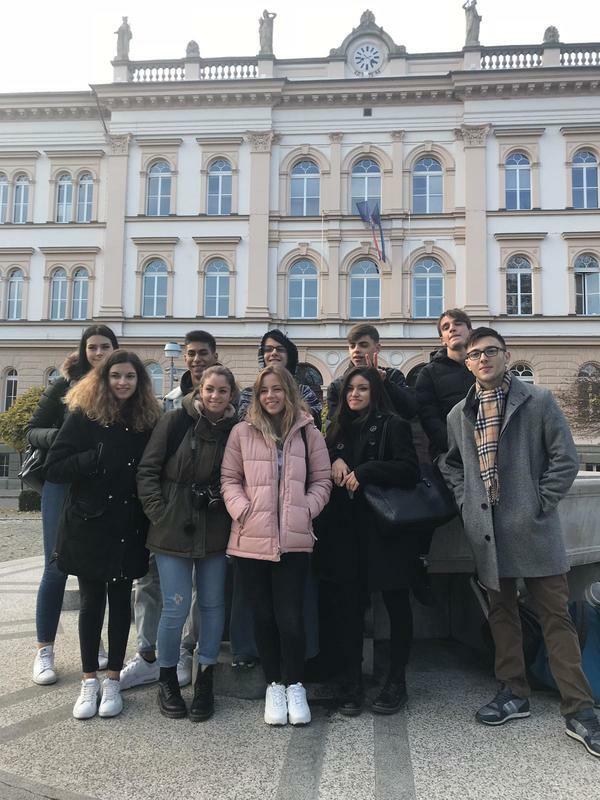 Razpis za ta projekt in študijsko prakso v okviru programa Erasmus+ je še vedno odprt, zato pozivamo vse zainteresirane, da se prijavite čimprej! 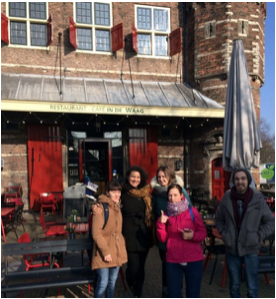 ZNI is happy to welcome the first mobility participants in the year 2017! Jussi from the Finnish group Hyria came to Slovenia to work in the Luka Koper company. 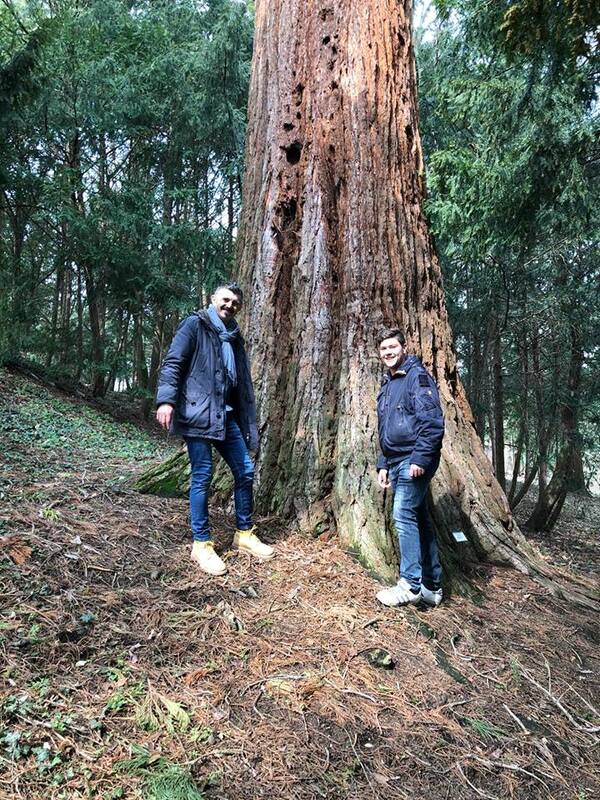 Umberto and Lorenzo come from the Italian group Uniser TechNet 2020. One of them will work in the ingredients and flavor company near Celje, the other one in the marketing agency in Maribor. 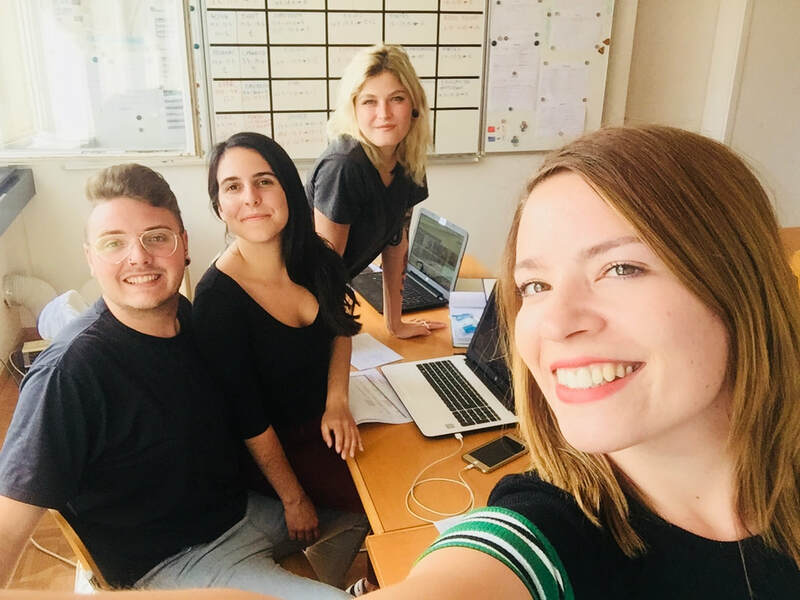 Three Portuguese students from the group Euroyouth, named Diogo, Maura and Inês are already working as hotel receptionists. All of them already explored the city's sightseeings and tourist attractions. 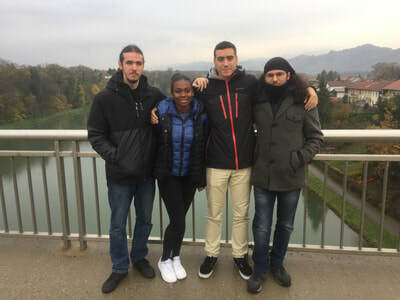 ZNI wishes them many more enjoyable moments while staying in our small but diverse country during their internships. Today our cooperation with partner Northcom from Czech Republic officially started . 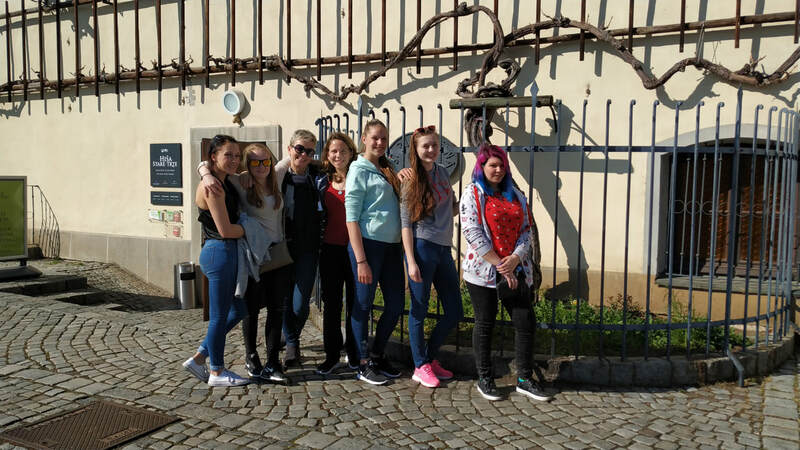 We are hosting a young group of six girls which will have their work practice in Horse clubs around Maribor. Enjoy the stay! 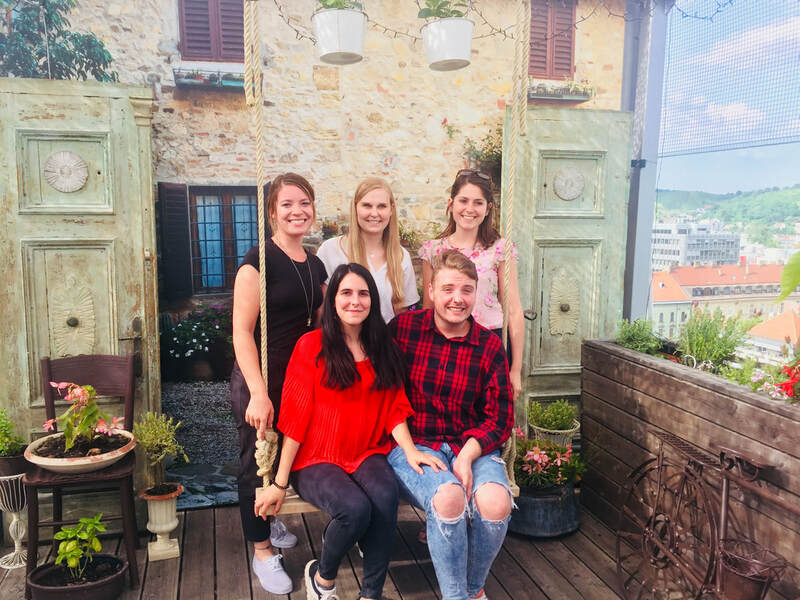 After five months we proudly host new colleagues from Sweden on their Study visit in Maribor. During the three days long visit we will show them how the participants from Swedish organisation Activa operate on their work placement and we will present them the purpose of our work. 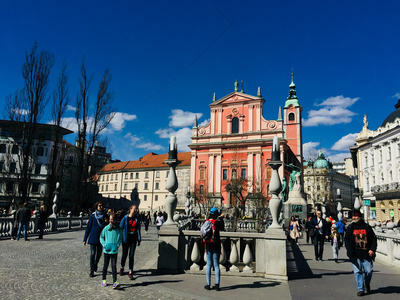 We believe you will have a pleasant stay in Slovenia and that the visit will be fruitful. 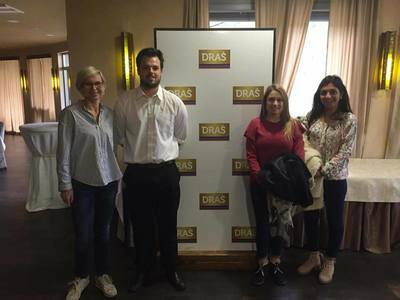 Week is at the end and so is the preparation for our new participants from Uniser from Italy as they are ready for their work placements. Fabio will take part in marketing and promoting of Zlati Grič wine production company, and Paolo will become a member of a team in design studio and market agency Rdeča Oranža. 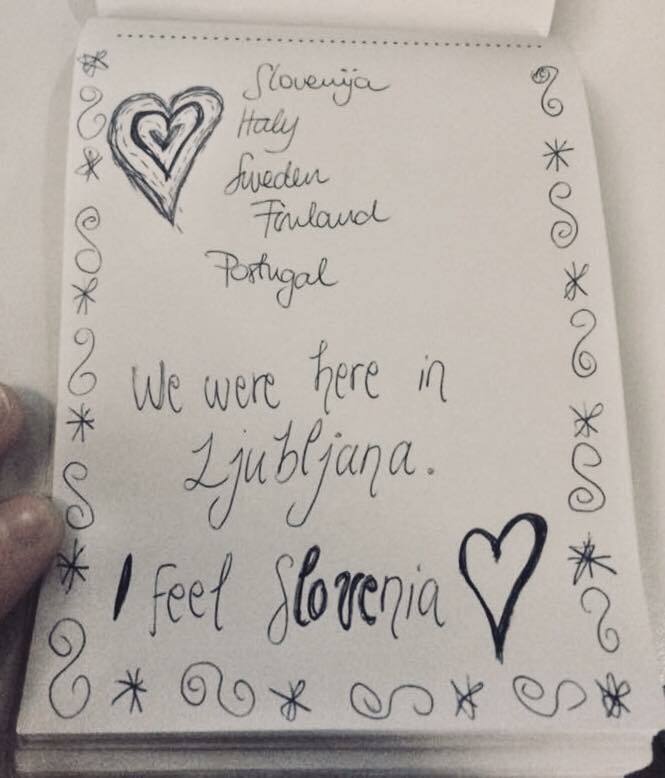 Enjoy your stay in Slovenia! 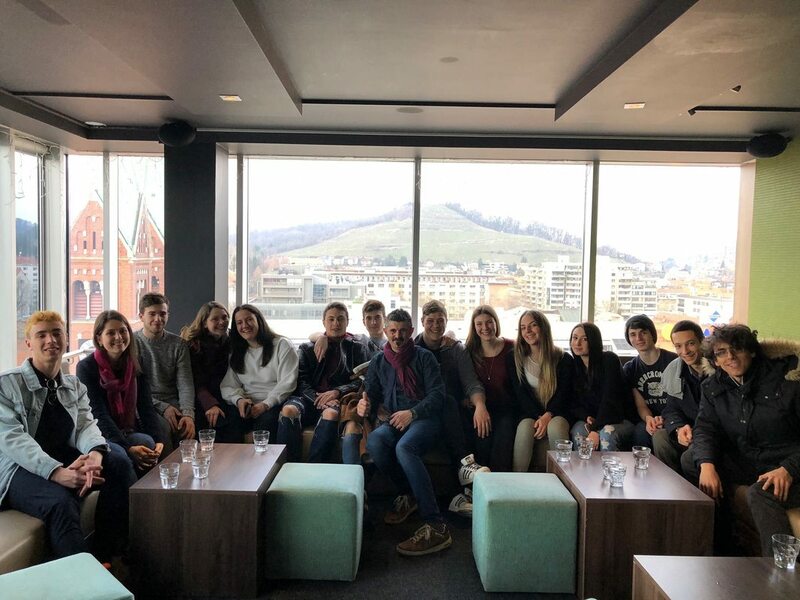 It is a pleasure for us to host another Eurocentro group from Italy. 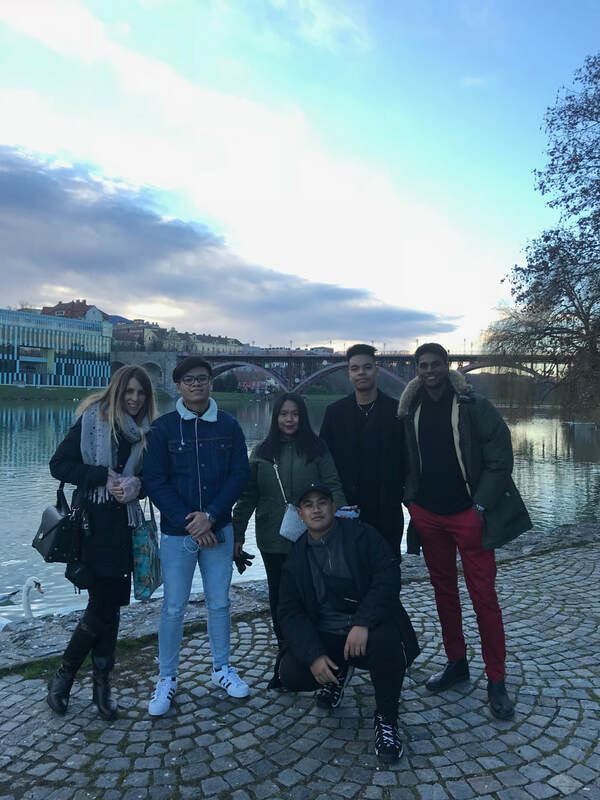 After preparation week full of English courses and city tours, they are ready for their work placements. 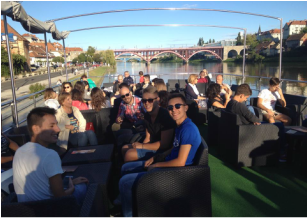 Enjoy your stay in Maribor, Slovenia ! We are proud to announce that we are hosting a group from Sweden - the Activa group. 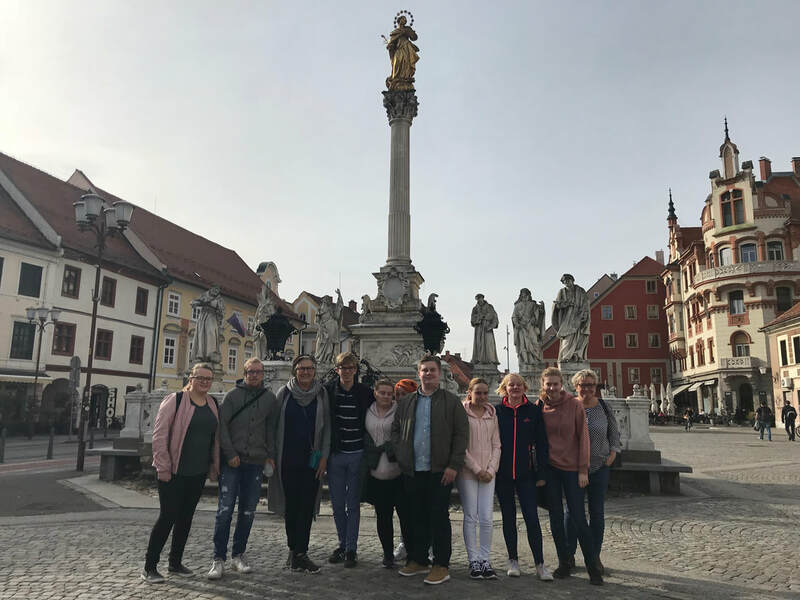 Between the English and Safety at Work courses, the group had the time to explore the city of Maribor and to get to know more about Slovenia. The preparation week finished with a trip to the Pohorje mountain. 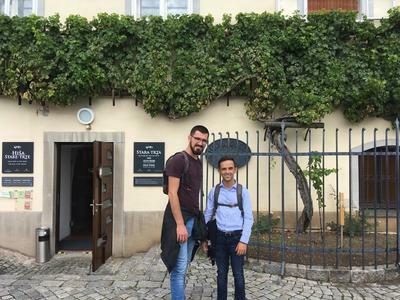 We wish you a pleasant stay in Maribor, Slovenia! 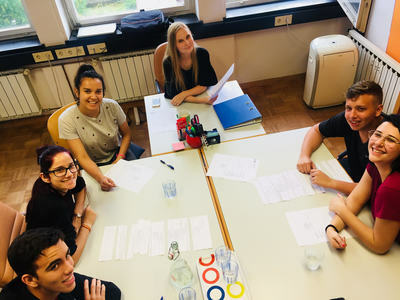 odprt je razpis z namenom praktičnega usposabljanja v državah Evropske unije v okviru programa Erasmus + in projekta Mobility for Enhancement of students Employability II. Razpis bo odprt do porabe sredstev, mobilnost se more zaključiti do 31.5.2017! 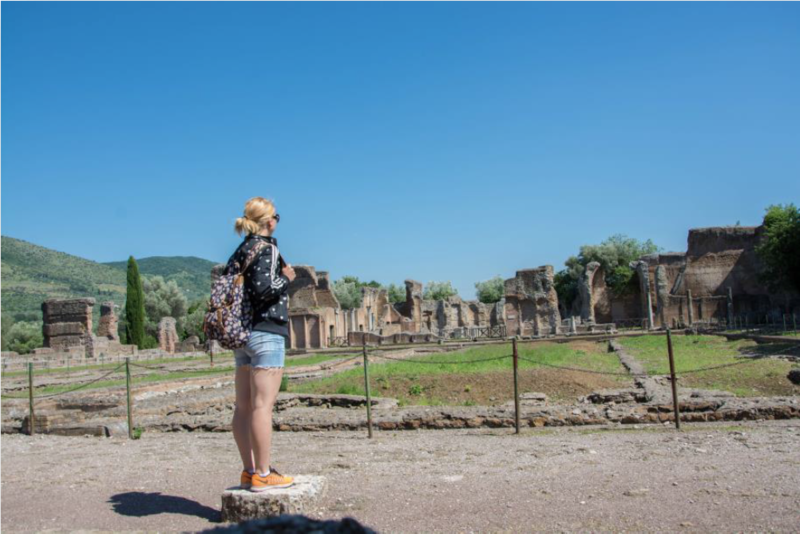 Are you thinking about an Erasmus+ internship? Do you wish to test your skills abroad and upgrade your theoretical knowledge through practice? Do you like meeting new people and cultures? ​Currently we are looking for new members to join our team. 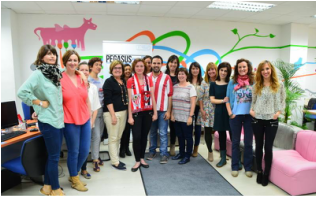 We are inviting you to experience your Erasmus+ mobility internship in our institute. 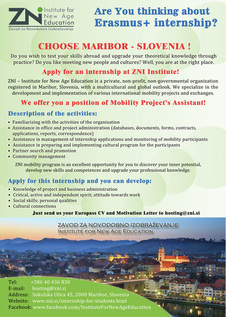 ​Apply for an internship at ZNI Institute: we are offering you a position of Mobility Project's Assistant! To apply for the internship just send us your Europass CV and Cover letter to hosting@zni.si. You can find more information if you click on the flyer and here. ​Iz Amsterdama se nam je javila študentka Živa Juha, ki sodeluje v projektu Konzorcij – Erasmus+, katerega koordinira ZNI. Kot praktikantka na recepciji v hotelu Ecomama se je v minulih treh mesecih zelo dobro navadila na svoje delovno mesto in samostojno opravlja recepcijska dela, ki jih ob skoraj popolni zasedenosti hotela nikdar ne zmanjka. 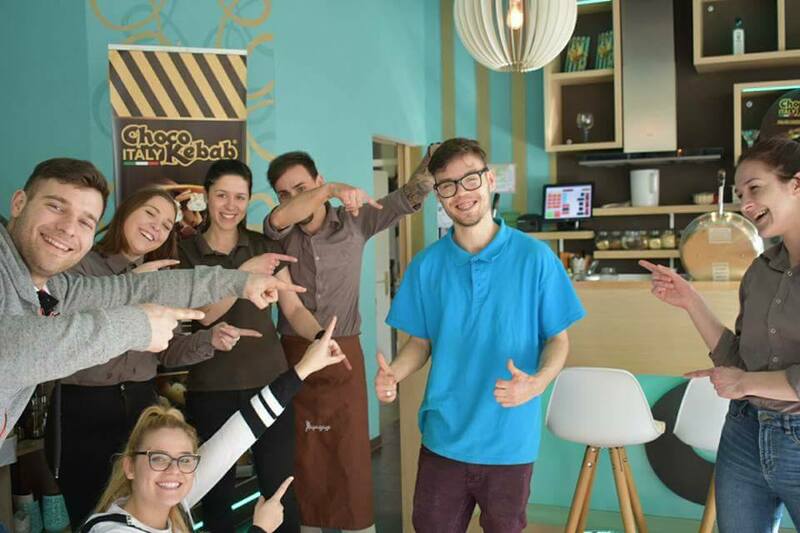 Pri tem ji je v pomoč dobro poznavanje različnih programov in booking sistemov, s čimer je, kot sama ugotavlja, njeno delo na recepciji postalo večinoma že rutinsko. 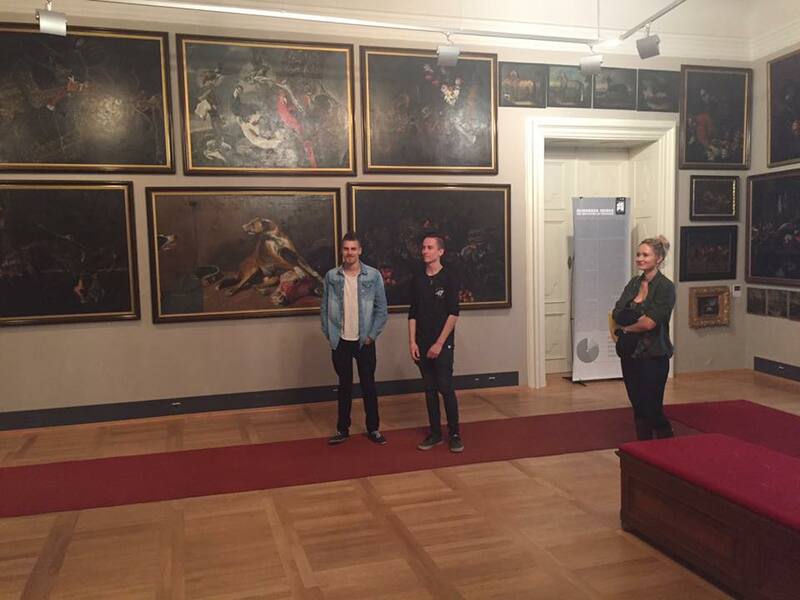 V prostem času skupaj s sodelavci rada zavije v kakšnega od številnih muzejev in galerij, v katere ima kot recepcionistka prost vstop z izkaznico Museumpass. Mestne znamenitosti pozna že tako dobro, da jo imajo hotelski gostje kar za domačinko, ko jim svetuje, kaj je vredno obiskati in si ogledati. 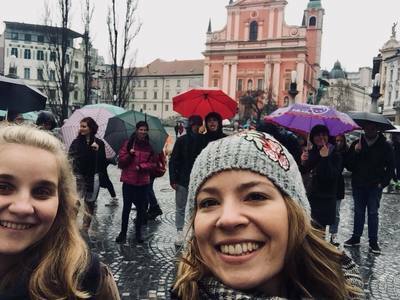 Naša udeleženka Katja je na mobilnosti projekta Konzorcija – Erasmus+, ki ga koordinira ZNI. 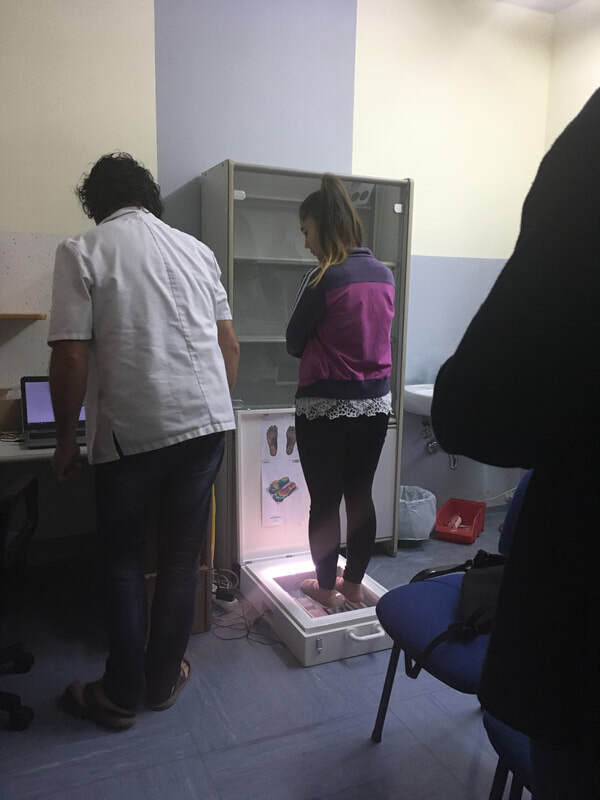 V Rimu opravlja prakso na Inštitutu Umberto I v prehranski ambulanti, ki se nahaja na oddelku za klinično medicino rimske poliklinike (Policlinico di Roma). Delo opravlja z veseljem in obenem pridobiva nova znanja na področju enteralne in parenteralne prehrane, podhranjenosti, ter prehranske podpore onkoloških bolnikov. Hkrati je v prostem času že obiskala največje znamenitosti Rima in Neaplja, ter se povzpela na Vezuv in sprehodila skozi ruševine Pompejev. 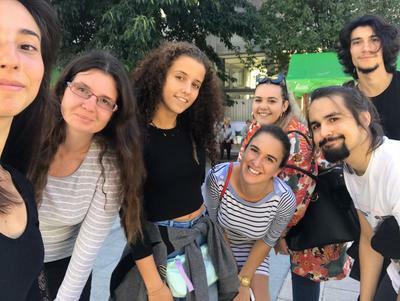 Veseli smo, da z vami delimo nekaj utrinkov izkušnje mobilnosti udeleženke projekta Konzorcija Erasmus+, ki ga koordinira ZNI. Udeleženka Bojana je trenutno v Sevilli kjer opravlja prakso na Andaluzijskem centru za molekularno biologijo in regenerativno medicino CABIMER. 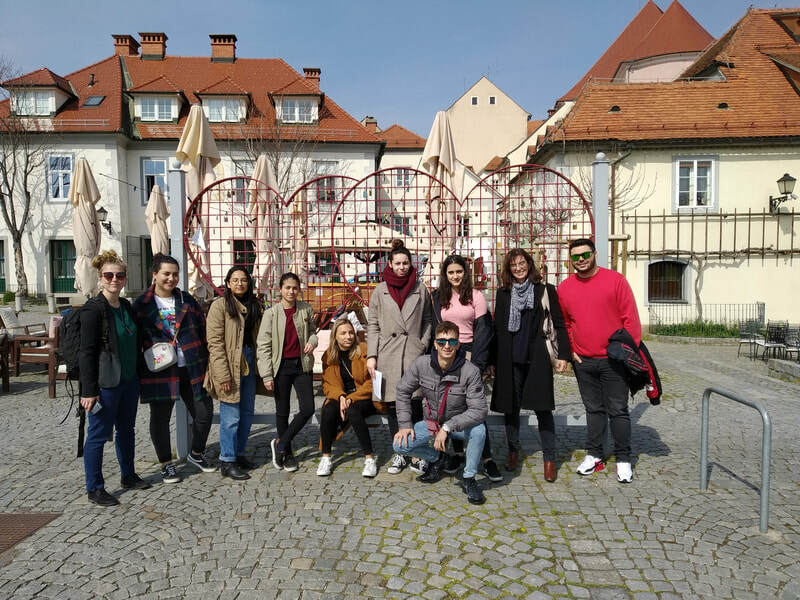 ​On the first day of spring, 20th March, the weather was invitingly warm for our participants to take a trip to Ptuj, which is the oldest city in Slovenia. Exploring its historical monuments and sights of the city, settled in pre-historic and Romanian times, we took a tour through the castle, built in the 9th century. The castle is a museum with beautifully arranged chambers exhibiting the furniture, tapestries and paintings of specific time periods, and is also rich with musical and costume collections. The castle art gallery shows some of the most beautiful examples of Gothic and Baroque art in Slovenia. ​Riku, Teemu, Henri and Juho are our friends from Finland. 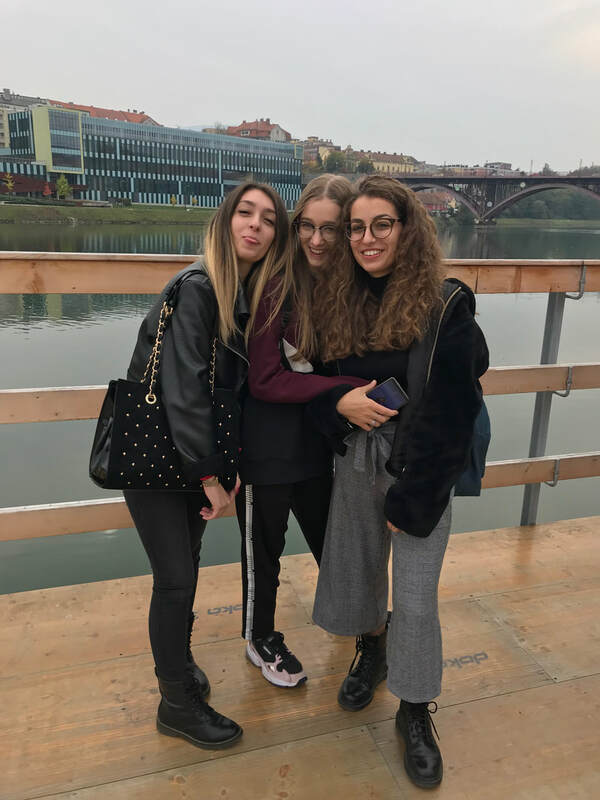 They are in Slovenia for their Erasmus internship. While Teemu and Riko work in Maribor, Juho and Henry work in Koper. 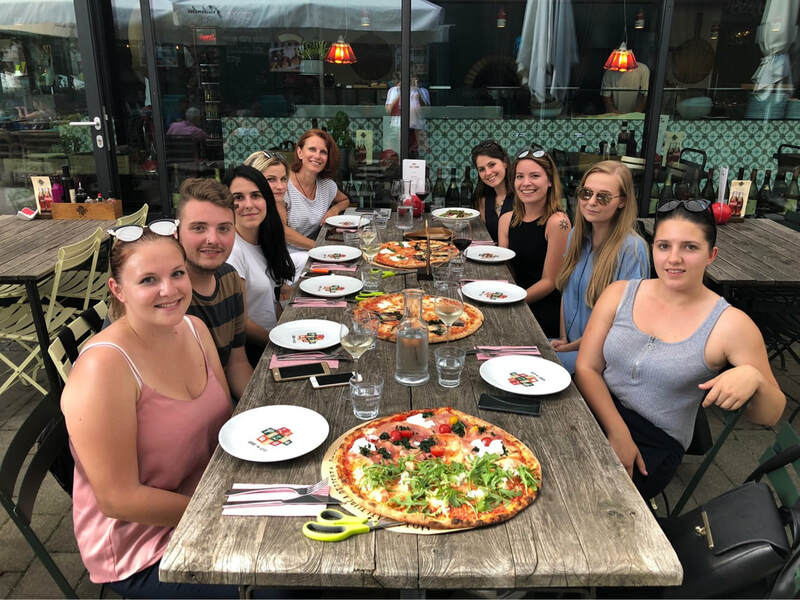 The distance didn't stop them from hanging out together and so, last weekend, they decided to visit Ljubljana. They met in the morning and spent the whole day discovering the capital. 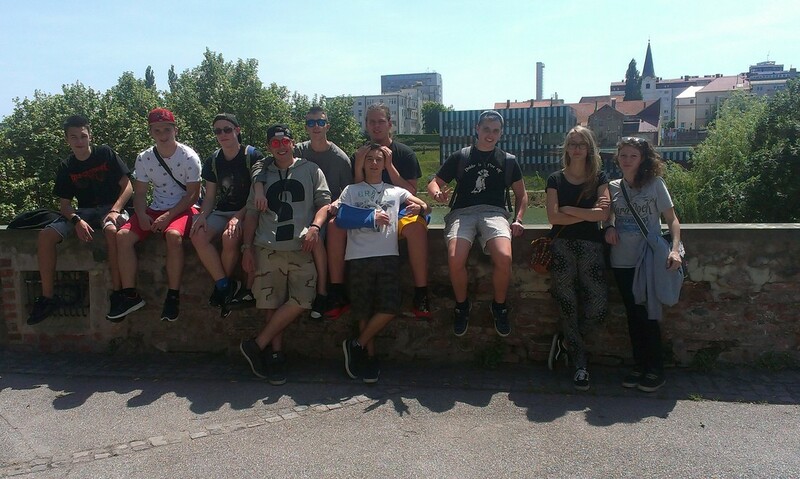 During their day they visited the zoo, the city park and the castle. 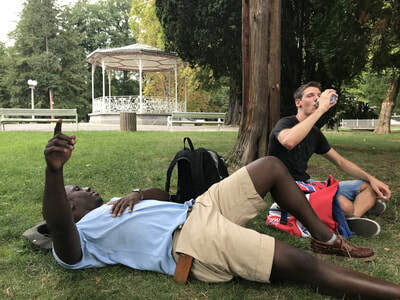 After that long day, they spent their last few hours relaxing and having a beer in one of Ljubljana's pubs. ﻿And here we are, 11 years of full satisfaction and great results! We want to say a special thank you to all our participants and partners, together we achieved so much! Thank you again! ​What have we achieved in this 11 years? ​Katarina, naša udeleženka na mednarodni izmenjavi v Lizboni, deluje na področju turistične mediacije. 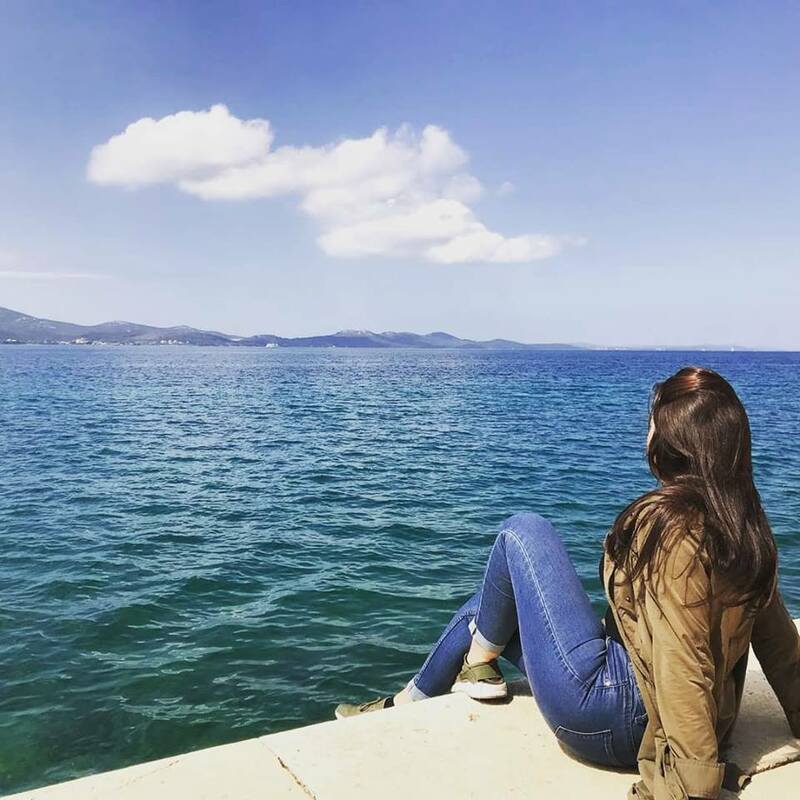 V tem tednu je organizirala oglede mestnega jedra ter drugih turističnih destinacij tega čudovitega mesta. Njeno delo zahteva veliko priprav in še posebno odgovornosti, kar pa kljub temu opravlja z velikim veseljem in je pri tem tudi zelo uspešna. Ob vsem tem je deležna novih poznanstev ter zabavnih izkušenj. V tedenskem poročilu vam predstavljamo nekaj utrinkov iz Kanarskih otokov, ki nam jih je poslala Veronika G., udeleženka projekta mobilnosti Konzorcija Erasmus+. Veronika je uspešno opravila prvi del projekta - usposabljanje v slovenski matični organizaciji Mladinsko zdravilišče Debeli Rtič in se trenutno nahaja na praktičnem usposabljanju gostujoči organizaciji GF Hoteles na Tenerifih na področju animacije. Najbolj zanimiva stvar pretekli teden zanjo je bilo prvo samostojno vodenje mini disca, kjer je animirala otroke z naučenimi plesnimi koreografijami. Zanje je tudi pripravila otroško olimpijado, gradila z njimi gradove na plaži, ter vodila ustvarjalne delavnice. Ob večerih je opravljala še delo hostese v restavraciji, Posebno praznovanje je sledilo še v nedeljo, ko je popoldne potekal fashion show v stiku Valentinovega. Sama najbolj uživa ob prijaznih sodelavcih in mentorki, ki so jo takoj sprejeli medse in za njeno delo našli zgolj pohvalne besede. Resnično je navdušena nad njihovo odprtostjo in gostoljubnostjo. 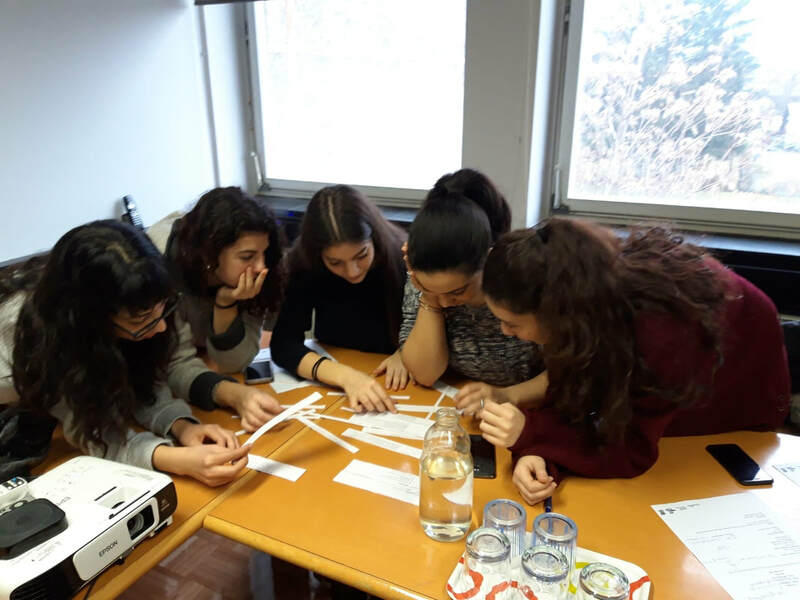 ​Projekt Enhancement of students employability v polnem zagonu! 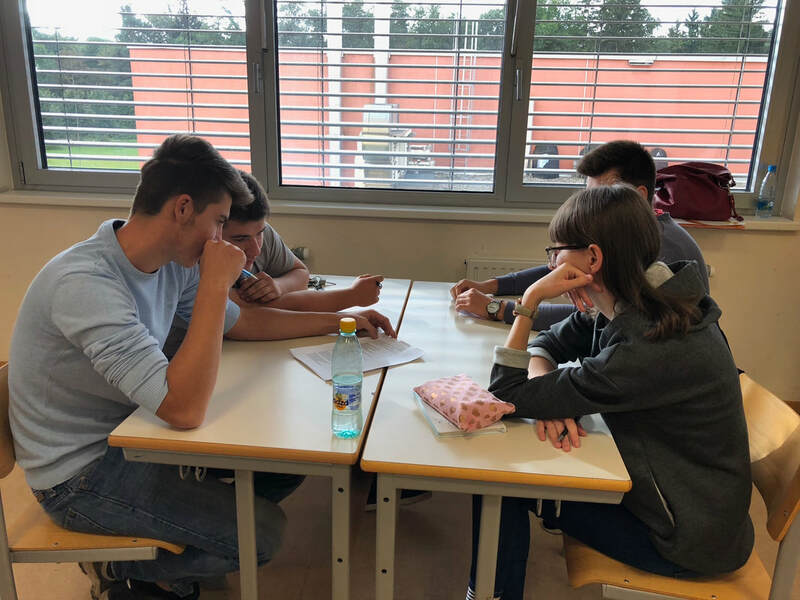 Slovenski študenti v projektu “Enhacement of students’s employability” (Erasmus+) po praktičnem usposabljanju v matični organizaciji odhajajo na prakso v tujino. Po uspešno zaključenem enomesečnem praktičnem uvajanju v matični organizaciji odhaja 6 slovenskih študentov na drugi del usposabljanja - trimesečno prakso v organizaciji v tujini. Tretji del projekta bo zajel enomesečni prenos pridobljenih znanj in veščin po njihovi vrnitvi v slovensko matično organizacijo. Študenti so v prvi fazi projekta stopili v kontakt s slovenskimi organizacijami na področju turizma, dietetike in kinezologije v katerih so opravili enomesečno praktično usposabljanje. Skupaj z matično organizacijo so izbrali in se povezali z podobnimi organizacijami v tujini v katerih sedaj študenti opravljajo trimesečno prakso z namenom pridobivanja novih znanj in veščin ter spoznavanja najsodobnejših praks. Dve udeleženki sta že v Španiji (Tenerife) in Portugalskem (Lisbona), v kratkem pa še ostali odhajajo na Nizozemsko, Avstrijo in Italijo. 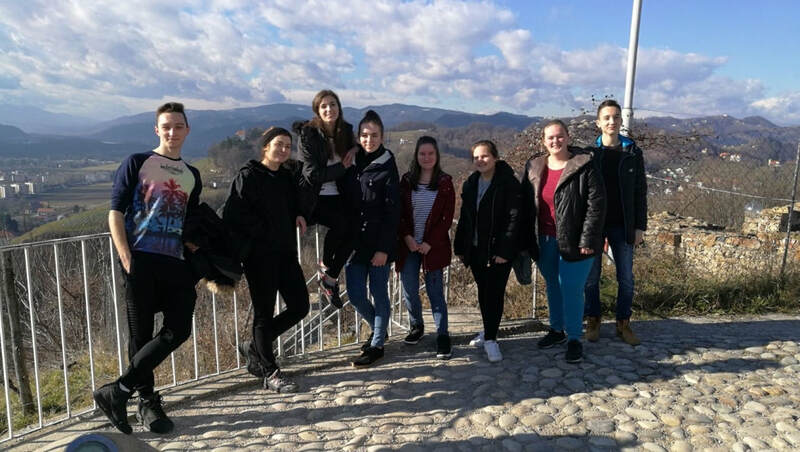 Projekt se odvija v okvirju programa ERASMUS+, izvaja pa ga KONZORCIJ katerega člani so Regionalna gospodarska zbornica Celje (RGZC), Univerza v Mariboru, Univerza na Primorskem, Visoka šola za proizvodno inženirstvo (Celje), Visoka šola za varstvo okolja (Velenje), Visoka zdravstvena šola (Celje) in koordinator konzorcija - Zavod za Novodobno Izobraževanje iz Maribora. ​Why should you take part in mobility Maribor, Slovenia? There is no one direct answer to an intelligent question like this but yet some facts about my experience will surely convince you to choose Maribor in order to feel complete. 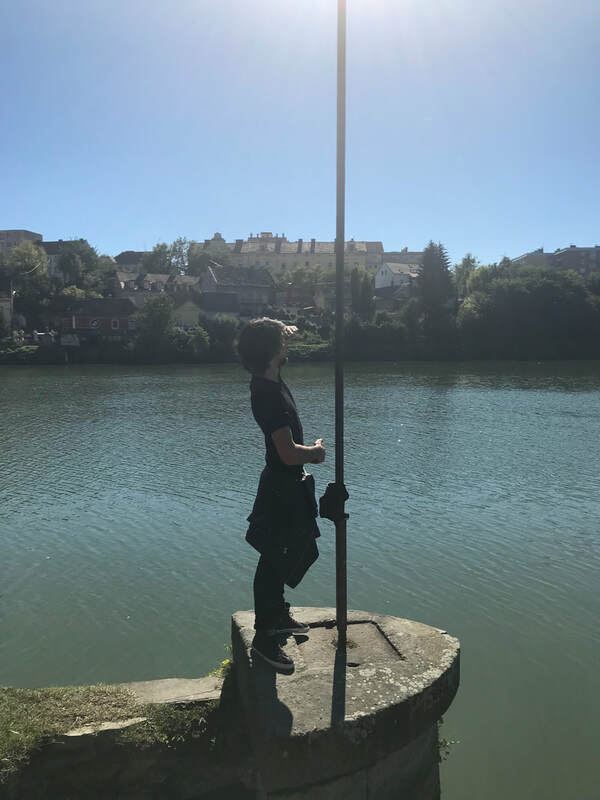 I participated in the mobility to increase my professional and international experience, the idea of learning by doing is the most effective way of learning because it is something that stays with you forever. I lived in Lithuania for more than a year completing my Master's degree. The moment I finished my studies I knew that something is lacking in life, I got some domestic experience and now a Master's degree. I decided to change the country of living, that is from Lithuania to Slovenia. At first I thought it is going to be impossible to adapt to the culture, climate, people or even the job. To my surprise, I was taught by ZNI members to embrace the fact that failure is not an option. Through the help of ZNI I was able to climb the ladder to overcome my anxiety. Maribor is a small town and we often say 'Small is Beautiful' which is a perfect description of Maribor as a whole. 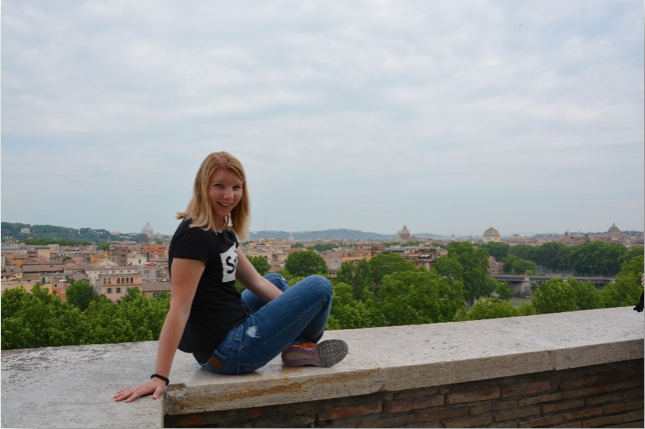 In January we are hosting an intern from Finland, Meeri. 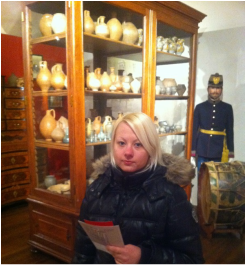 She visited the Museums to see the Slovenian historical collections. 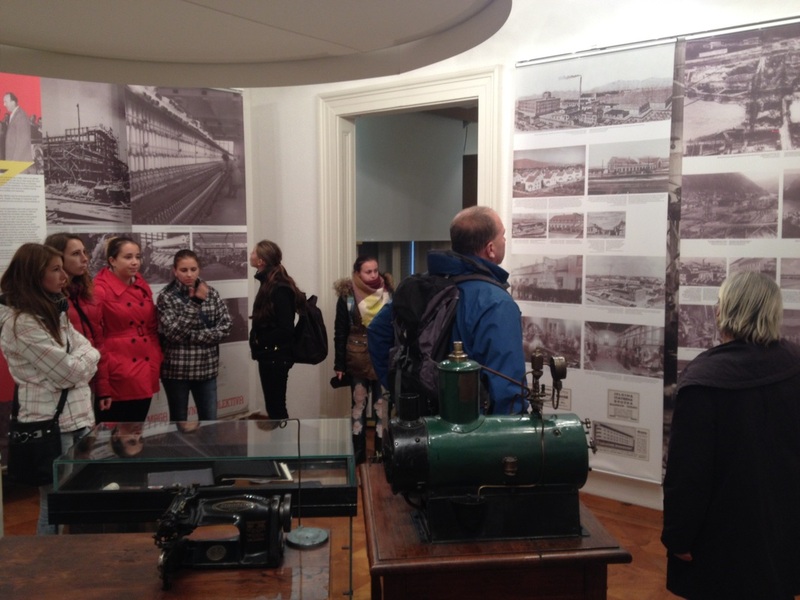 It was found that the Museums have many historical facts from pre first world war to post second war world. 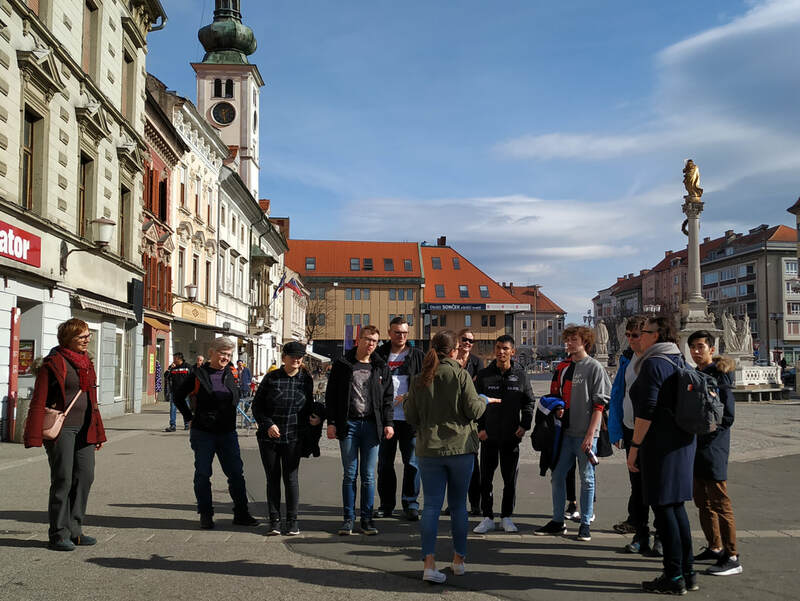 She learned about the important role of Maribor during the former Yugoslavia as it was one of the most industrial cities in those times. We are also expecting more students from Italy and Finland in January 2016 and subsequent months to follow. This week we will say goodbye to the participants of ITS Energia project from Italy, that were on mobility from the 4th of October until the 23rd of December. 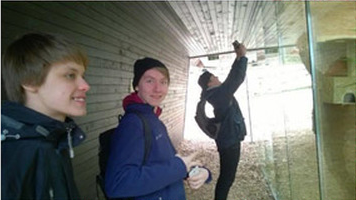 A group of 8 students gained a lot of new experience in the field of renewable energy. The field of renewable energy is the core of the modern democracy as more and more people advocate for clean energy for the environmental protection. In the past two weeks we had a visit from our local partners from Finland and Sweden. The purpose of this visit was to share mobility experiences and to continue collaboration in future. 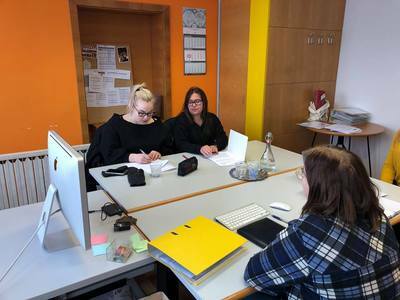 Hyria Education (Finland) is an educational institution providing high quality vocational training to young people, adults, businesses and communities. They are offering more than 60 educational sectors. 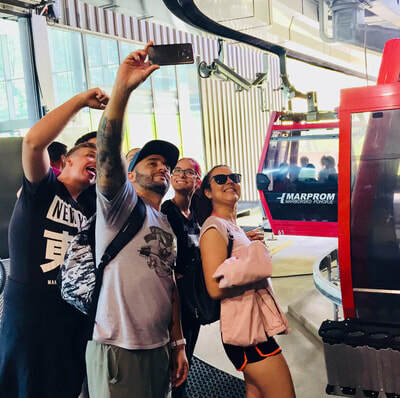 During their stay we visited local companies so that they were able to see how different organisations are operating and what are their everyday projects. 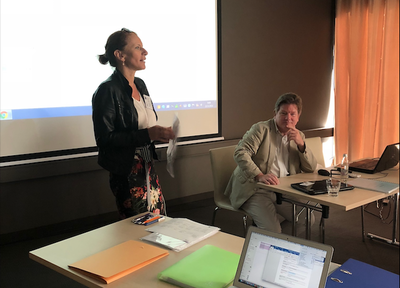 Rdeča Oranža d.o.o., Verus d.o.o., Port of Koper, which are all our hosting partners, presented how they plan and implement different activities. Activa foundation (Sweden) is an organisation with a purpose to find jobs for people with disabilities and health problems. 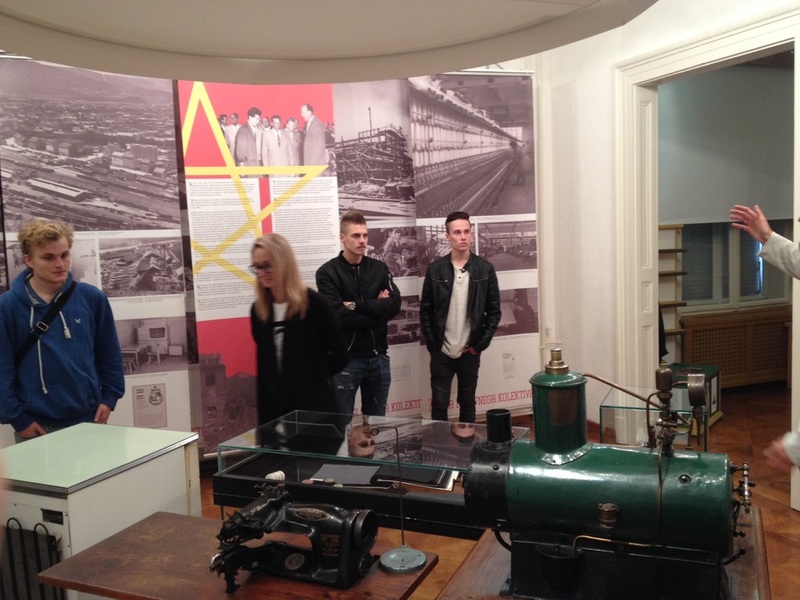 With ZNI coordinators we visited companies: Smartronik d.o.o., Hotel Draš and Avto Koletnik. Beside that we had an opportunity to get to know Adult Education Centre and their program PUM - Project learning for young adults. At the moment we are hosting 13 Students from Italy, Finland and Germany. They are having work practice at different sectors such as renewable energy and energy efficiency, tourism, field of welding and pedagogy. Participants are gaining valuable work experience. Here is a short description of our participant from Germany, on how a typical day at work practice in kindergarten looks like. Zavod za novodobno izobraževanje is taking part in European project called MOB G.A.E. The main aim of the project is to evaluate and disseminate the impact of international mobility experiences on personal and professional development, employability, autonomy and awareness of European citizenship. We asked former participants of mobility experiences to share their story with us, to we could learn what the mobility exchange met for them. 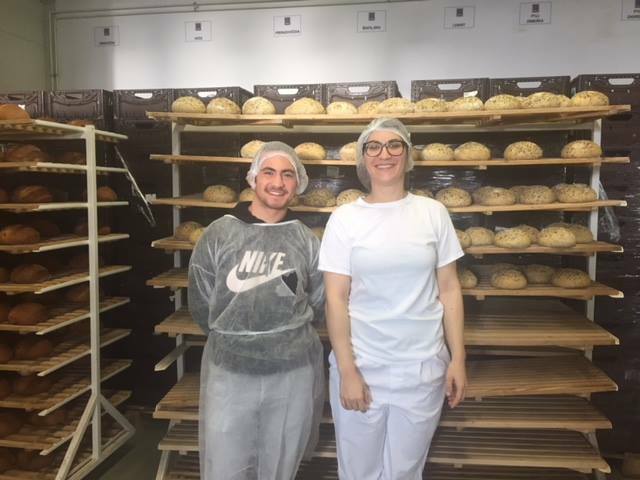 Here are the links to stories from different participant from Slovenia and those who were on work placements in Slovenia. ​This weekend we said goodbye to the participants of RE.RE. 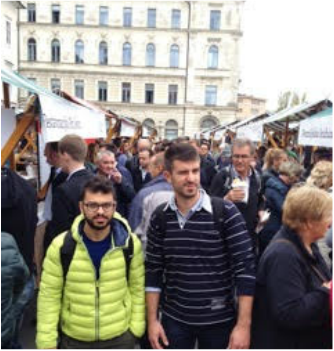 project from Italy, that were on mobility from 18th October until 1st November. 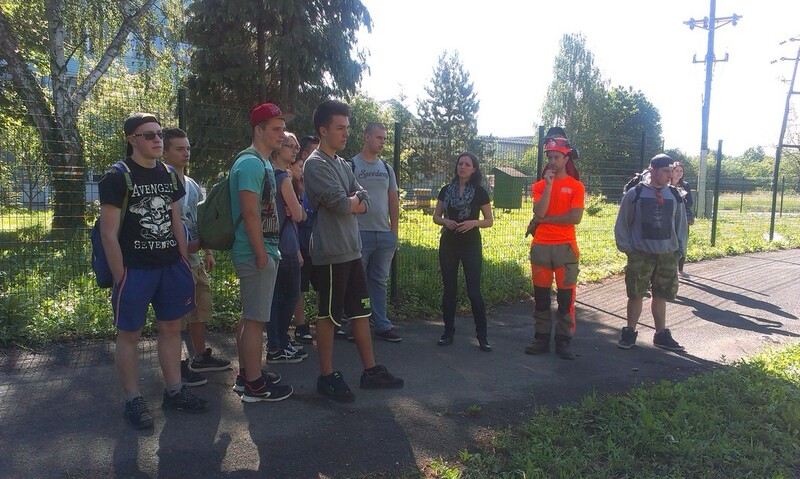 A group of 18 students and 2 tutors gained a lot of new experience in the field of waste management. 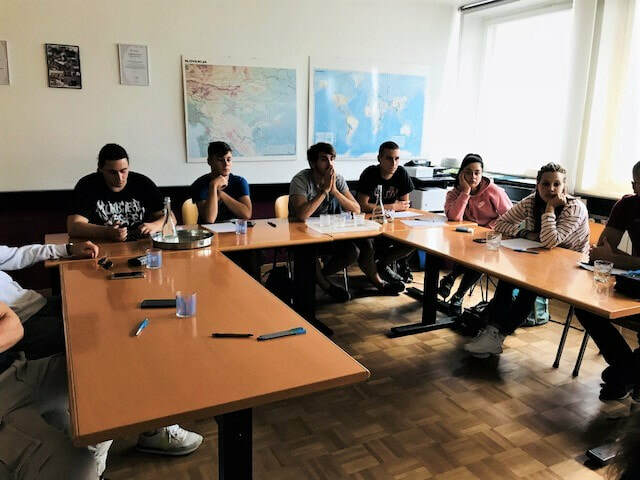 ZNI provided training of personal and work preparation, all participants also attended Safety at work course at IVD (Institute for safety at work). 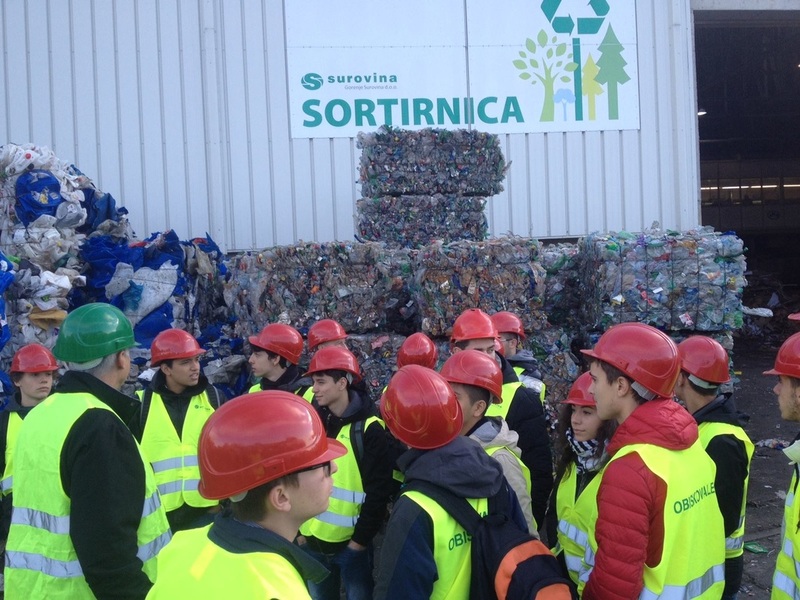 During work practices at companies: Snaga d.o.o., Gorenje surovina, Dijaški dom Maribor, Javne službe Ptuj, Center za ravnanje z odpadki II reda students gained new knowledge and fresh ideas about prevention, re-use, sorting and recycling garbage. 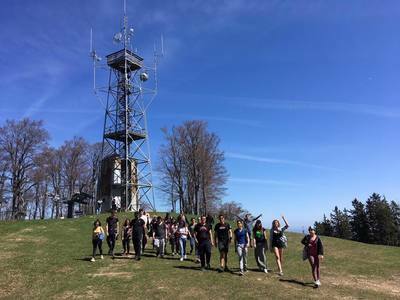 ZNI also organized cultural preparations such as city centre tour and visiting Pohorje hill. Participants were taken to the National Liberation Museum and Regional Museum, where they learned about history of Maribor. 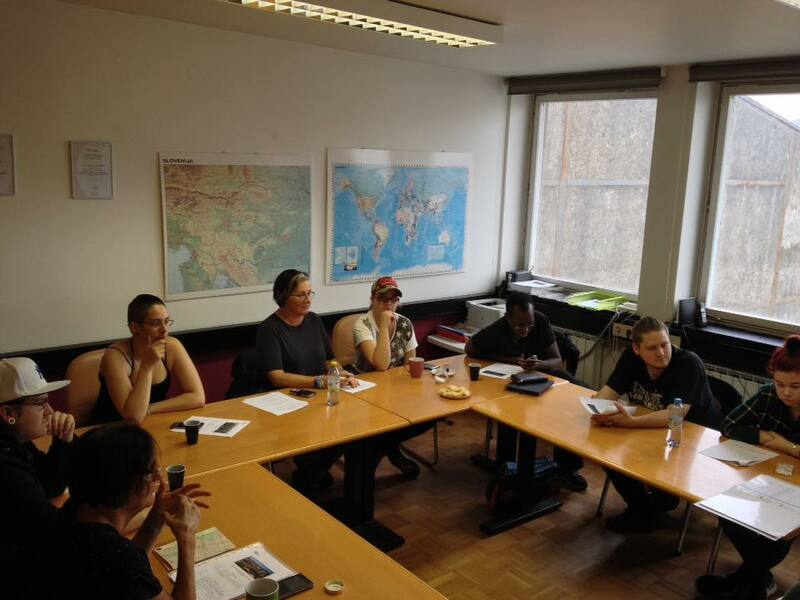 ​Starting in early October and ending in late December, ZNI is hosting 8 participants from the I.T.S. Industrial College in L'Aquila, Italy, who are in Slovenia as part of the ITS Energia project. 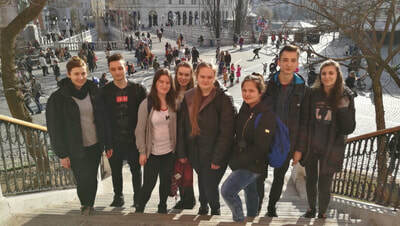 After providing them with information on living and working in Slovenia, an English and a Slovenian language course, CV and motivational letter writing, verbal and non-verbal communication, as well as taking them on tour around the city centre and gaining insight into the culture and history of Slovenia at the National Liberation Museum, the participants were then ready to present themselves to their potential employers. 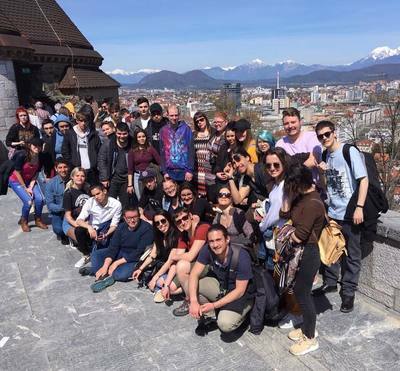 The companies that recognised the numerous benefits of offering work placements to foreign students are LEA Spodnje Podravje, Kreadom, Studio Naris, Biodom, TMD Invest, Komunaprojekt, and others. 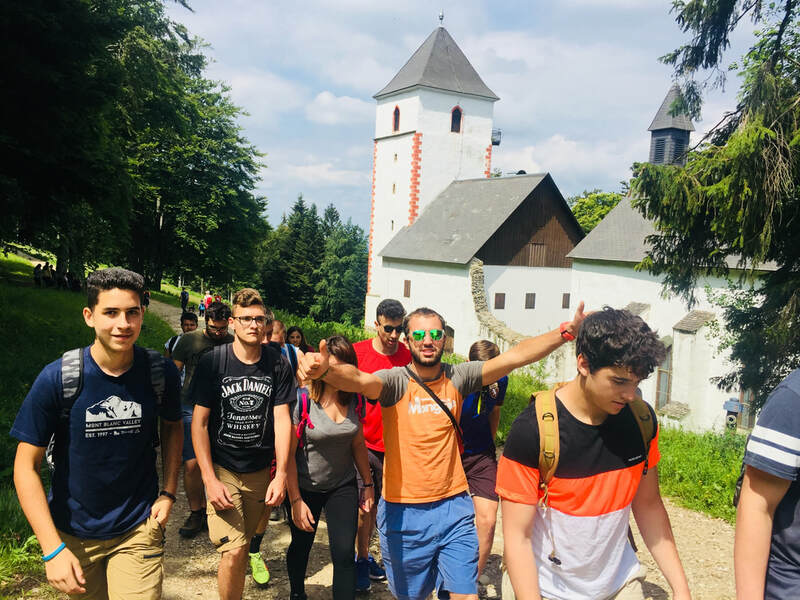 The students are therefore living and working in various places around Slovenia: Ptuj, Nova Gorica, Koper, Kozina, and Maribor; and in the fields of energy systems, architecture, engineering, urban planning, energy certificates, heating systems, and project engineering. Zavod za Novodobno Izobraževanje is taking part in European project called MOB G.A.E. 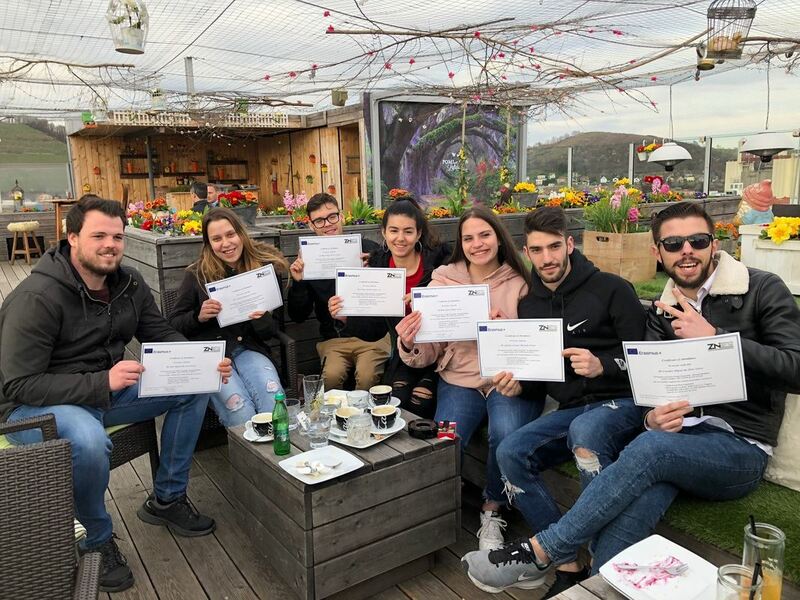 The main aim of the project is to evaluate and disseminate the impact of international mobility experiences on personal and professional development, employability, autonomy and awareness of European citizenship. In year 2014 and 2015 we published two national newsletters where you can read more about ZNI, MOB G.A.E research results,report on FLASH MOB event,report on local meeting with participants who would like to attend mobility programme in the future, invitation for sharing blog stories. 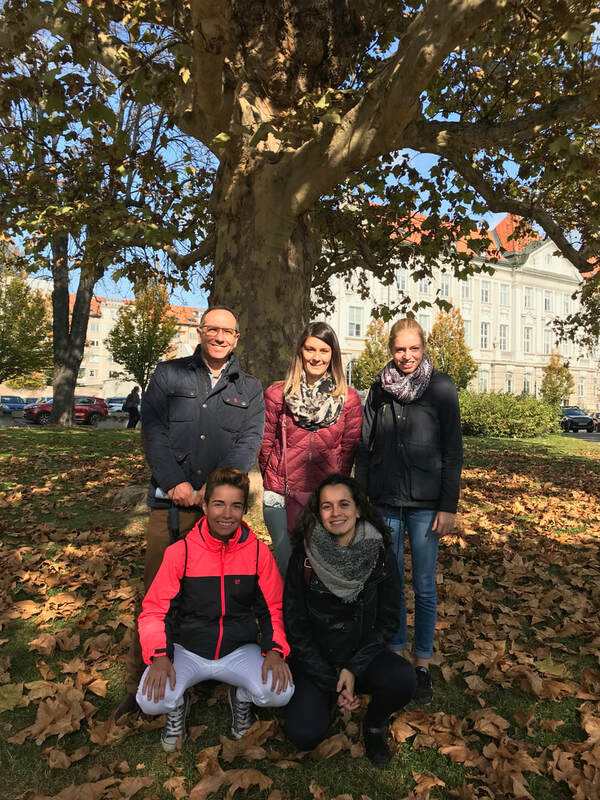 From mid July to the end of September 2015, ZNI organised work practices for 8 participants from the University of Alba Iulia in Romania and one participant from the University North in Croatia. The participants were working in various fields, including business administration, philology, computer science, occupational health and safety, finance and banking. 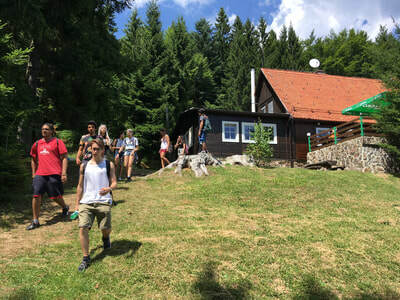 Among the companies and organisations provided by ZNI were Globus Turizem tourist agency, EIC Univerzum Minerva education and development centre, Verus marketing agency, Rdeča Oranža marketing agency, Sonček - Cerebral Palsy Association of Slovenia, INTERFIN accounting services, and the Betnava Hotel. 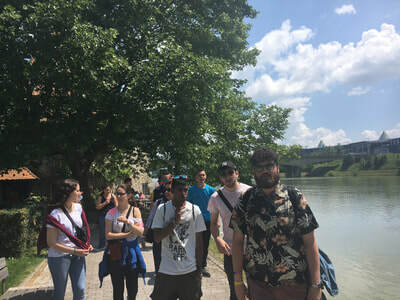 The participants showed quite a bit of independence so they were often exploring Maribor, Slovenia, and its neighbouring countries. Their trips included going to the adrenaline slide and the viewing tower on the Pohorje Hills, enjoying street concerts in the Maribor city centre in the evenings, going to the Slovenian seaside (Koper, Piran, and Portorož), paddling to the island and swimming in Lake Bled, visiting Slovenia's capital of Ljubljana, as well as travelling across borders to Graz and Vienna in Austria. 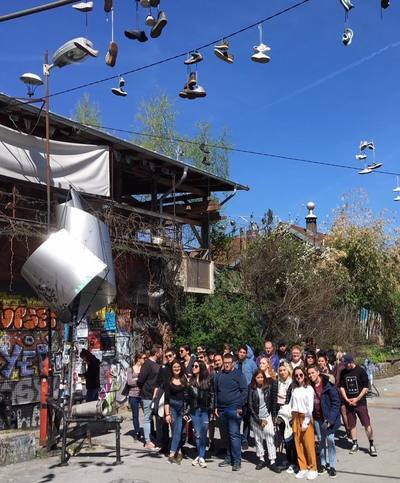 Participating in the RESET project, ZNI was happy to host a group of 25 participants and 4 tutors from Italy. The project took place between the 6th and the 26th of September and it included participants aged 16-21. 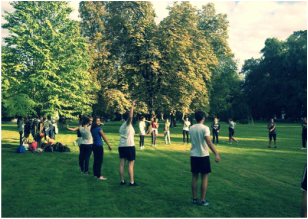 The aim of the project was to get acquainted with organising and promoting sports events and sports activities. 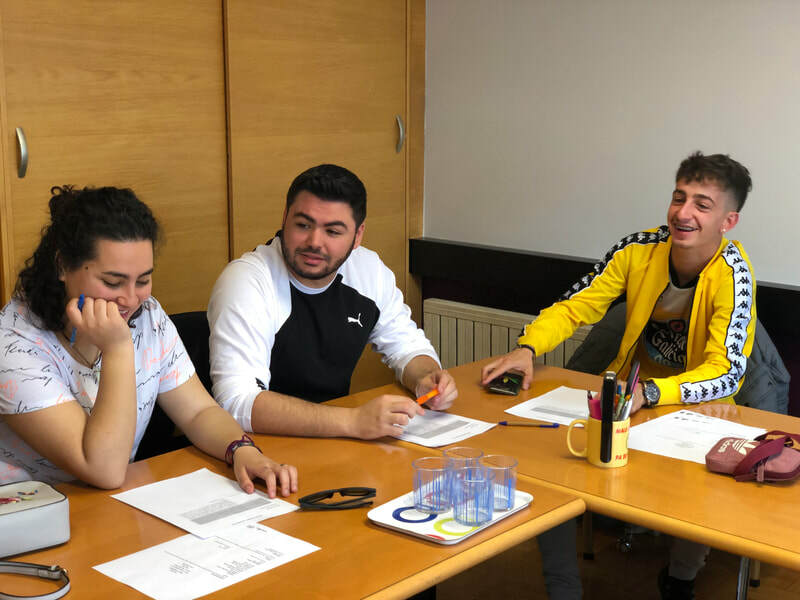 ​After ZNI providing the training of personal presentations and individual interview simulations, the participants were provided with work placements in organisations in the field of sports and sports events management. 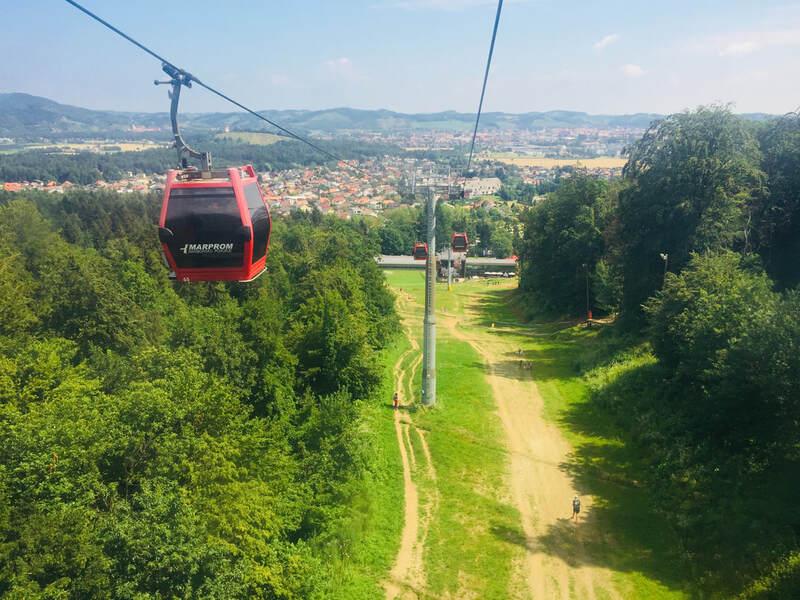 Some of these were the Maribor Cycling Network, the Maribor Dance Room, the Draš Hotel, the Ruše Sports Association, the Barada Sports Centre, the Terme Ptuj Swimming Club, the Leon Štukelj University Sports Centre, and the Bolero Dance School. ZNI also organised group visits to various organisations so the participants were presented with best practices from the field of organising sports activities and events. These included visiting the Mirno Morje Institution; attending the BMX Bicycle Competition and lecture in Maribor; attending lectures at the 1994 Maribor Aikido Club and the Branik Swimming Club, as well as a Bodifit Pilates Conference in Domžale and a workshop on sports events planning carried out by ZNI. R.E.S.E.T. project with Italian participants is working properly and students are learning how to organise sport events together with having some sport events by themselves! 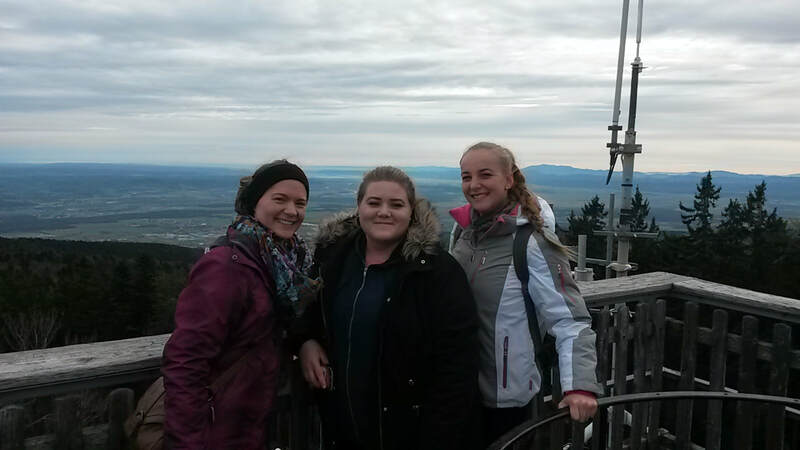 With ZNI's coordinators they have hiked Pohorje mountain, had a great work out and finished their trip with sledges. 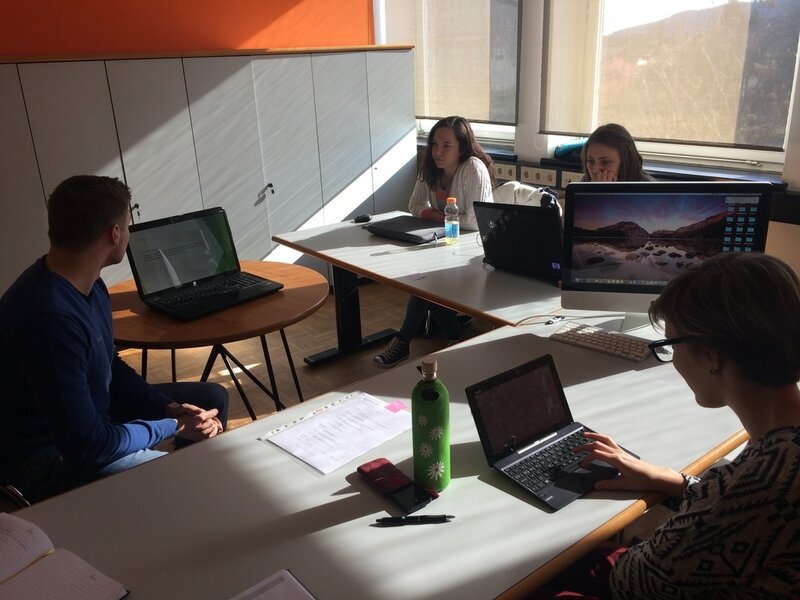 Participants are working in 15 different companies, which deal with sports around Maribor and neighbouring areas. Their internship will last until the 26th of September and during this time, high-school pupils will learn how to manage sport events on practice! 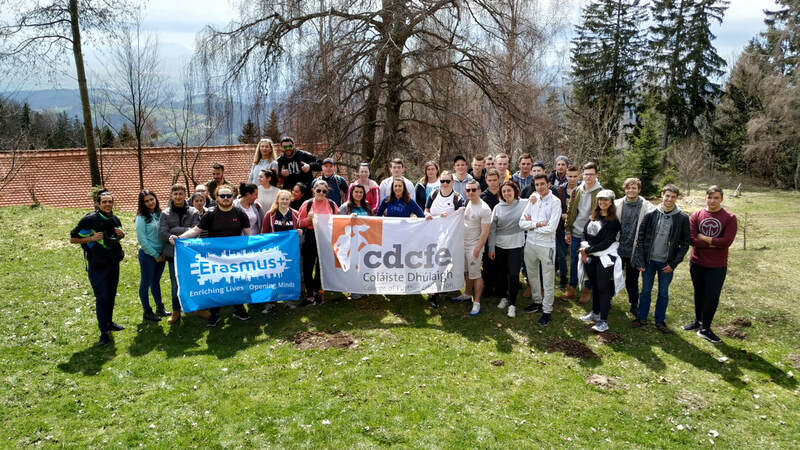 ponuja na voljo ŠEST PROSTIH MEST za mobilnost MLADIH DIPLOMANTOV z namenom praktičnega usposabljanja v tujini v okviru programa Erasmus+ in projekta Mobility for Enhahcement of Students Employability. 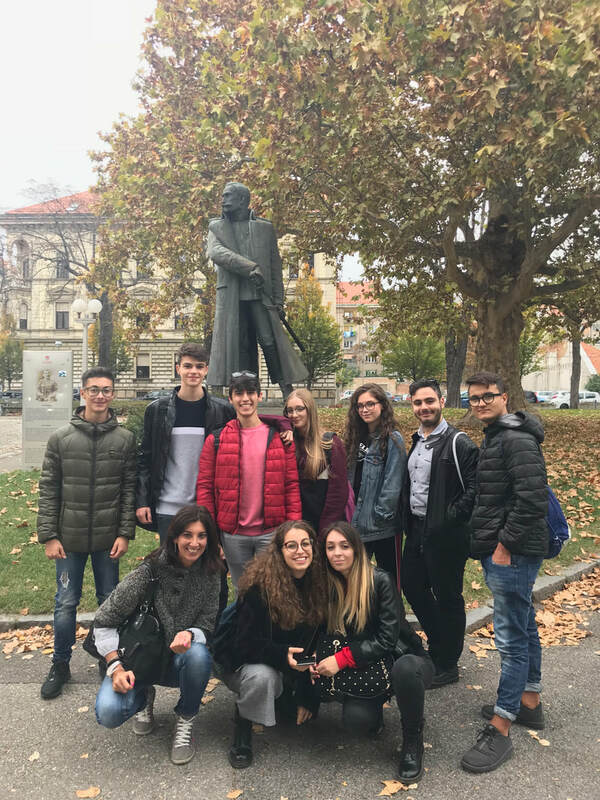 We are happy to announce that our new participants from Italy arrived safely to Maribor and we are ready to start R.E.S.E.T. project! 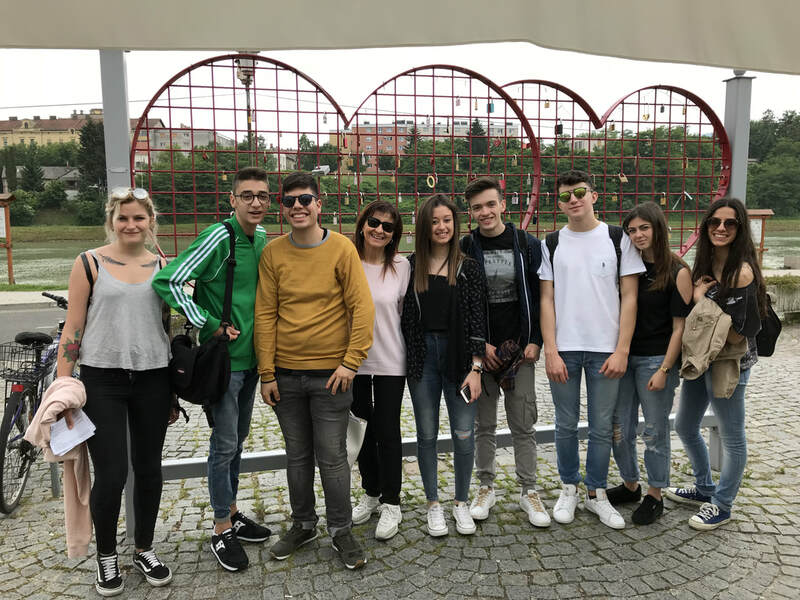 After acclimatisation and introduction of the city and Slovenia by our coordinators, pupils from Rome will start their internships in field of organising sport events. We wish them good luck! ŠE VEDNO IMAMO NEKAJ PROSTIH MEST za mobilnost MLADIH DIPLOMANTOV z namenom praktičnega usposabljanja v tujini v okviru programa Erazmus + in projekta Mobility for Enhahcement of students employability. At this moment we are hosting 10 students from Romania, Moldova, Croatia and Ukraine. They are having internships in various sectors and companies, such as tourism (“Globus”), marketing (“Minvos”, “Verus”), IT (“Oranža”) and others. Participants are involved in all aspects of day-to-day work duties of full-time employees. They are improving many interpersonal and communicative skills besides their professional abilities. Students are spending 2.5 months of mobility with great benefits for their future career. Na voljo je ŠEST PROSTIH MEST za mobilnost MLADIH DIPLOMANTOV z namenom praktičnega usposabljanja v tujini v okviru programa Erazmus+ in projekta Mobility for Enhahcement of Students Employability. 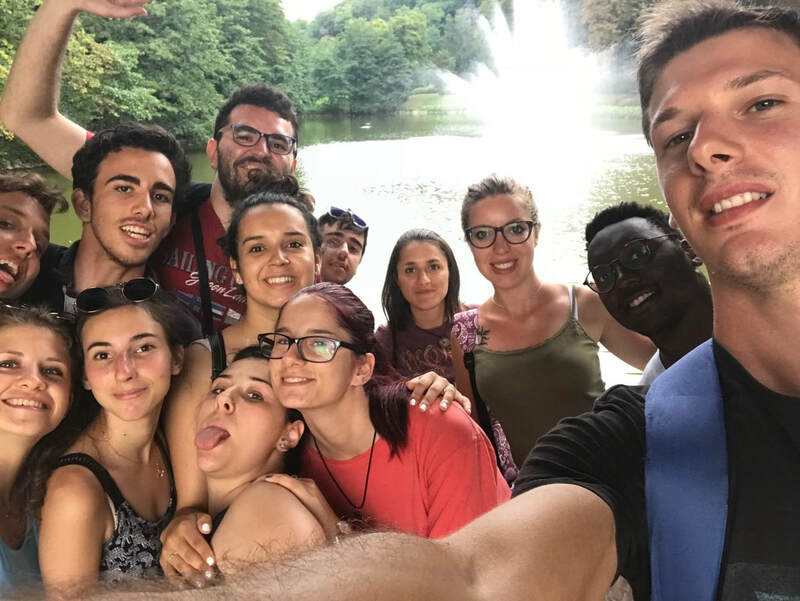 Last Sunday we have said goodbye to the participants from Italy, who have had a mobility from 19th of July until 2nd of August. 18 students supported by 2 tutors had an amazing two week long mobility, full of new experience. Working in different fields, such as hairdressing, beauty treatments operations, mechanical operations etc. they have shown positive attitude and desire to develop their professional and interpersonal skills. 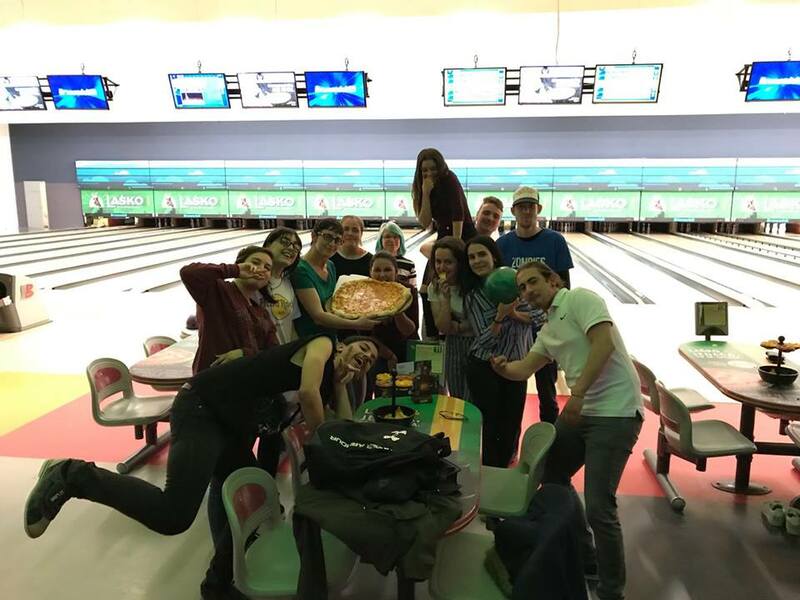 Despite being here for a short period of time, students trained and improved significantly, which is important for a future career abilities, among which are intercultural communication, respect and acceptance of working culture of the companies, team-working and many others. 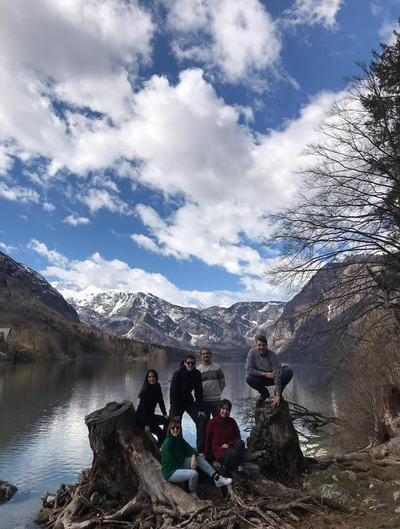 We have proved one more time, that even small changes, stepping out of one's comfort zone, such as this experience of Italian students in Slovenia, can bring so much benefit and positive feedback to everyone in mobility programmes. Zavod za Novodobno Izobraževanje (ZNI), Slovenian partner in EU project MOB G.A.E. is inviting you on presentation: MOBILITY AS AN OPPORTUNITY TO GAIN NEW EXPERIENCES ABROAD. Management of training programs and system of quality assurance introduced by ZNI Institute have been successfully evaluated and awarded with Quality System Certificates MiQ for Professional Practices (MiQ015) and Workplace Trainings (MiQ014), both valid through year 2017. Our management systems and quality assurance are in compliance with MiQ Quality Certificates as assessed by Minvos Network. ​The MOBGAE project, sincerely updates the newest information for you to become first person to be inform, we therefore kindly require to visit the website of MOBGAE @ http://www.mobgae.eu for more information. 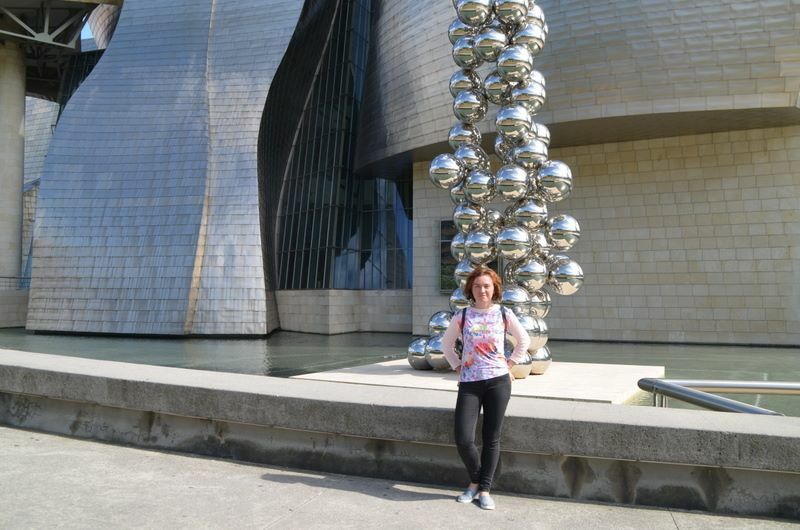 As a member of ZNI team I spent 2 weeks on a work practice in Bilbao, Spain. I was working in Novia Salcedo Fundación which is a organisation open to the world and operates under principals of excellence and transparency. They have been building bridges between businesses and young graduates for 35 years to facilitate their access to their first job. Currently their main focus is International Campaign for Youth Employment Decade 2013-2016. The final objective of this Campaign is that the United Nations General Assembly declares 2016-2025 as a ‘Youth Employment Decade’. During my stay in NFS I was responsible for searching organisations that could join this call and help to achieve their goal. I am really grateful for this experience which showed me how familiar organisations as ZNI are working in different environment. I could saw and compare theirs and ours good practices and think about which areas we can work in together. 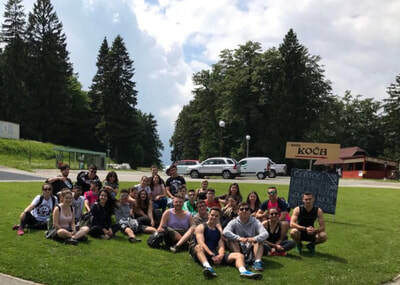 Zavod za novodobno izobraževanje represents Slovenia in project called MOB G.A.E., which stands for mobility as a source of personal and professional growth, autonomy and employability. The project is promoted by a consortium of 18 partners, representing 14 different countries. 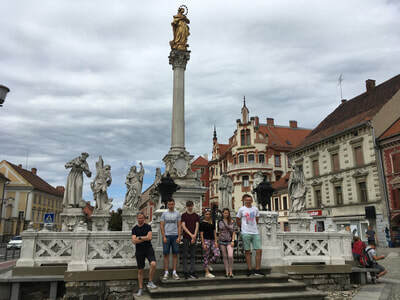 ​Within the framework of this project all partners performed joint event called flash mob, in the main square in Maribor. 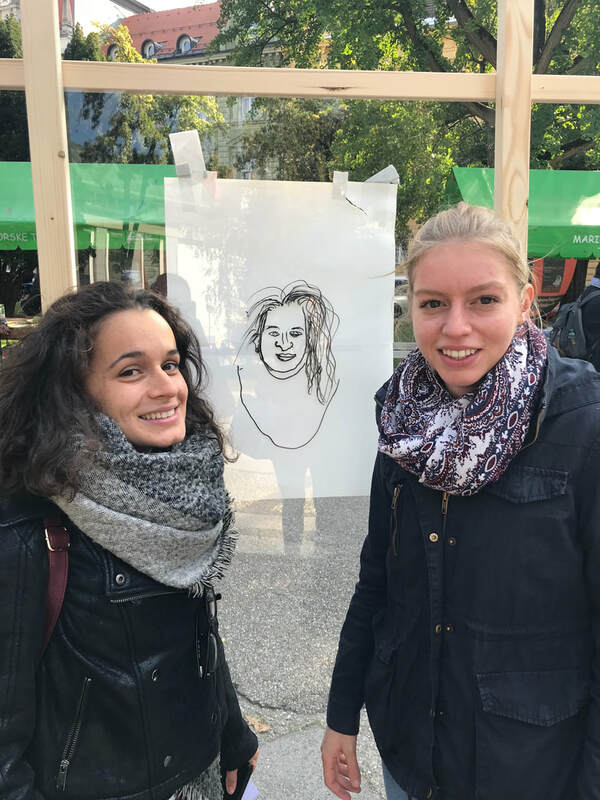 This event was realised on 9th of May (Europe day) by ZNI, with the help of Erasmus students. The purpose of the event was to promote awareness of Europe and the European mobility programs. The main message was: move to learn, move to grow, eu go! All the participants enjoyed performing it and, beside having a great time, this was a great opportunity to spread the awareness of mobility as a way of exchanging knowledge and experience in international environment among individuals, organisations and society. 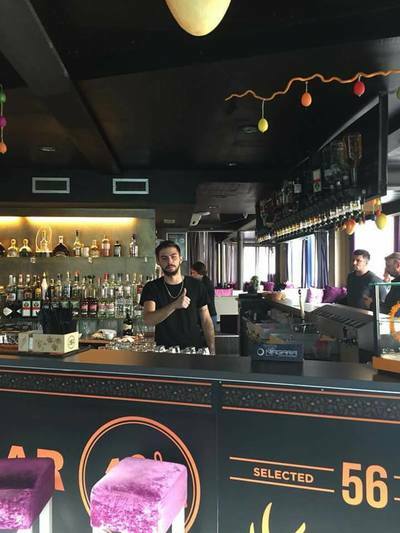 Objavljamo 2 prosti mesti za mobilnost zaposlenih s področja hotelirskega in termalnega turizma. Več informacij o projektu najdete v priloženem dokumentu. Za vse ostalo smo vam na voljo tudi na telefonski številki 040 436 839 (Sonja Markič). 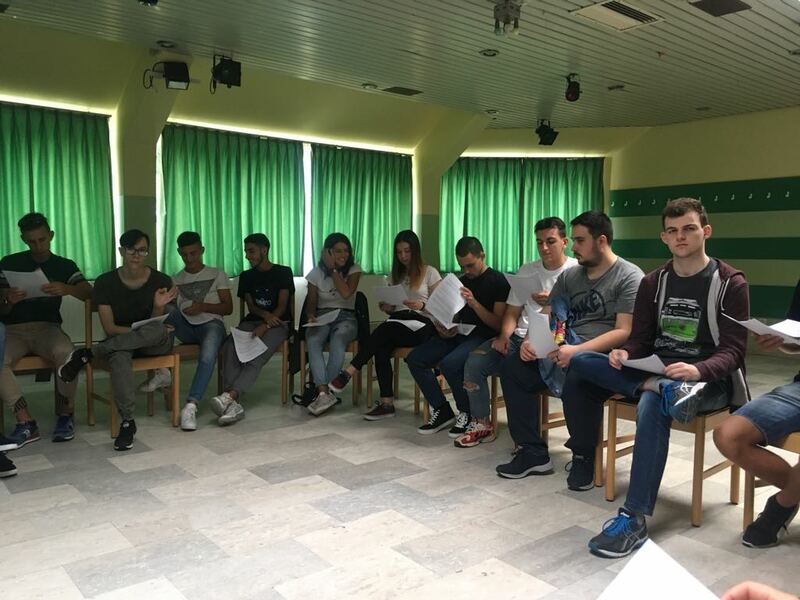 Zavod za novodobno izobraževanje is taking part in European project called MOB G.A.E. 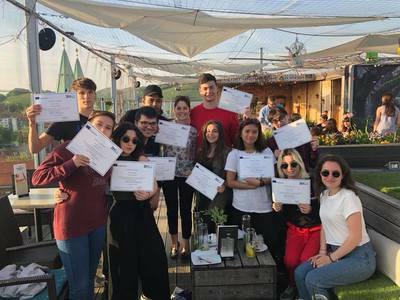 The main aim of the project is to evaluate and disseminate the impact of international mobility experiences on personal and professional development, employability, autonomy and awareness of European citizenship. The following events were opportunity where we had time to shortly introduce MOB GAE project and its results. 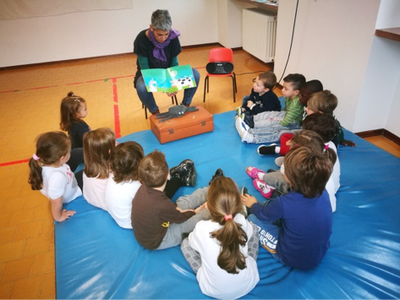 MINVOS is a network of educational NGOs in Slovenia. 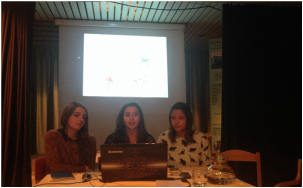 They held a project the purpose of which was to present the importance of informal education. Zavod za novodobno izobraževanje prepared power point presentation where we presented a project MOB G.A.E. and positive effects of mobility programmes. 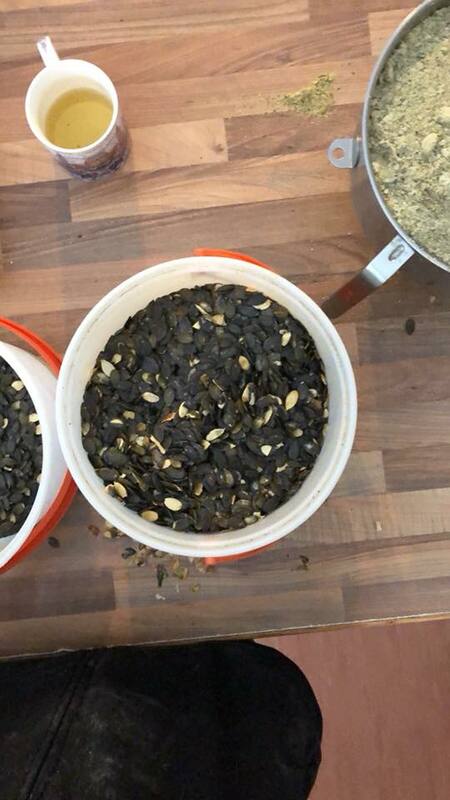 The aim of the project was activating young people to add changes in the way of living and thinking to become more active citizens. 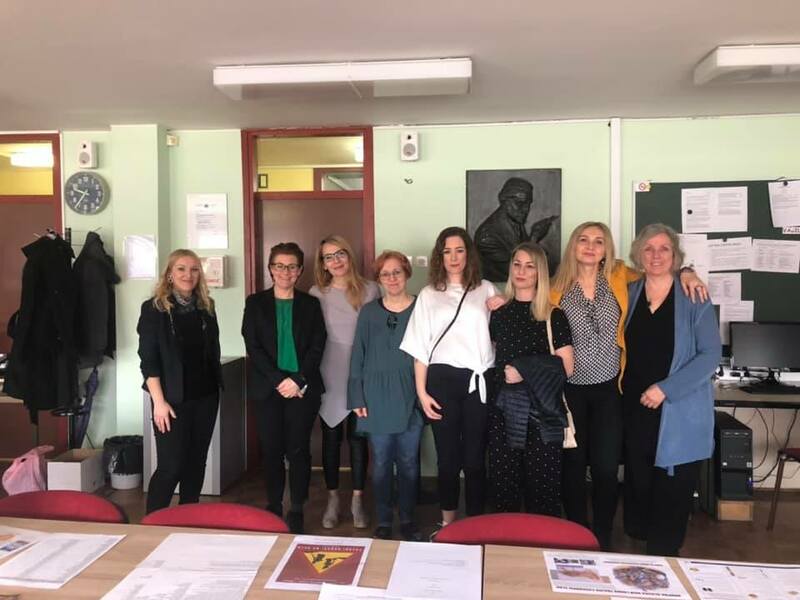 Part of the project was dedicated to mobility programmes where Zavod za novodobno izobraževanje presented MOB G.A.E and results of the research. Participants from Italy, who are developing their skills in the filed of project management. Participants Giuditha and Giulia are part of the project called "Proactors - actors in the development community and youth policy” and have work practice in MINVOS d. o. o. and Mladinski kulturni center Maribor, where they are responsible for organising events and workshops. 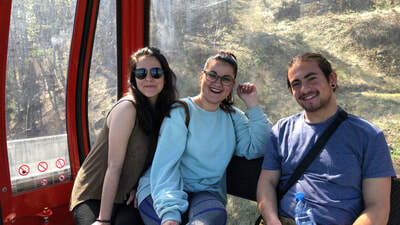 Noemi, Constanza and Irene are participants from the project Green Promoters - field of ecology, agriculture and renewable energy. They have their work practice in Komuna project d. o. o., Institute for water and Association - Ecologists without borders. 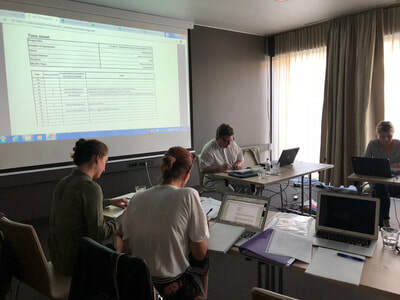 Participant from Poland, who became part of ZNI team and is responsible for administrative and operational work and assists us in the field of project management and coordination of activities. 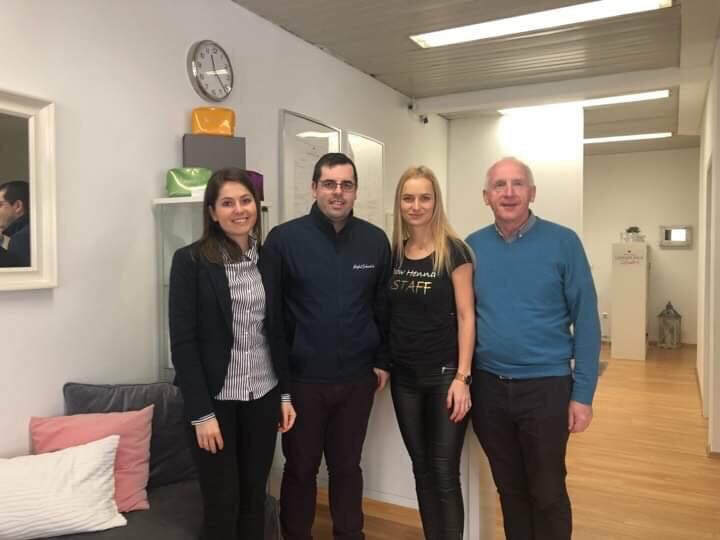 We are constantly developing partner network in different sectors and there is a new group coming from Finland, whose participants will do work placement in Safety and Security companies. On 14 of March 2015 the Institute for New Age Education celebrated its 10 anniversary of establishment. Behind us there is 10 years of hard and dedicated work, resulting in more then 500 mobilities and exchanges. Anniversary was marked by the surprise of our colleagues who have decorated the office with pictures of our participants. They have asked candidates to submit their pictures from work placements and thoughts about what mobility means for them. It is a great reward for us to see how our participants are growing and achieving their personal and professional goals. 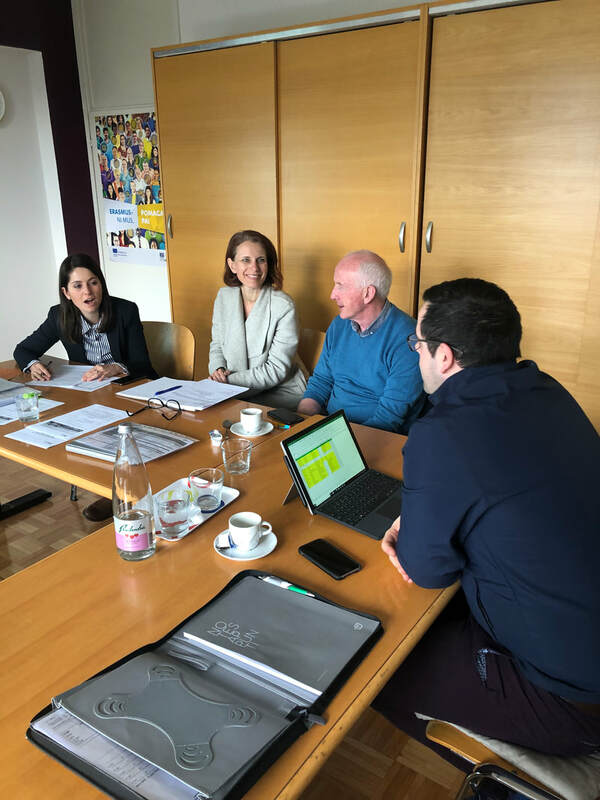 We hope to make our next 10 years even more successful, with more mobilities and exchanges, which will help our participants achieve must-have job skills, personal attitude and at the same time to contribute to the growth and development of the companies.